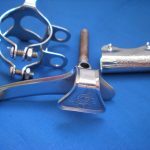 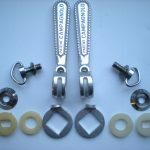 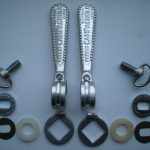 the sprung cable clip, chain hook, dogbone skewer wingnuts & open C lever to match rear, the 3 Campa clips for the covered gear cable. 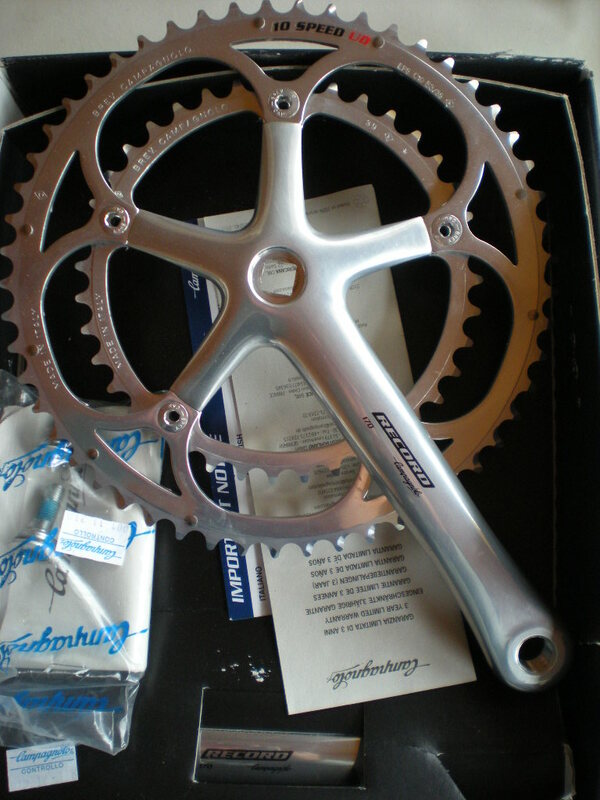 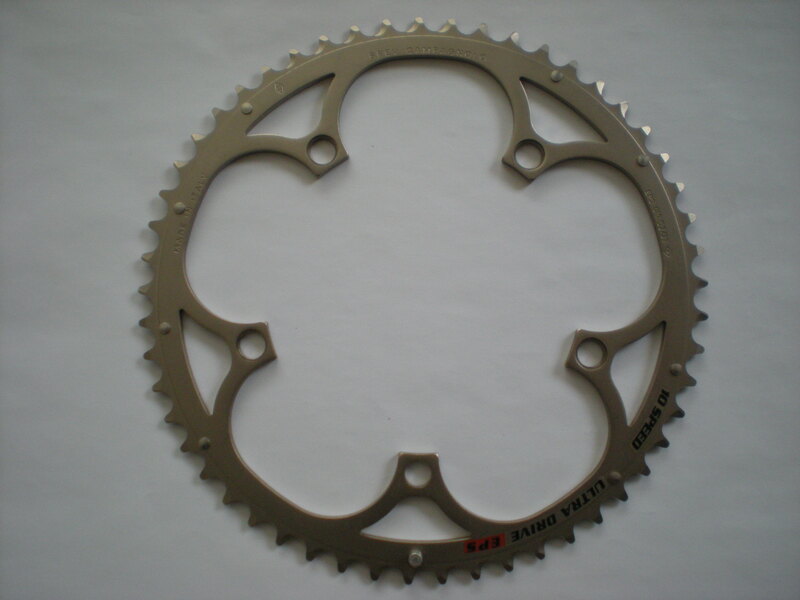 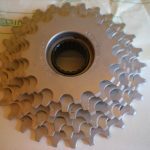 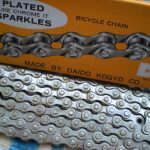 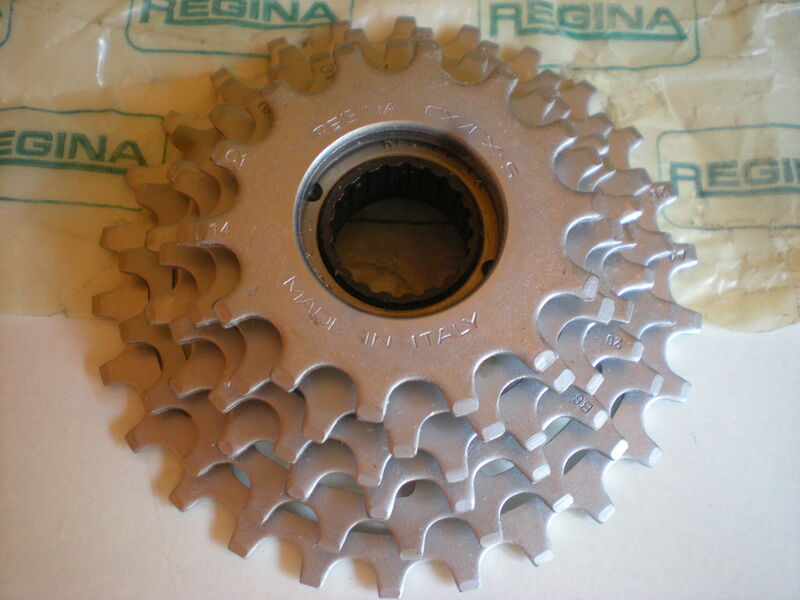 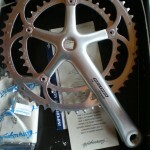 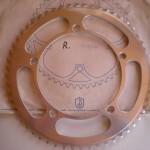 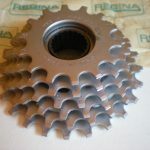 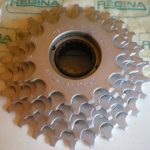 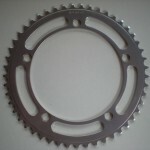 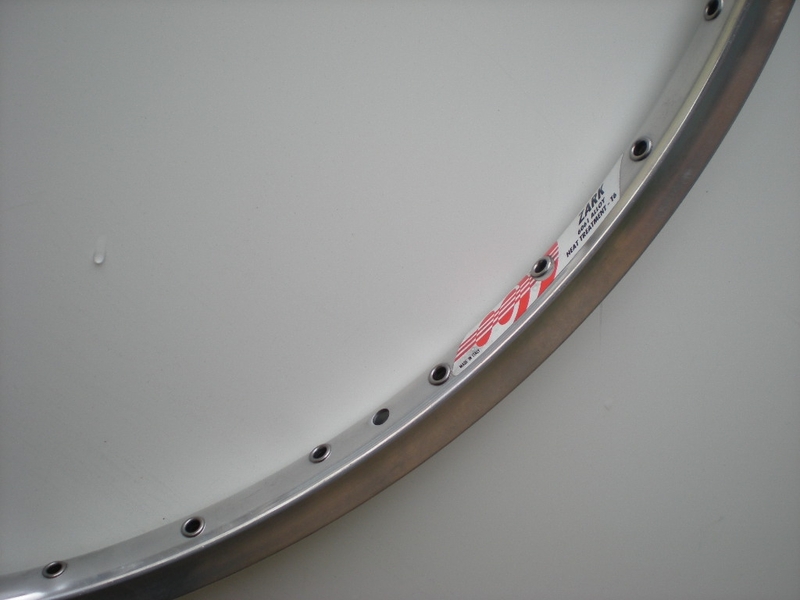 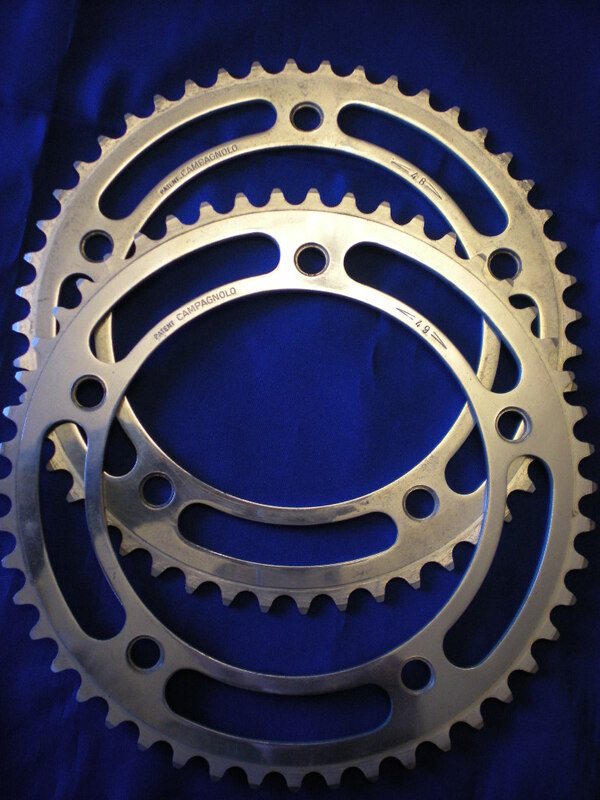 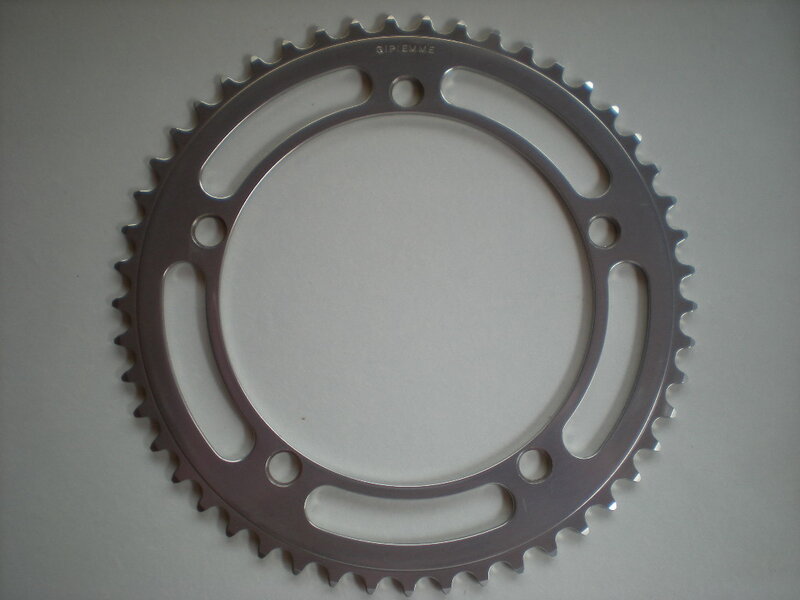 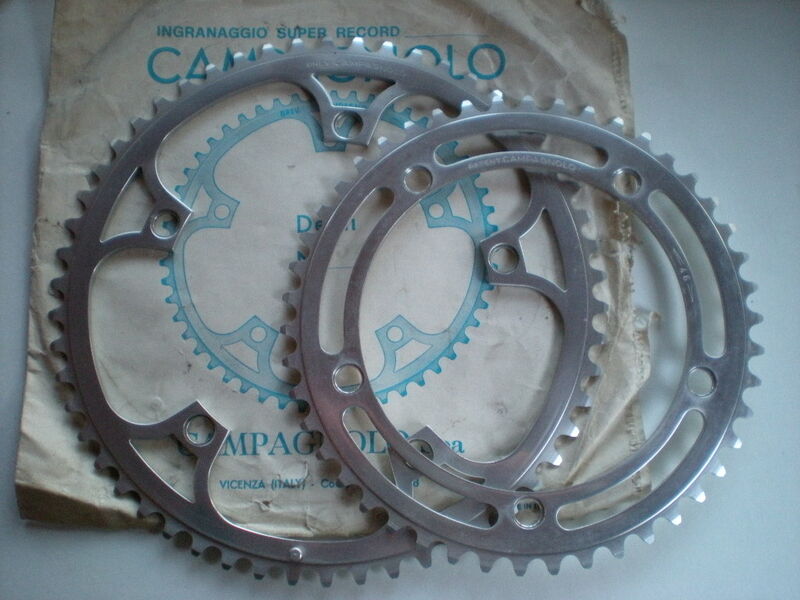 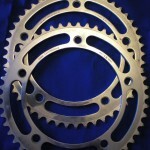 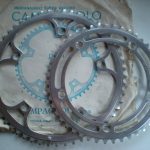 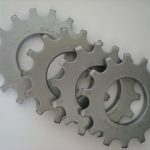 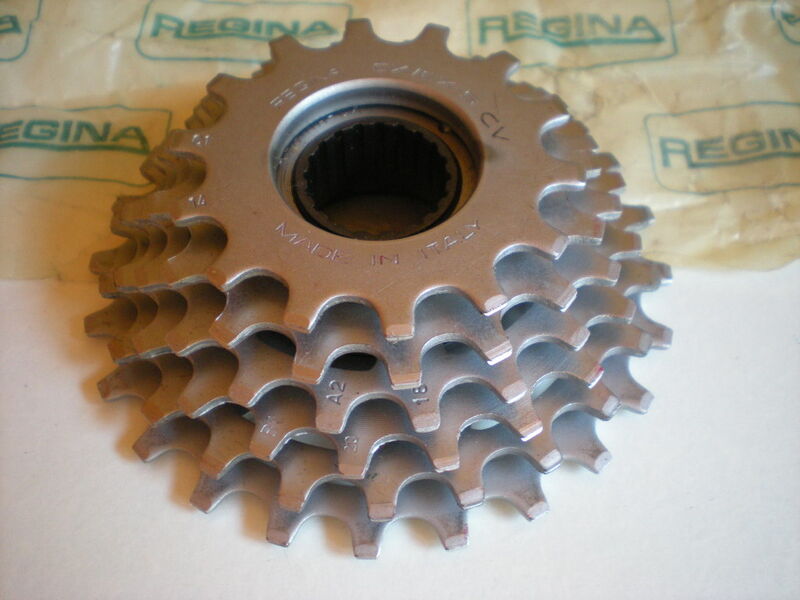 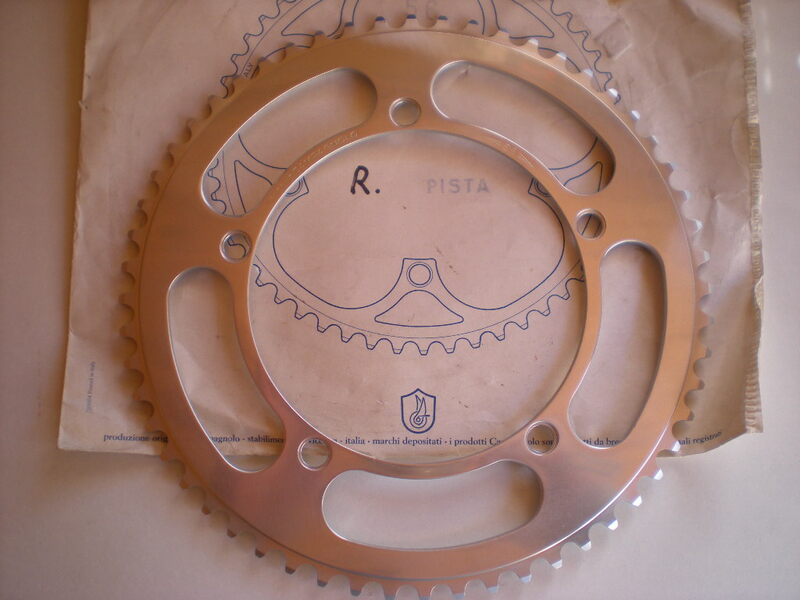 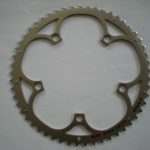 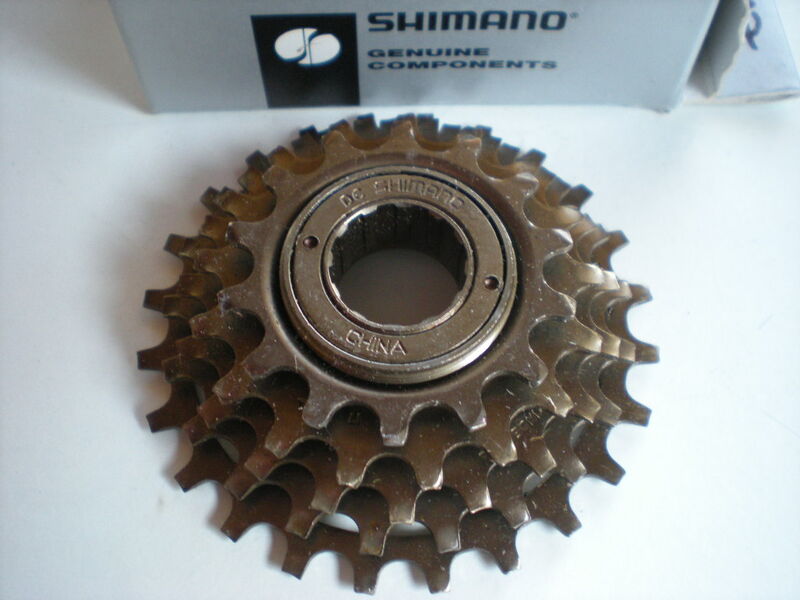 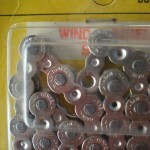 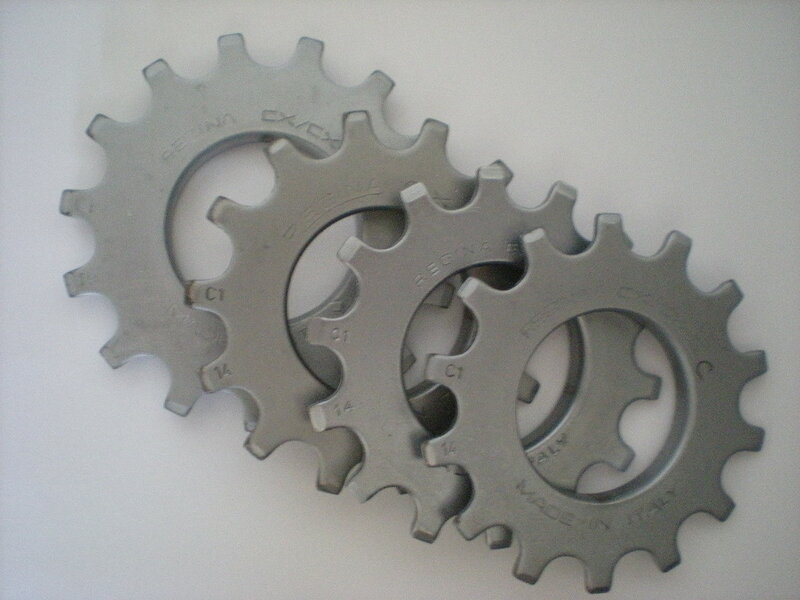 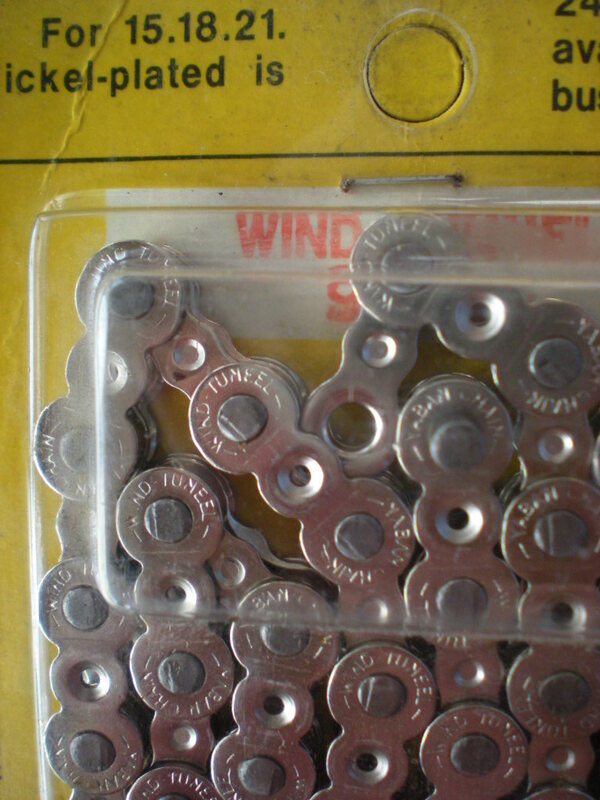 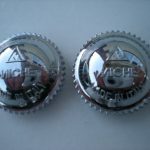 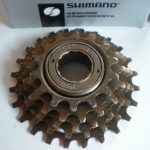 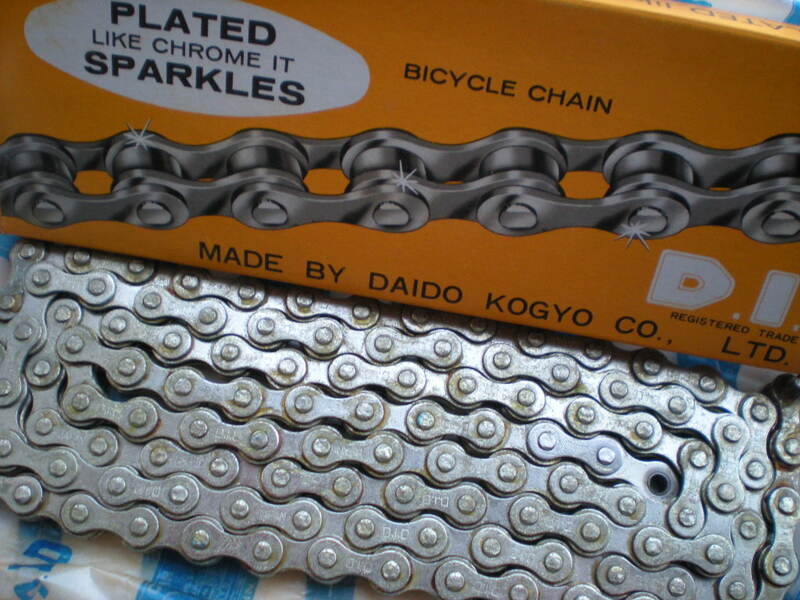 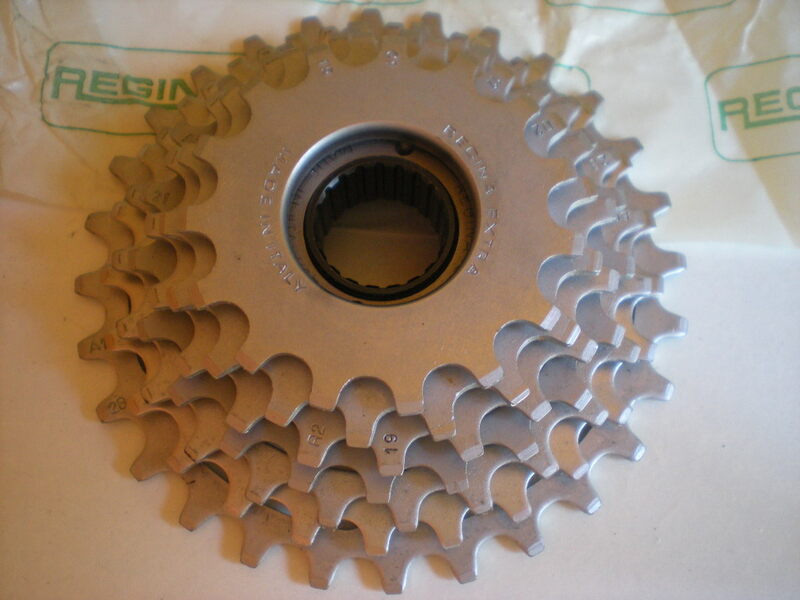 Chainring: 144 bcd 56t x 1/8″ PISTA -reinforcing shoulder below the teeth, for motor paced events? 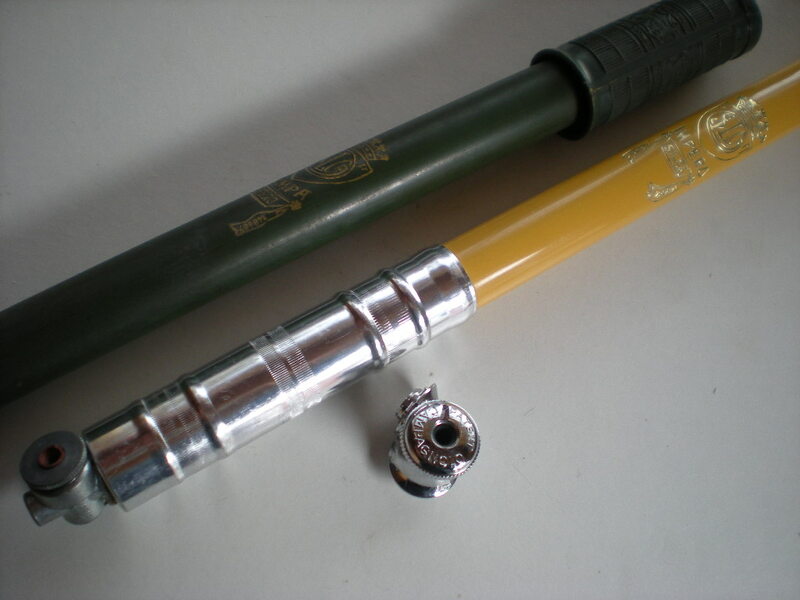 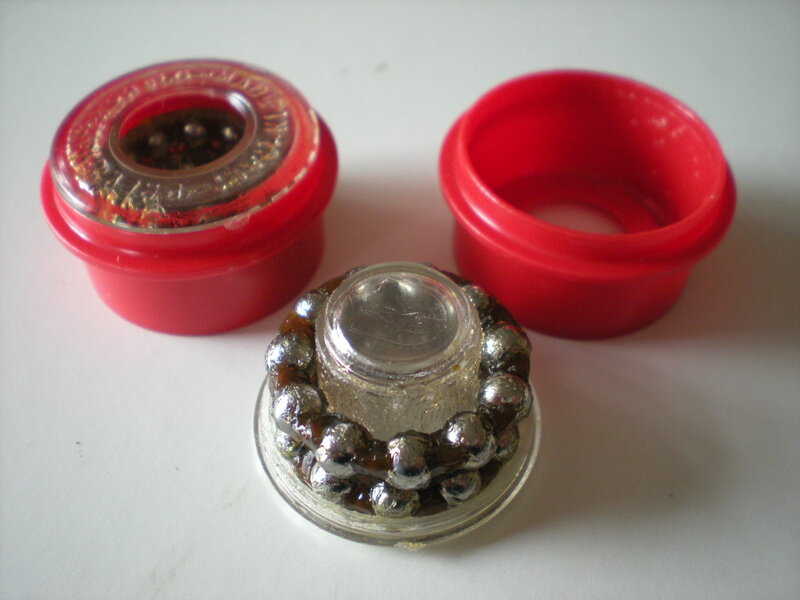 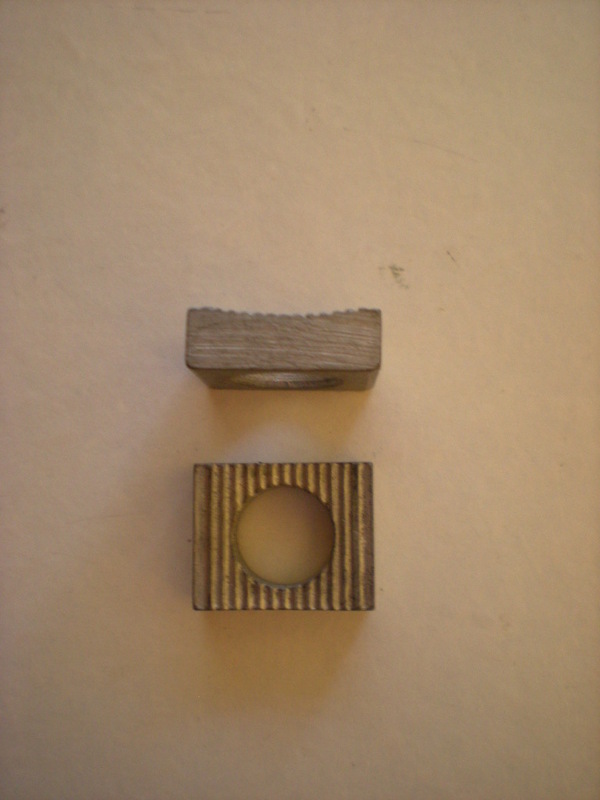 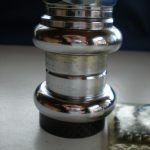 front has raised centre/oiler clip on barrel; may be Euclid? 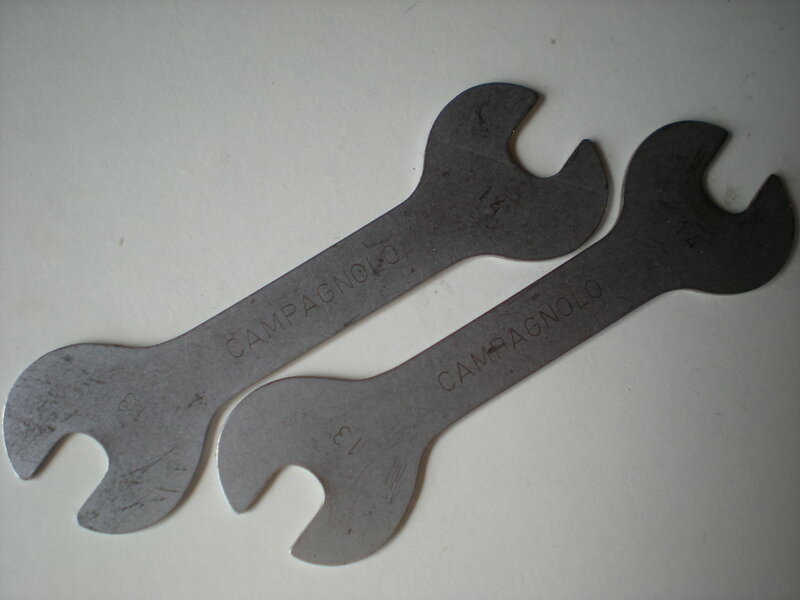 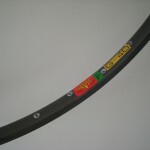 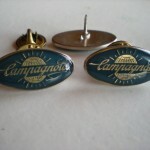 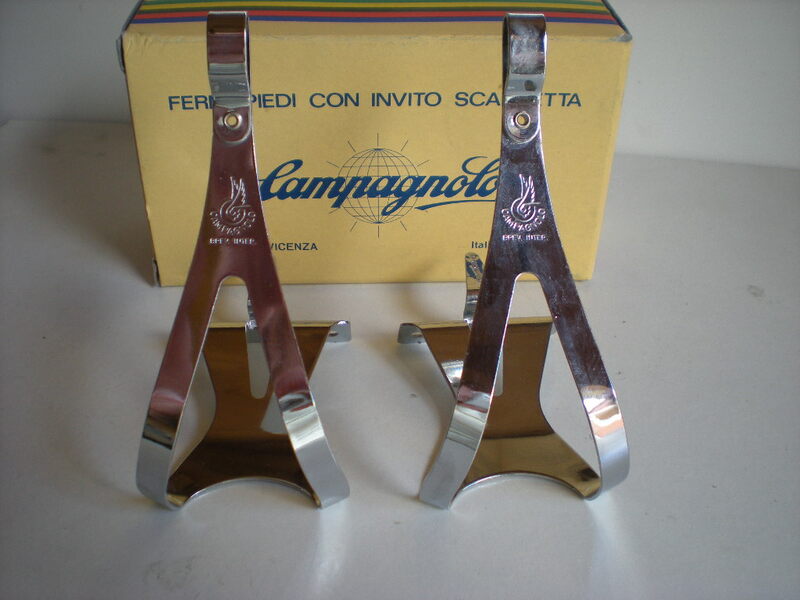 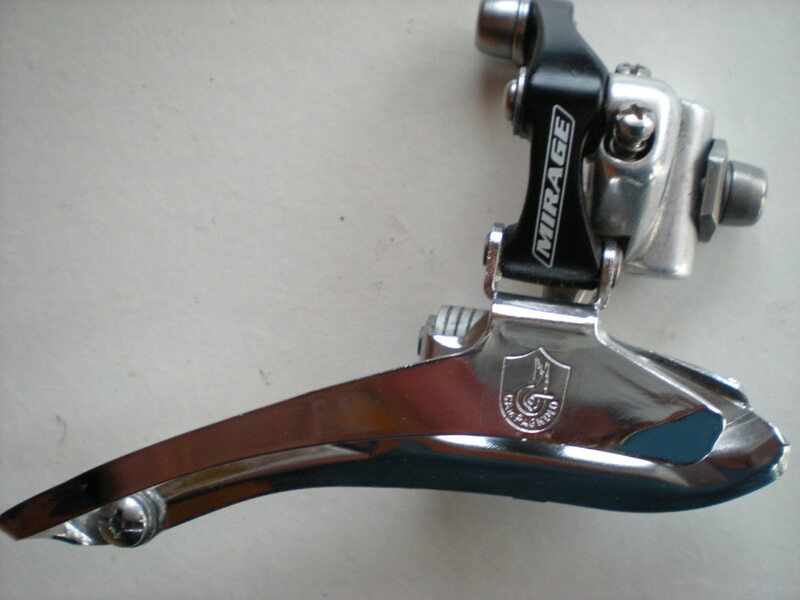 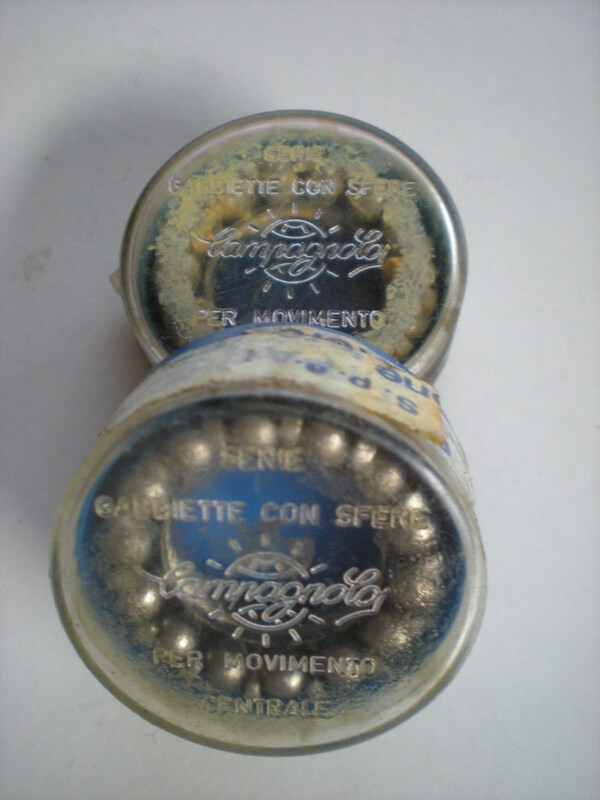 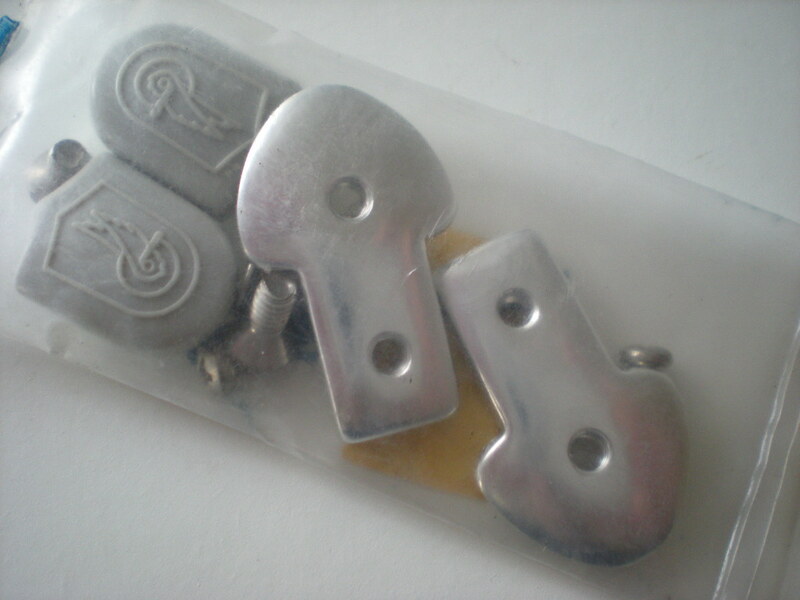 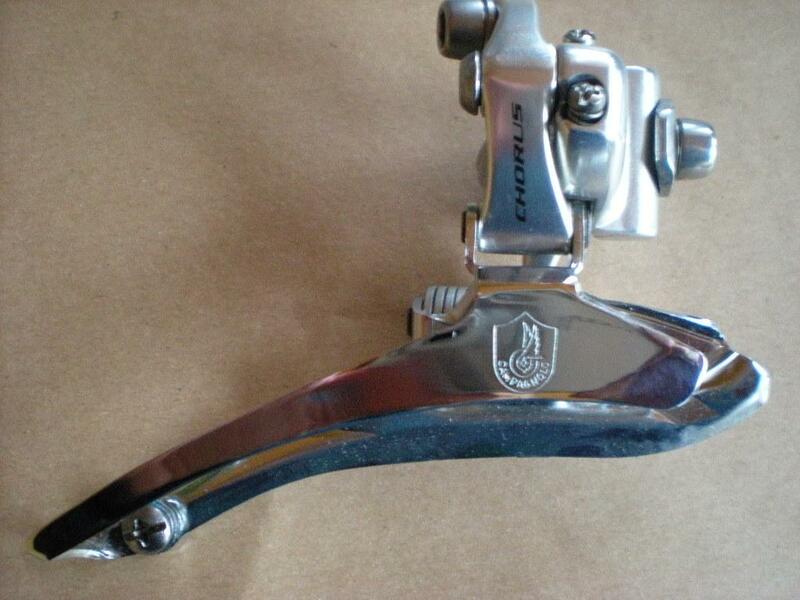 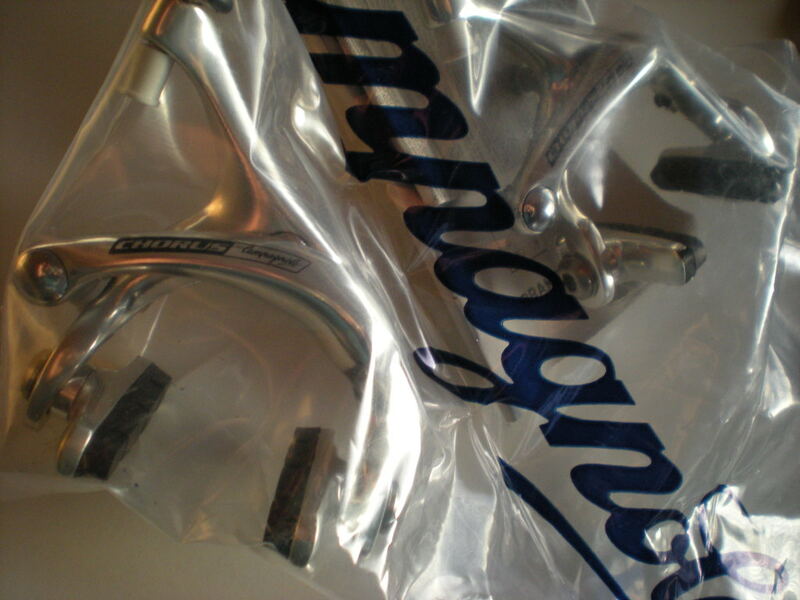 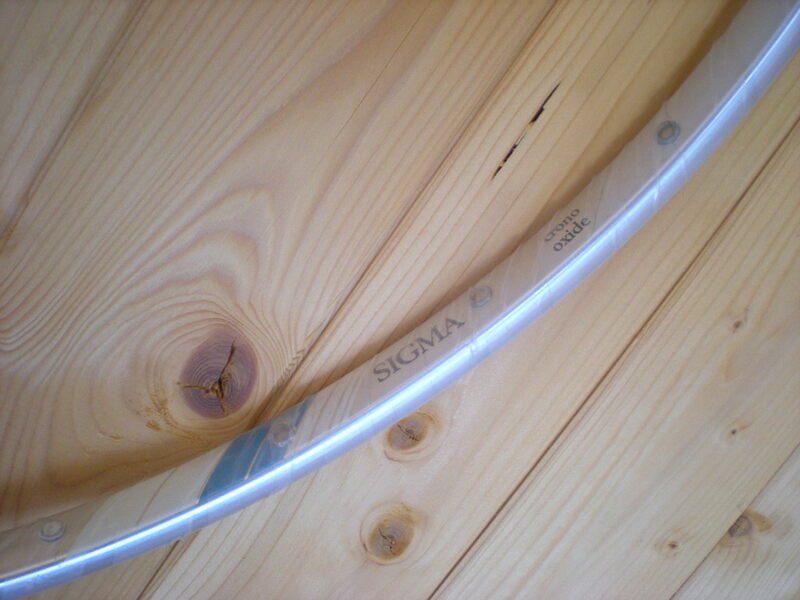 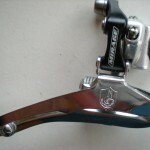 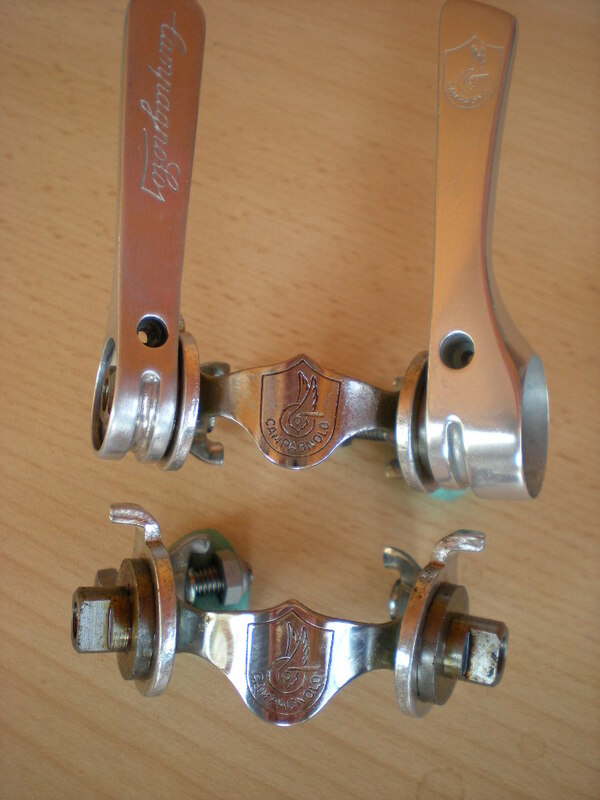 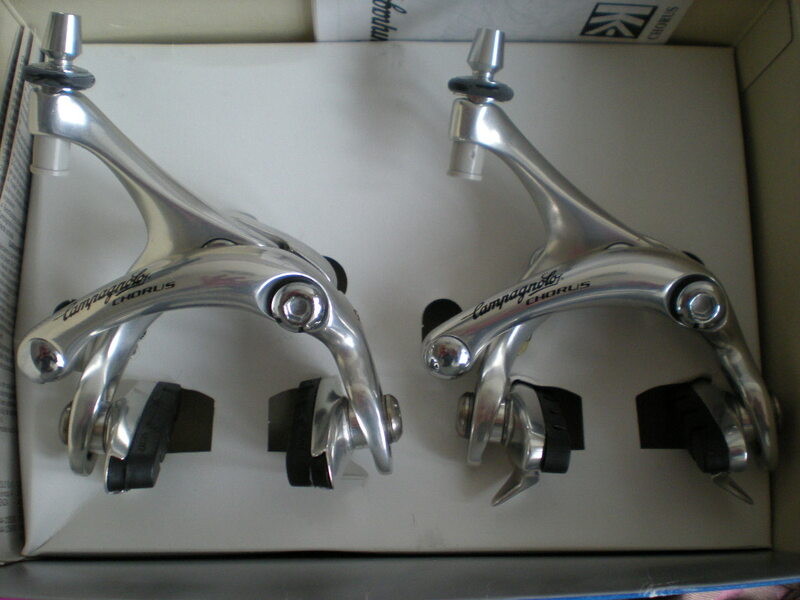 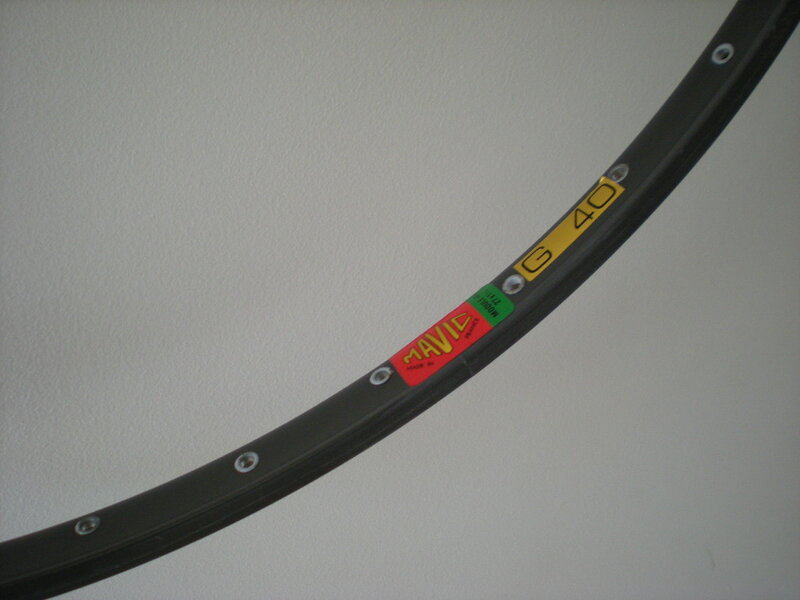 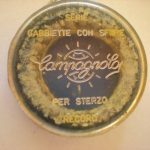 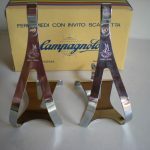 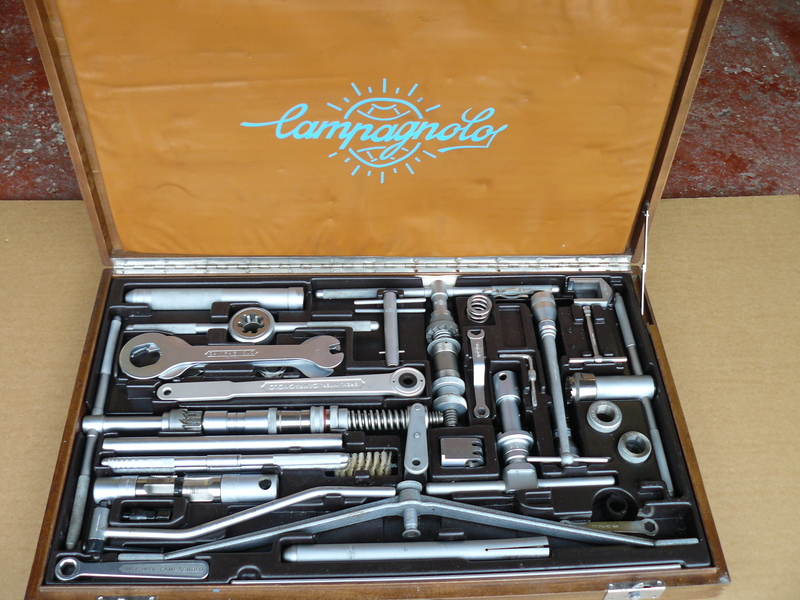 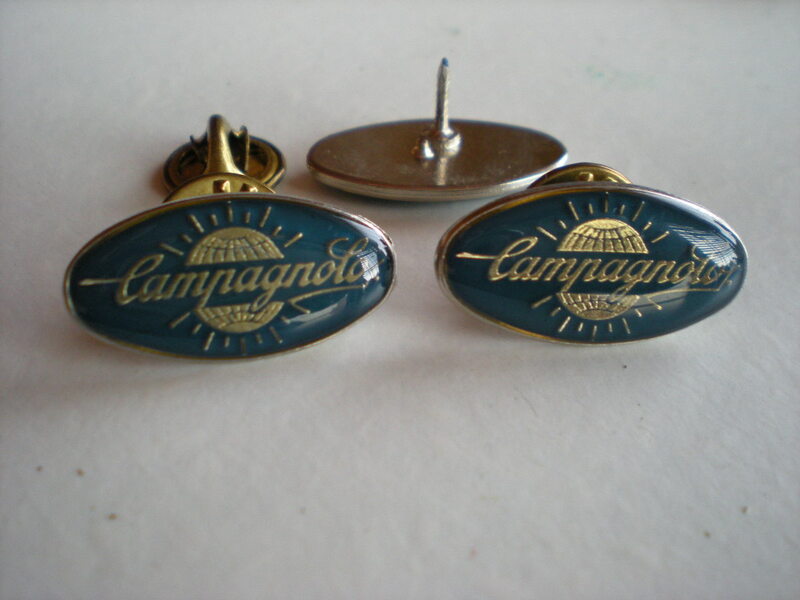 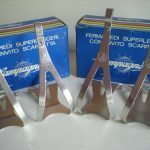 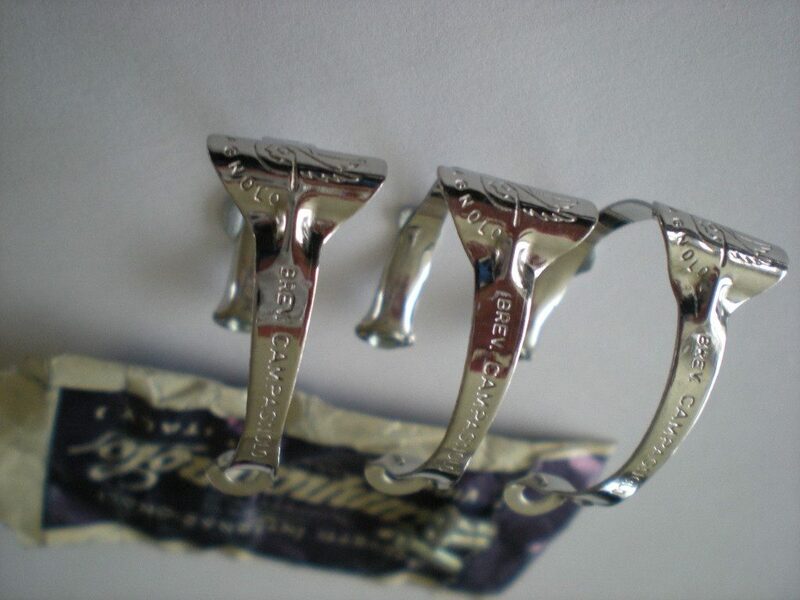 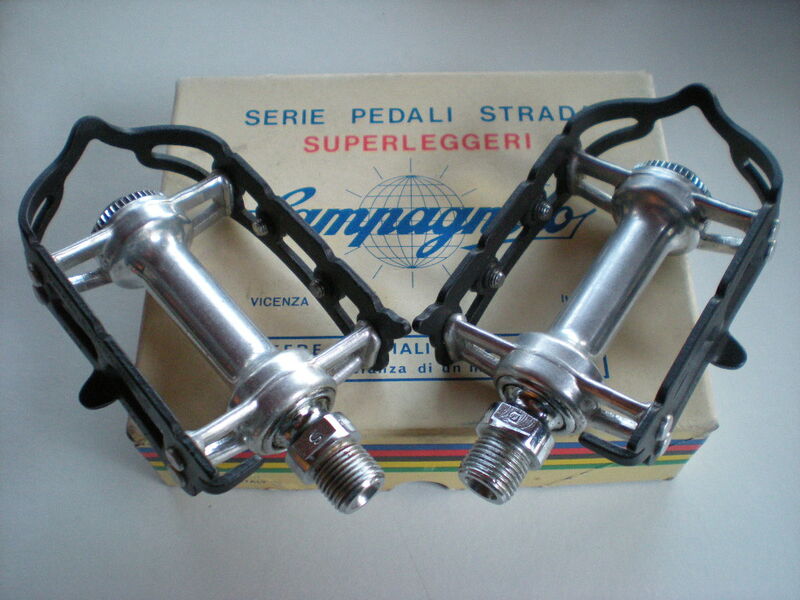 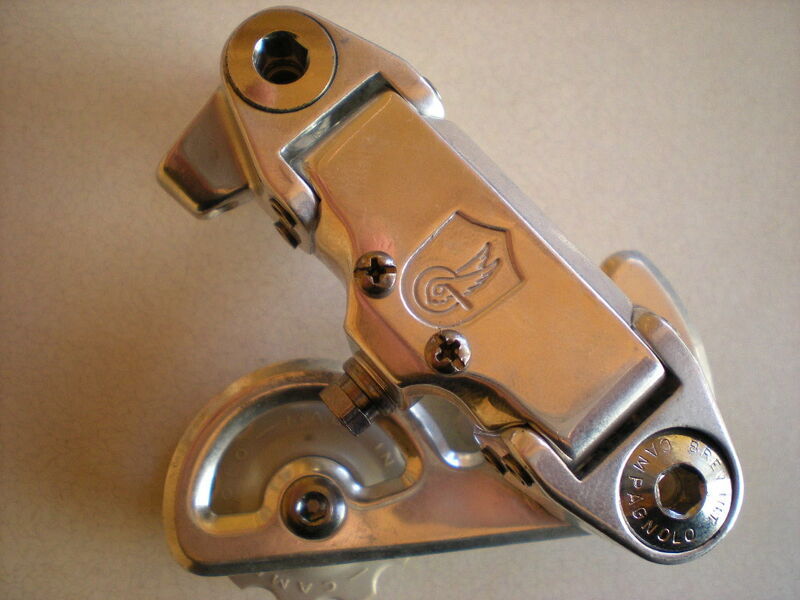 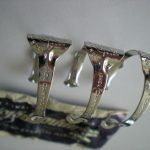 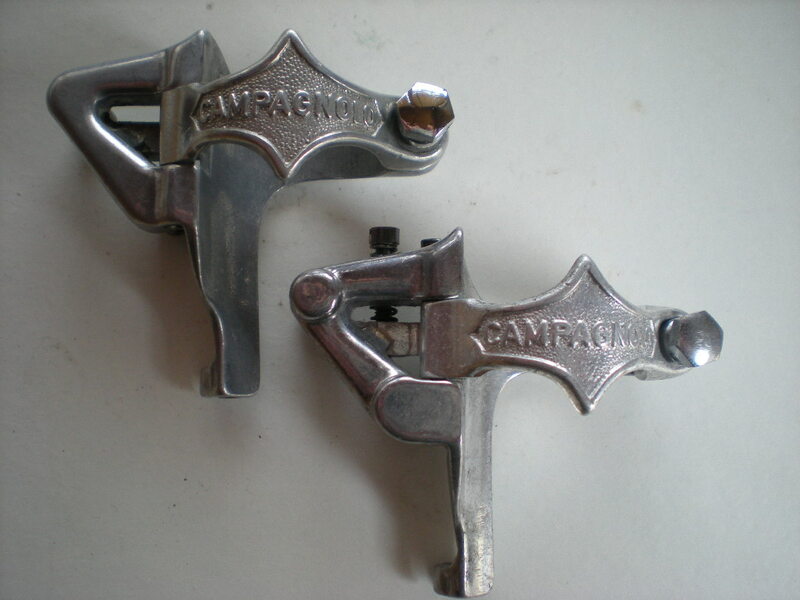 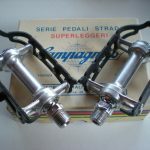 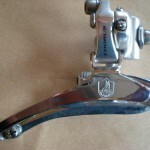 Campagnolo Sigma 7075 dark 36h decals as 1995 cat. 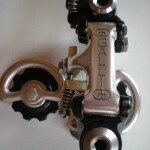 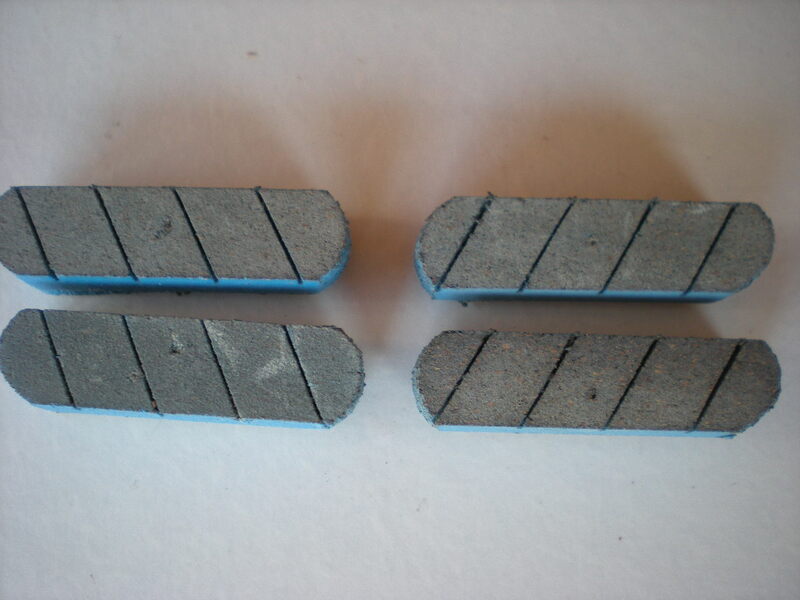 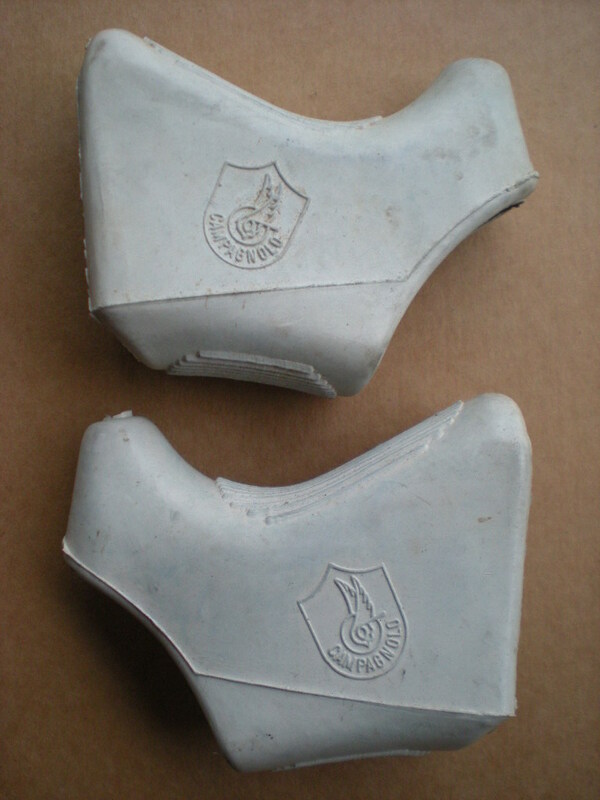 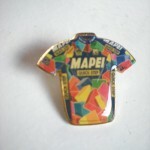 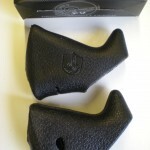 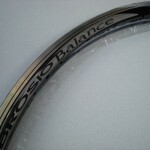 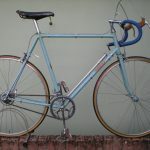 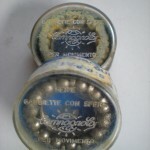 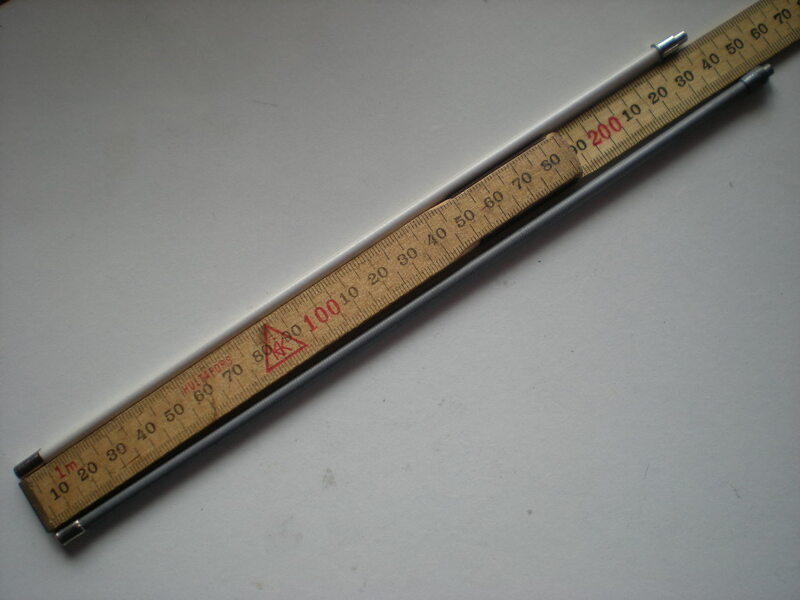 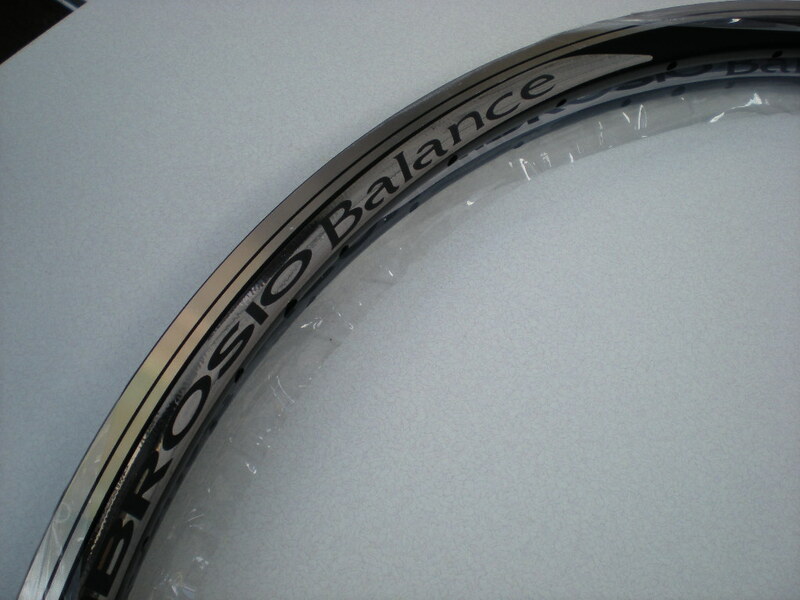 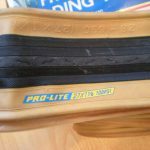 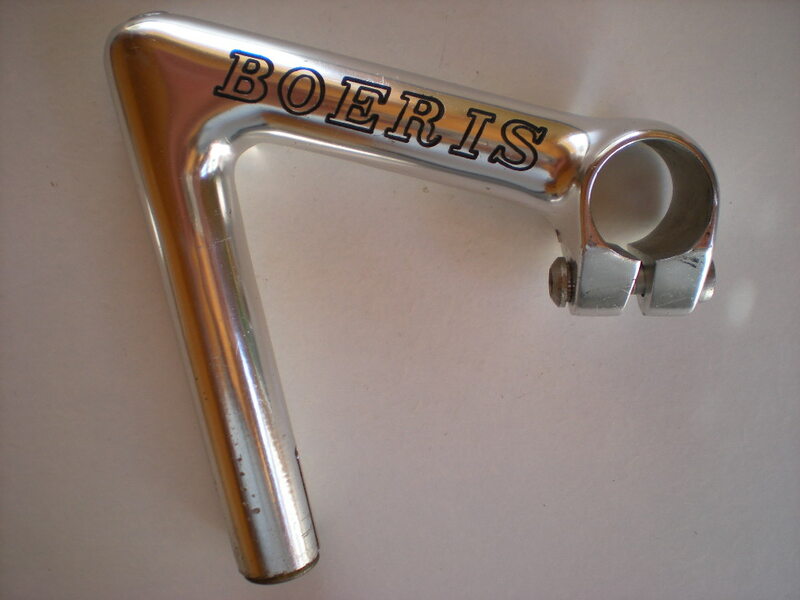 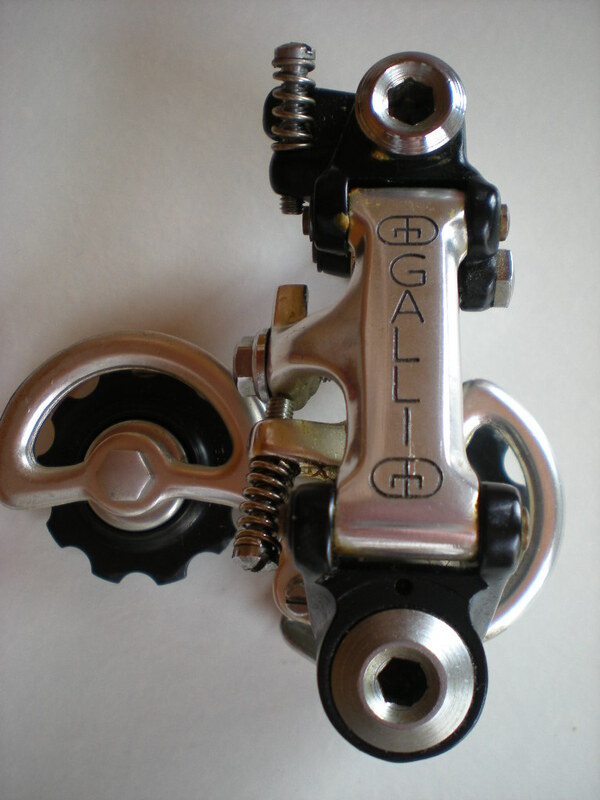 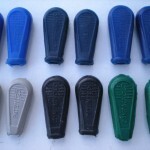 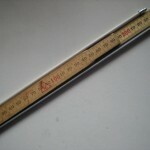 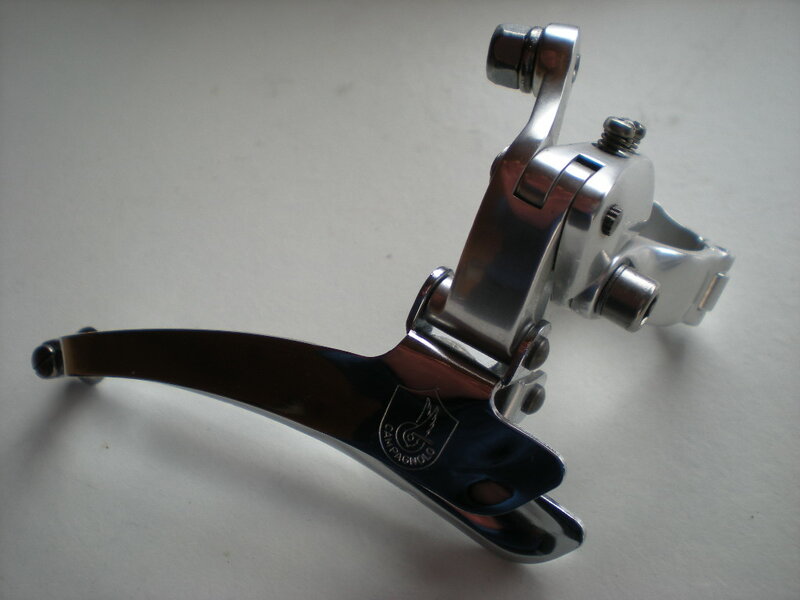 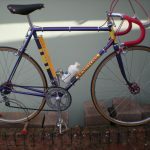 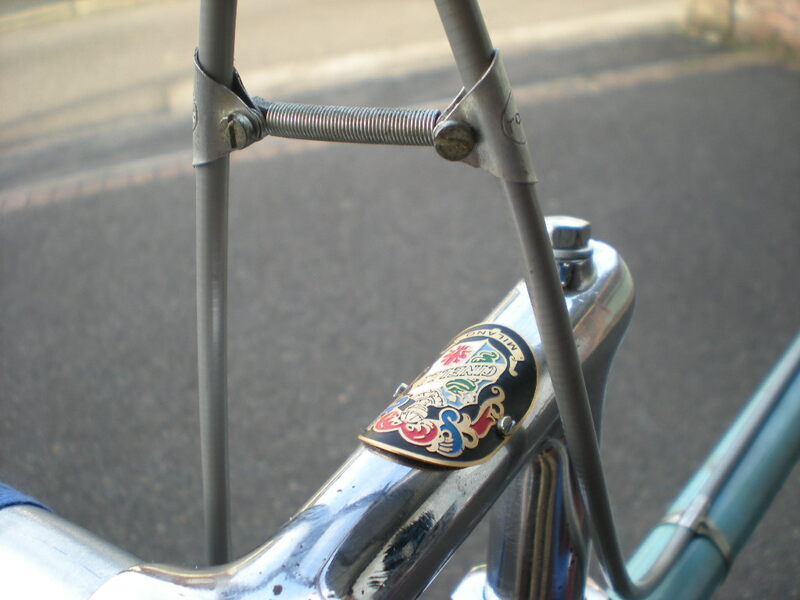 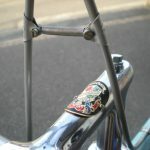 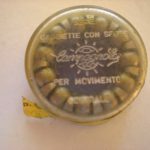 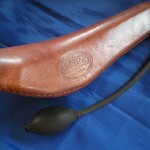 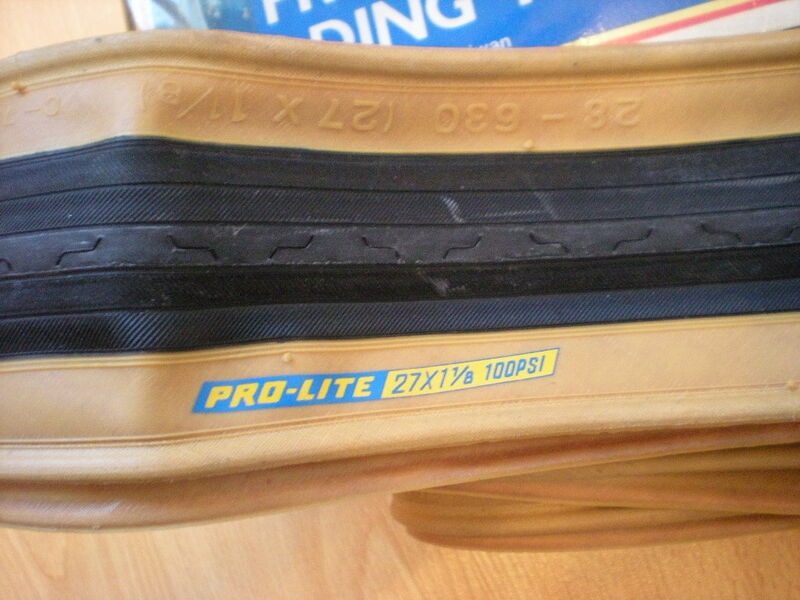 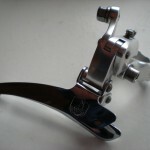 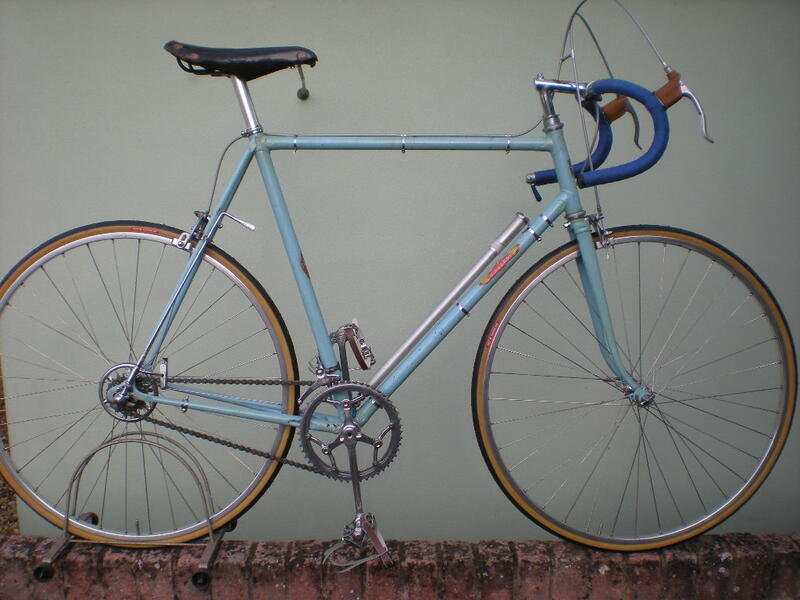 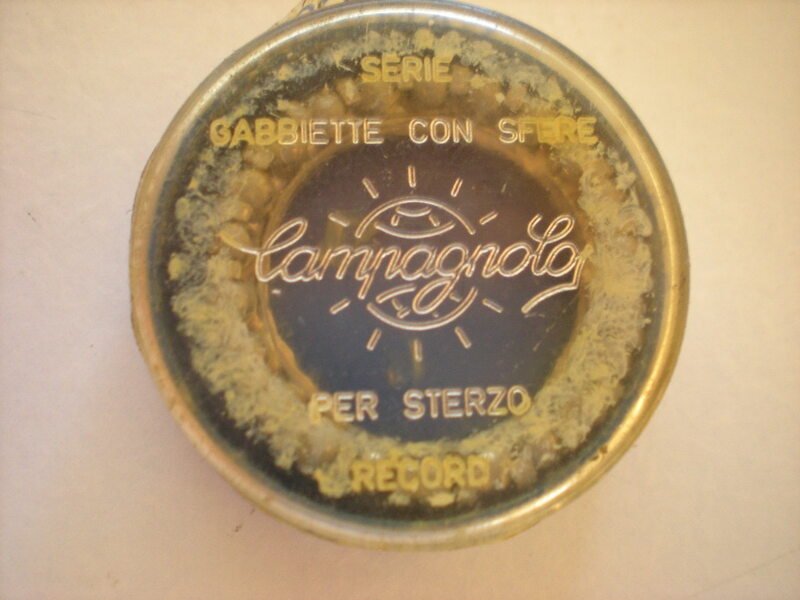 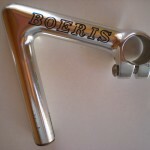 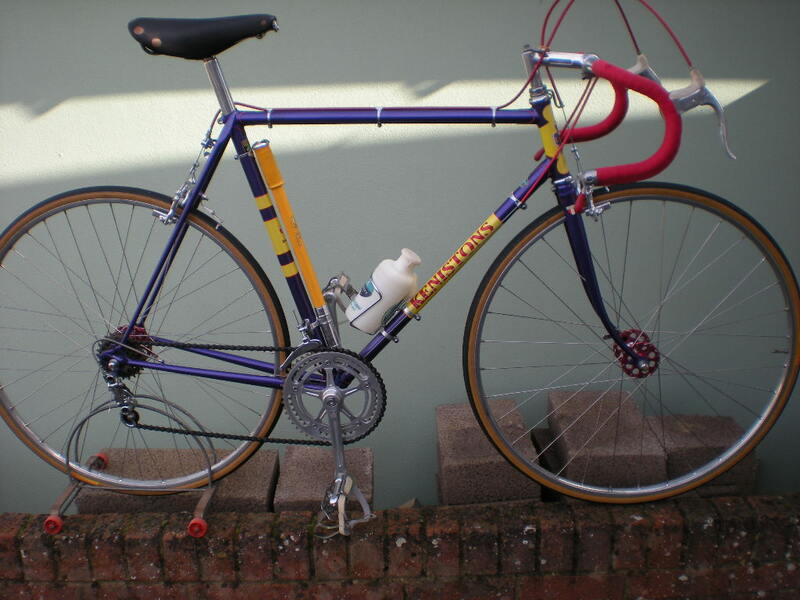 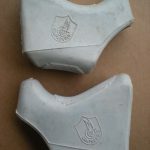 I had a Gios Professional that used this type, must be other brands out there? 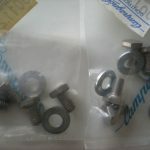 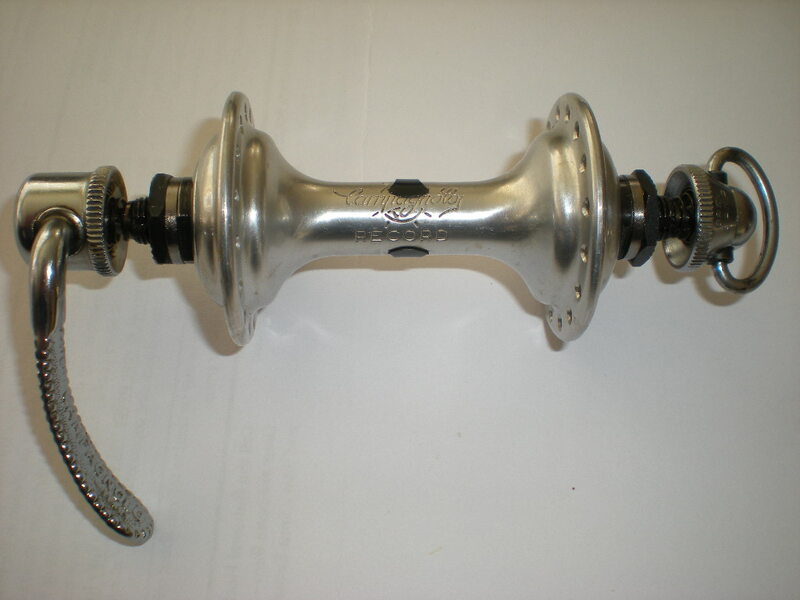 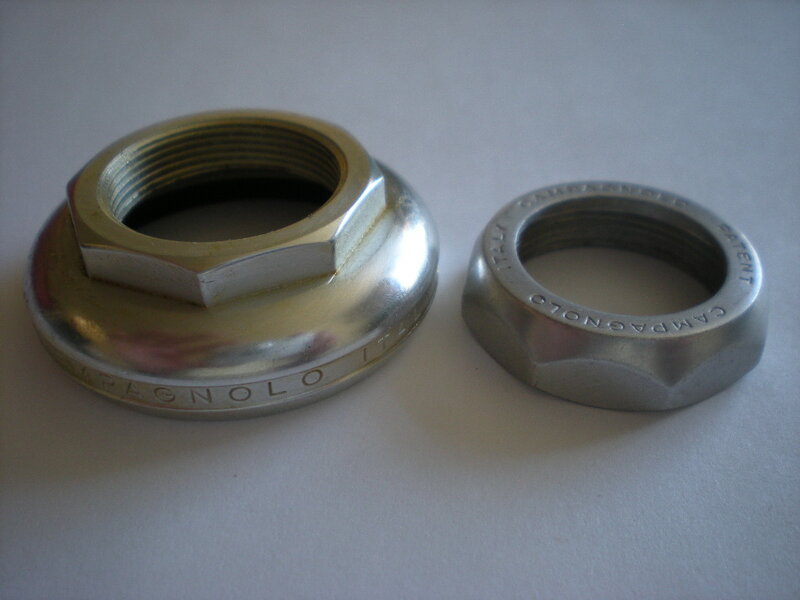 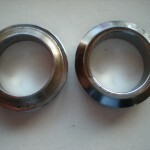 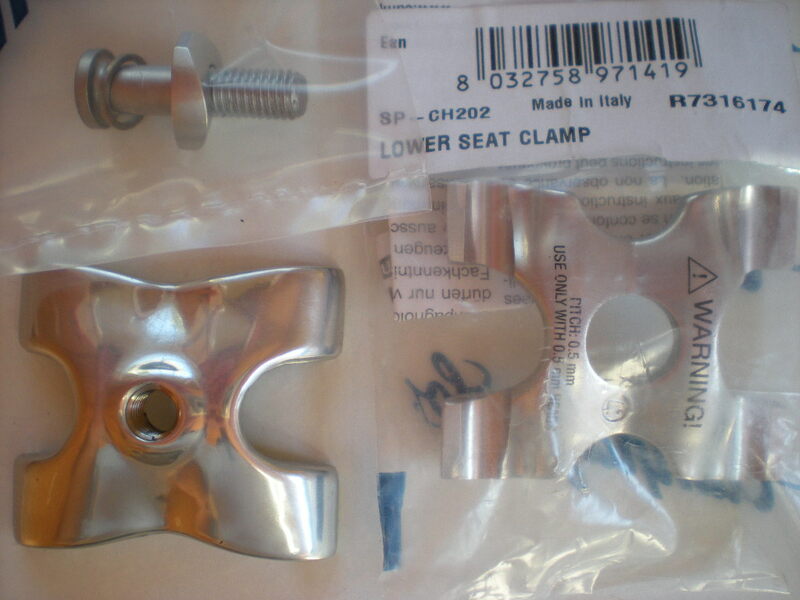 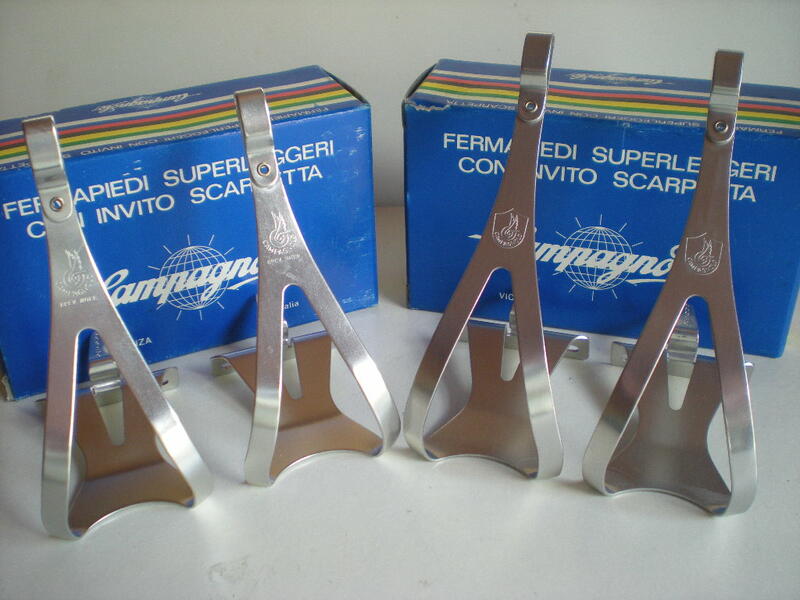 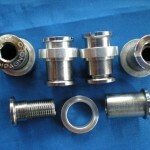 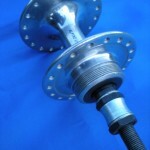 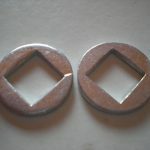 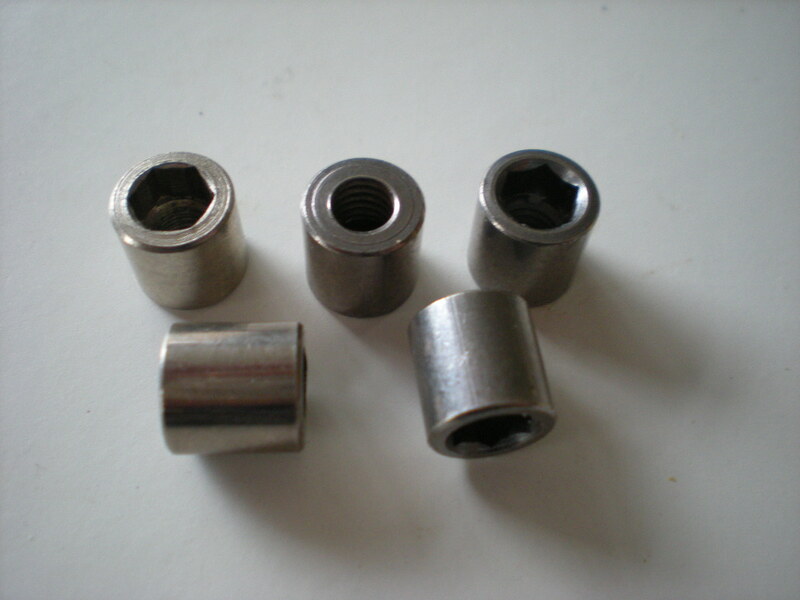 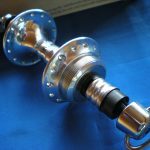 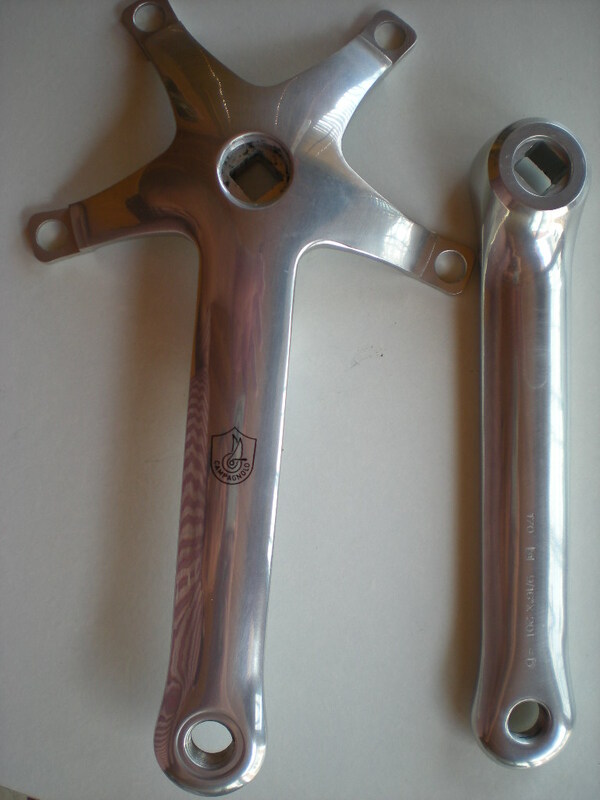 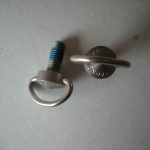 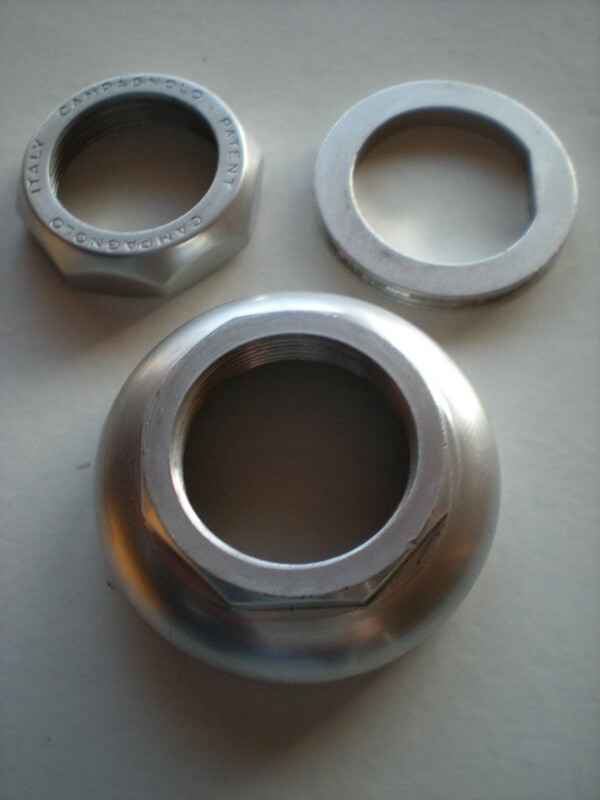 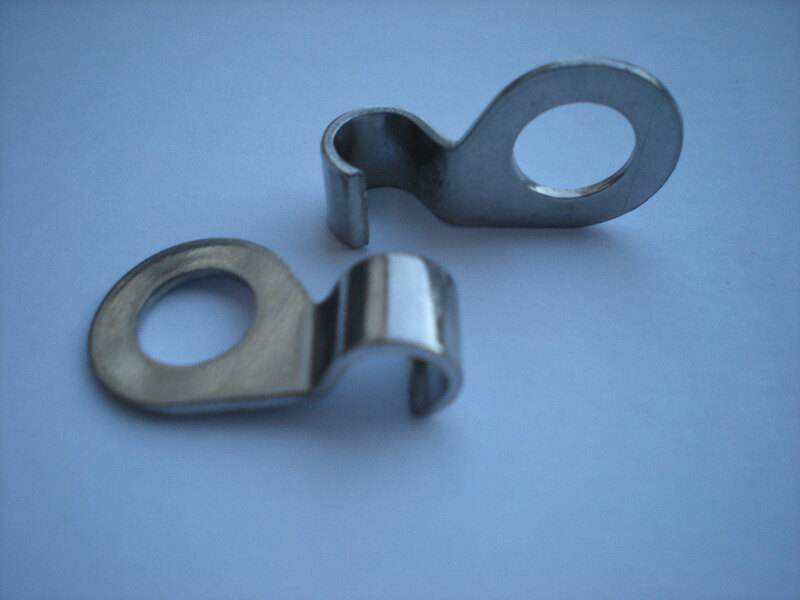 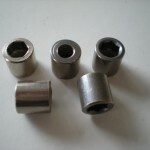 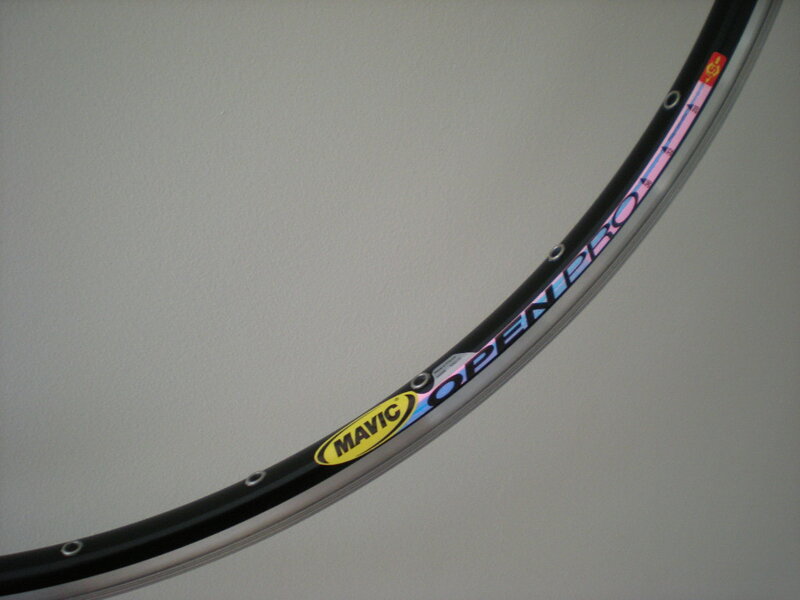 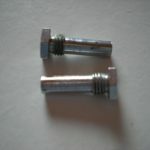 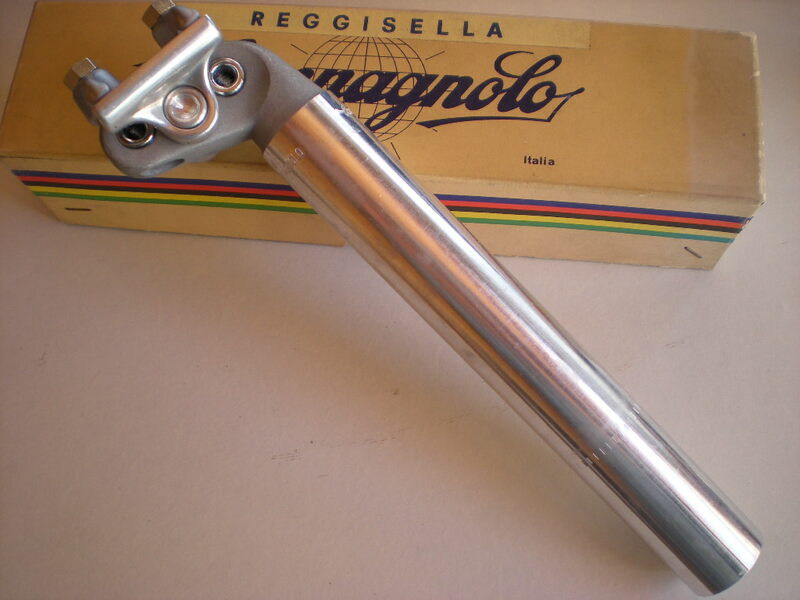 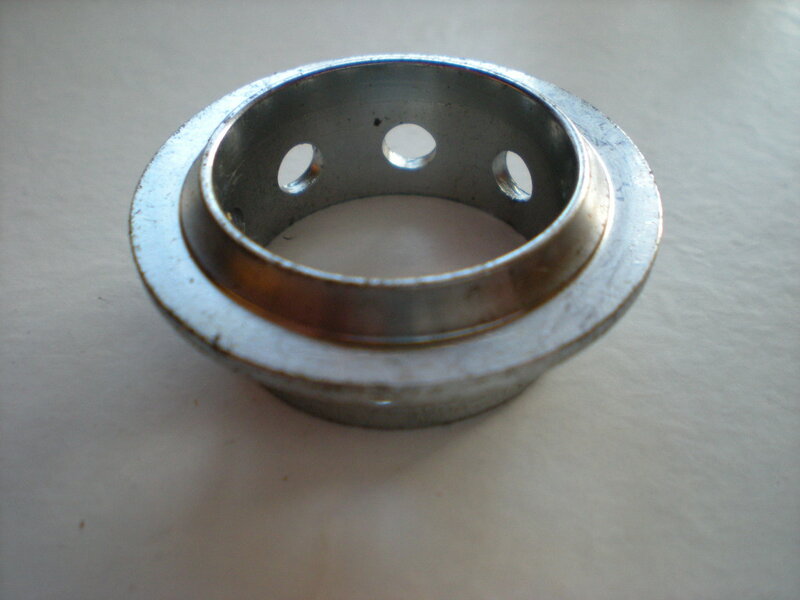 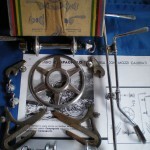 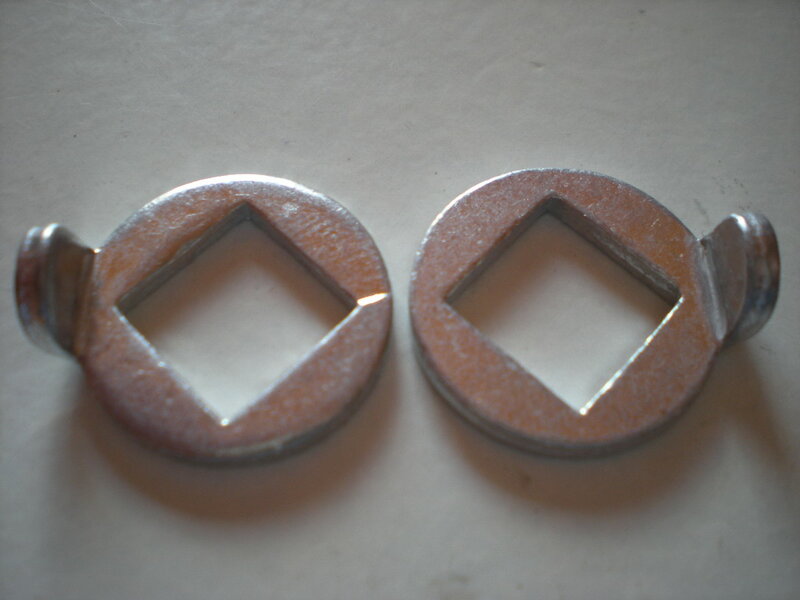 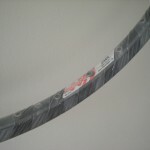 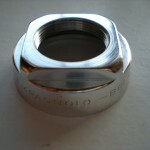 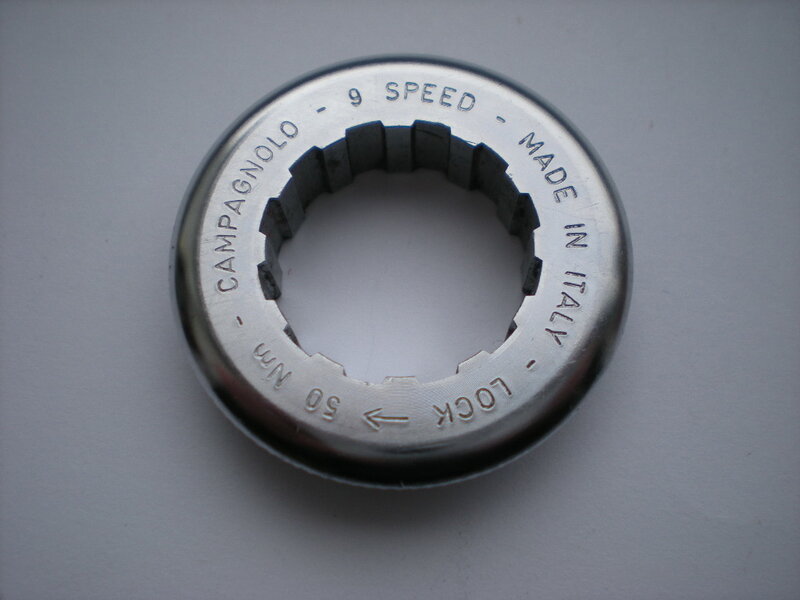 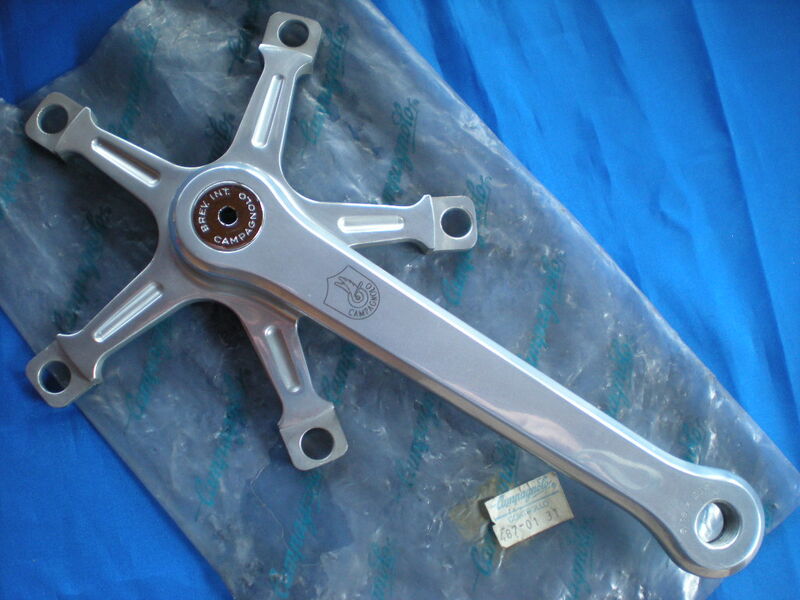 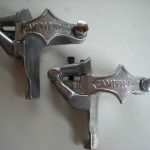 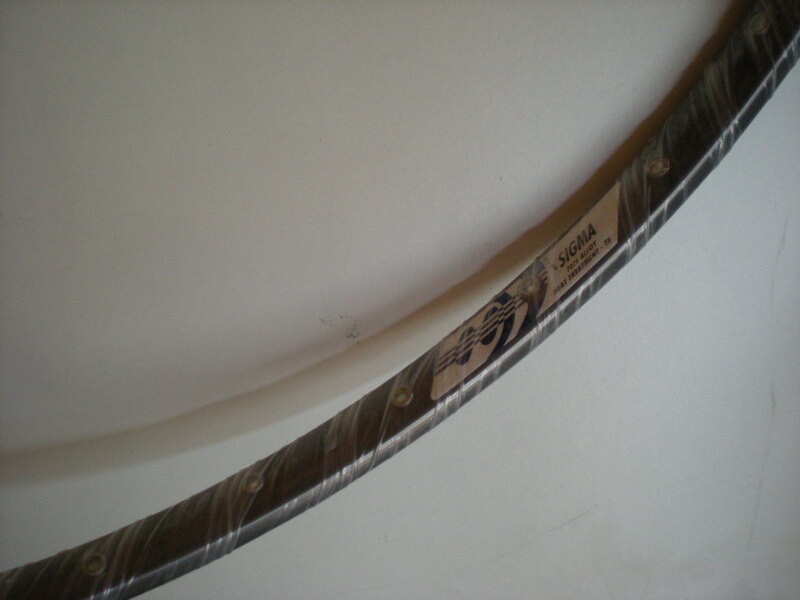 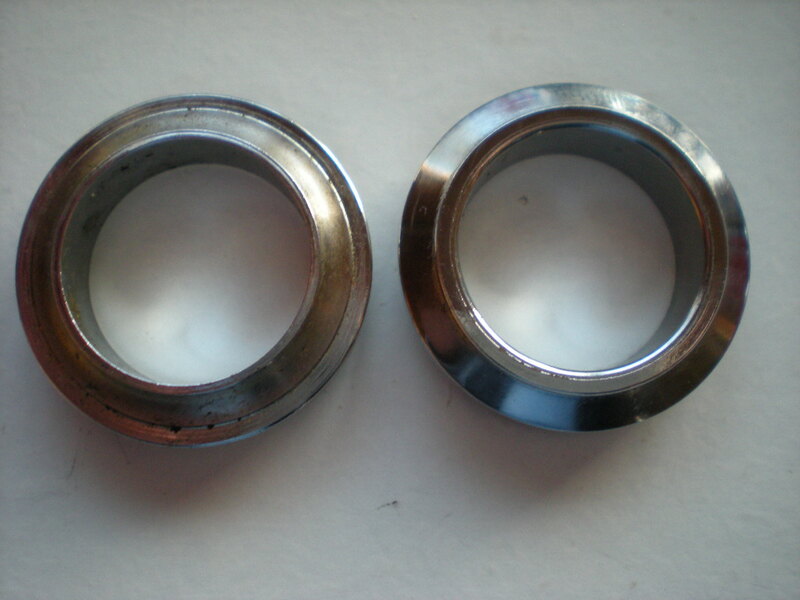 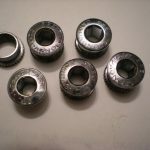 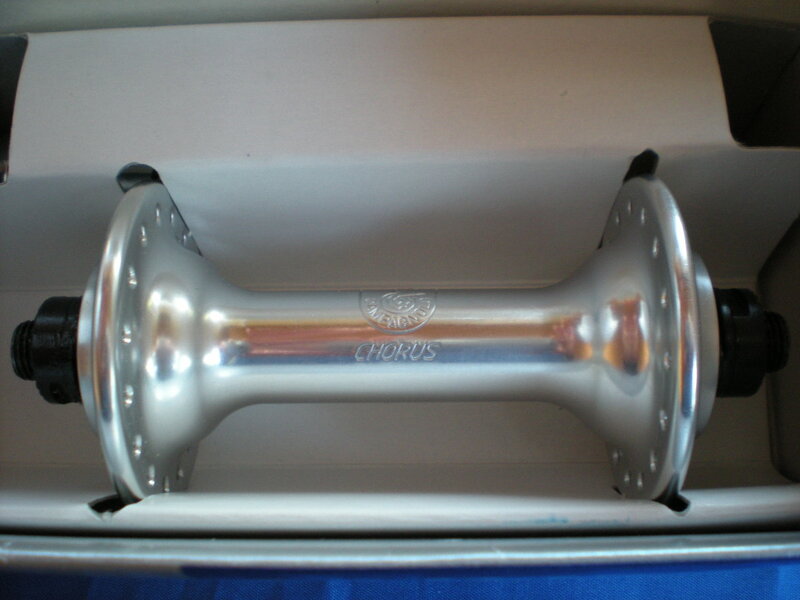 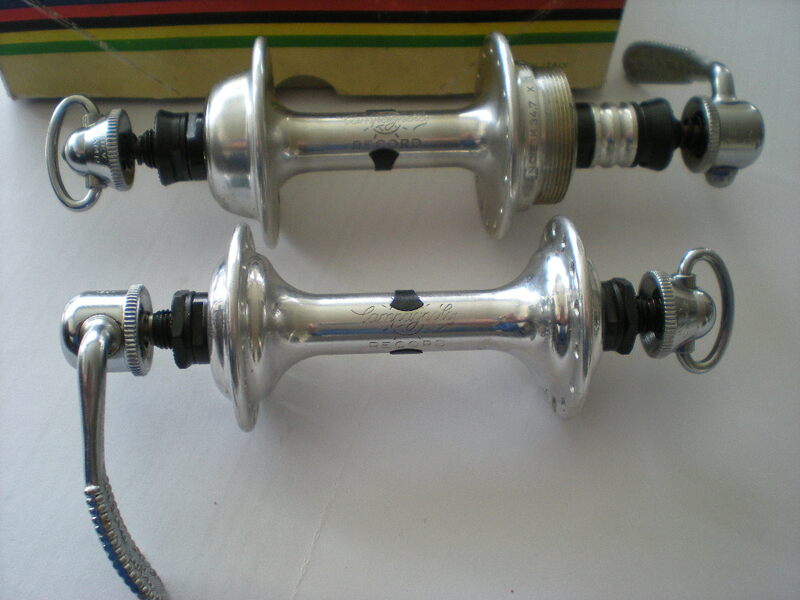 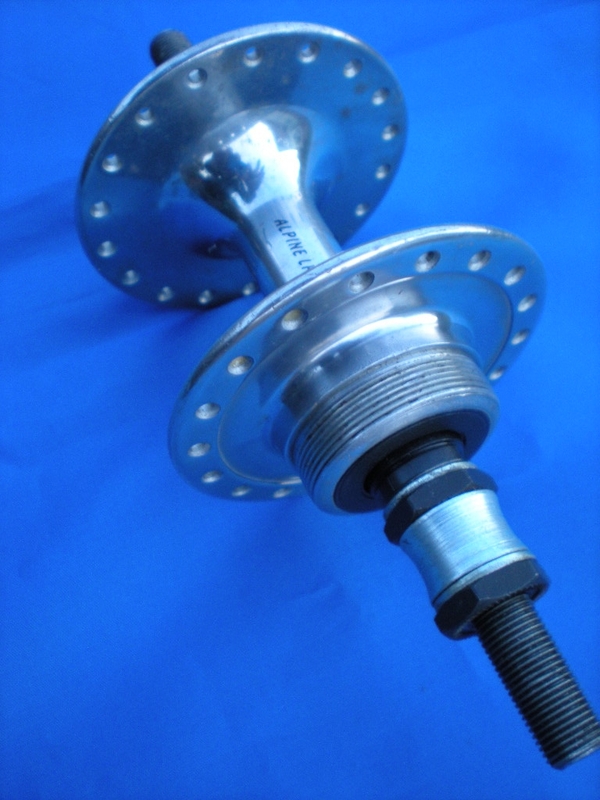 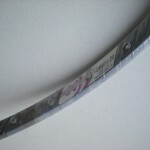 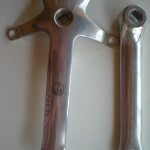 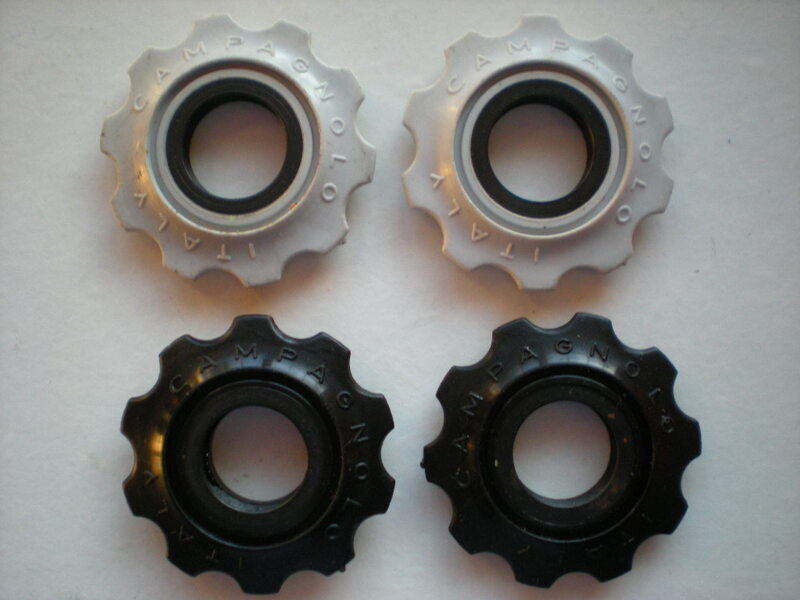 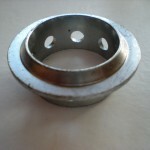 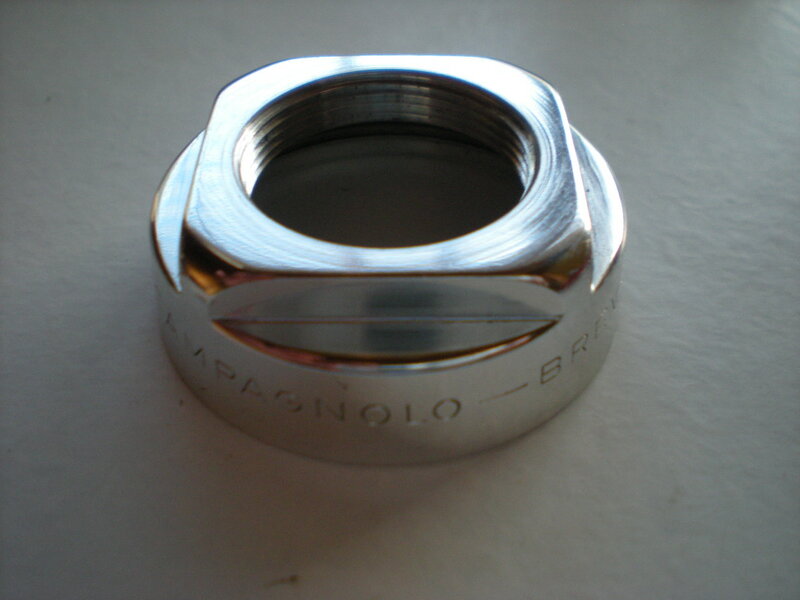 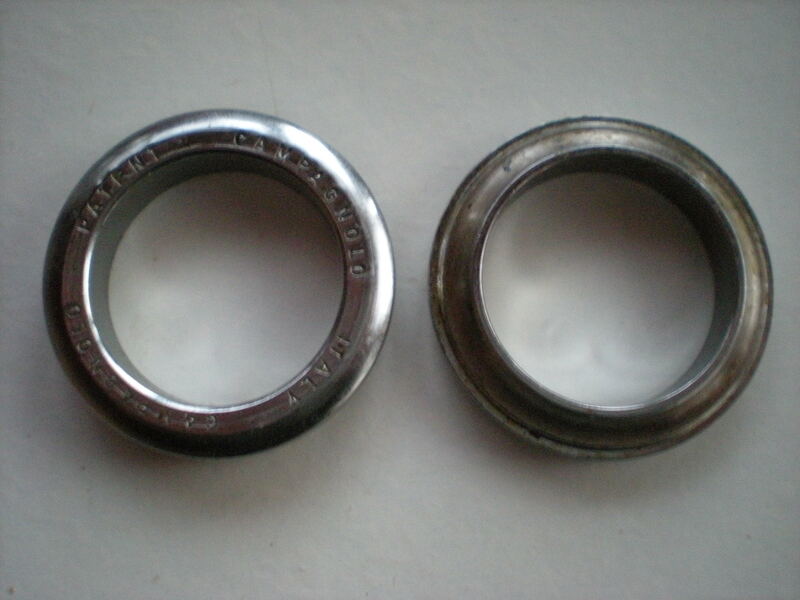 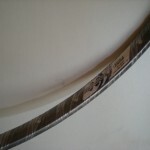 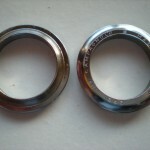 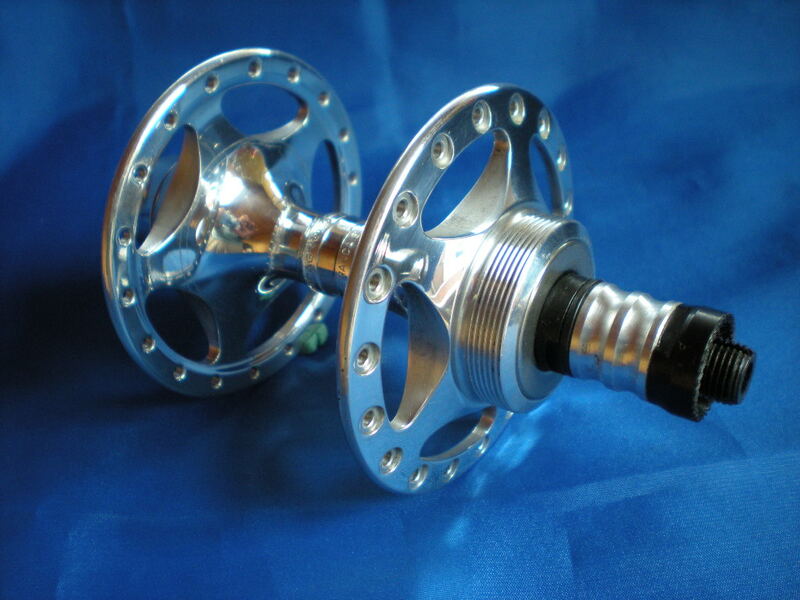 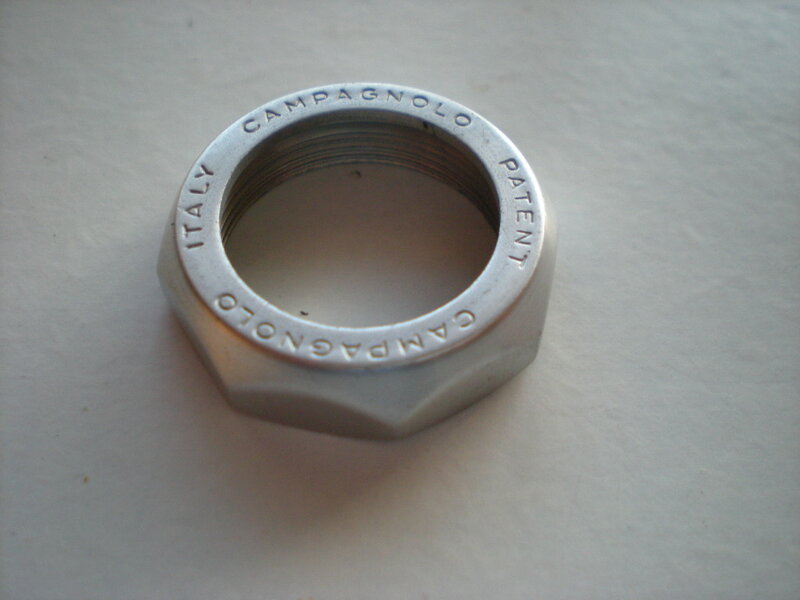 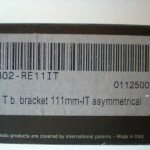 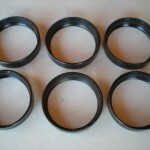 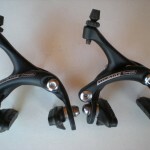 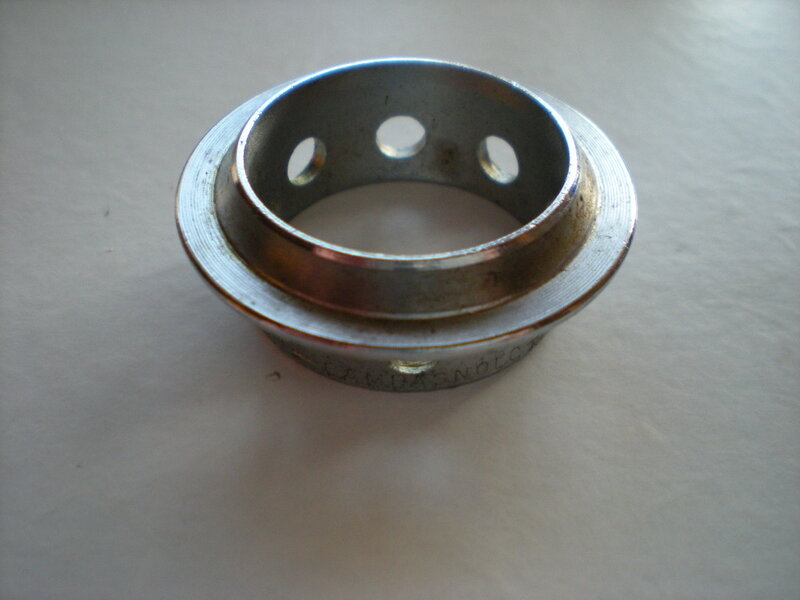 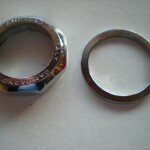 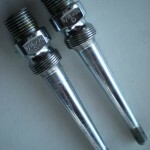 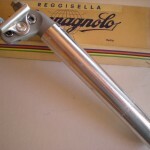 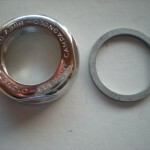 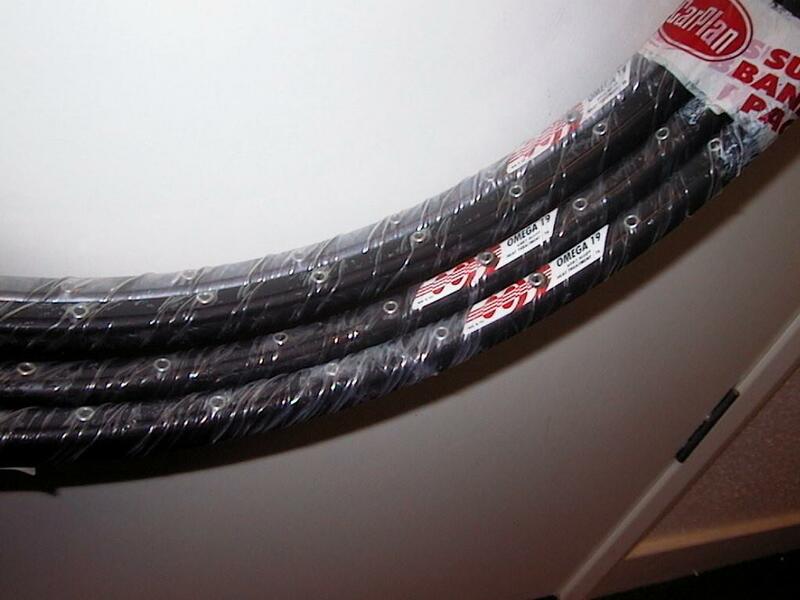 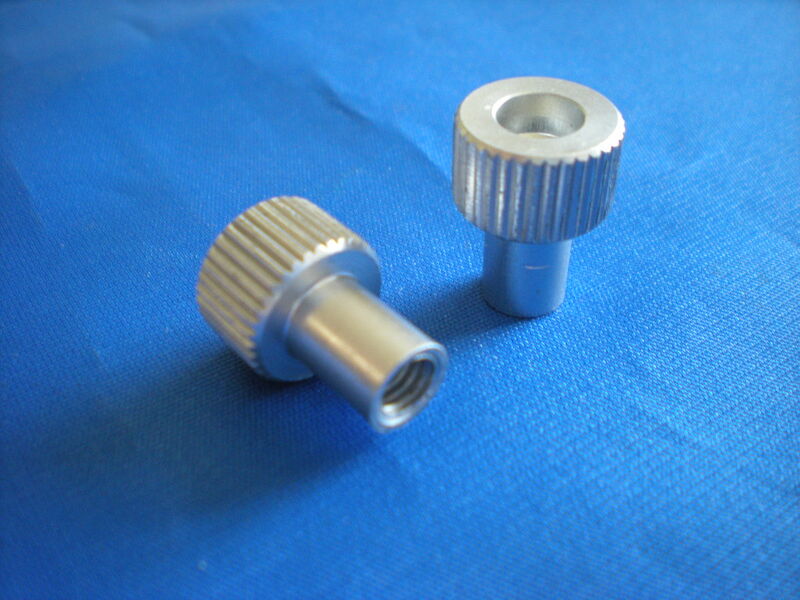 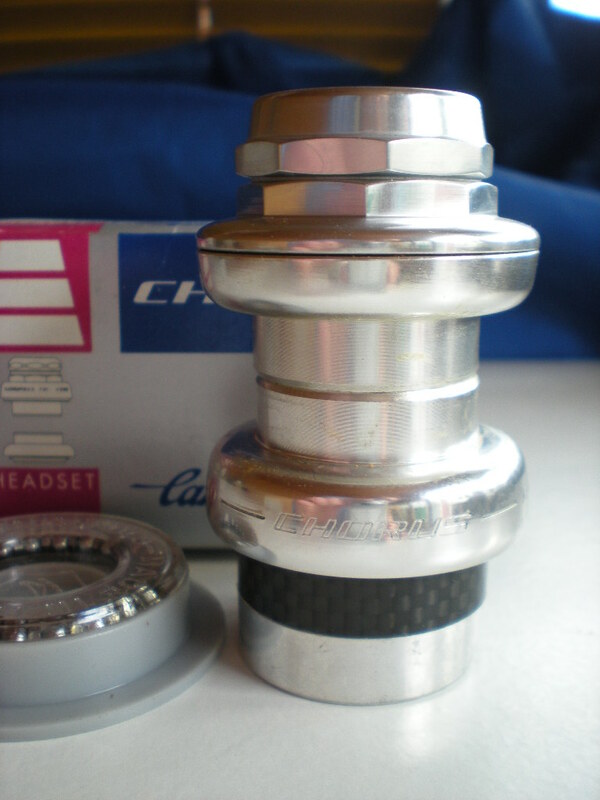 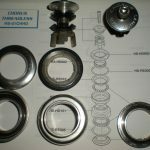 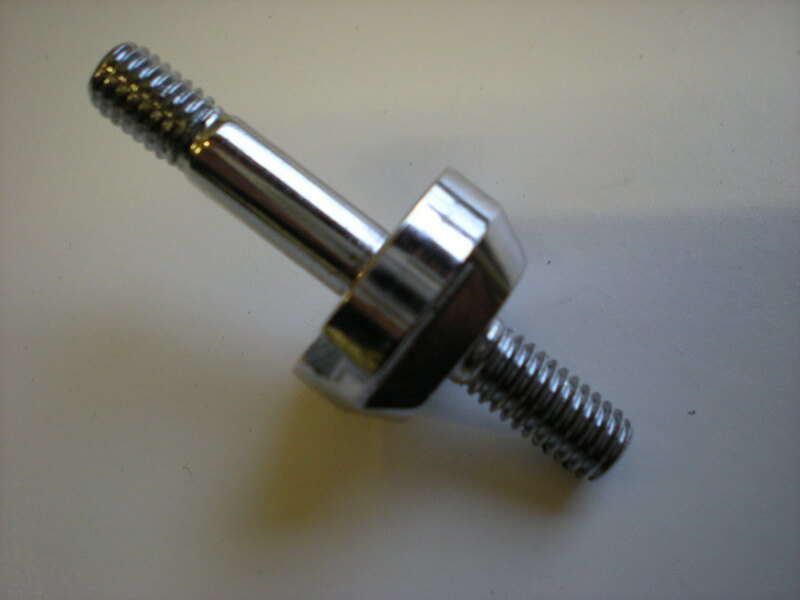 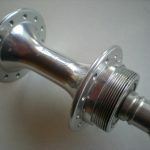 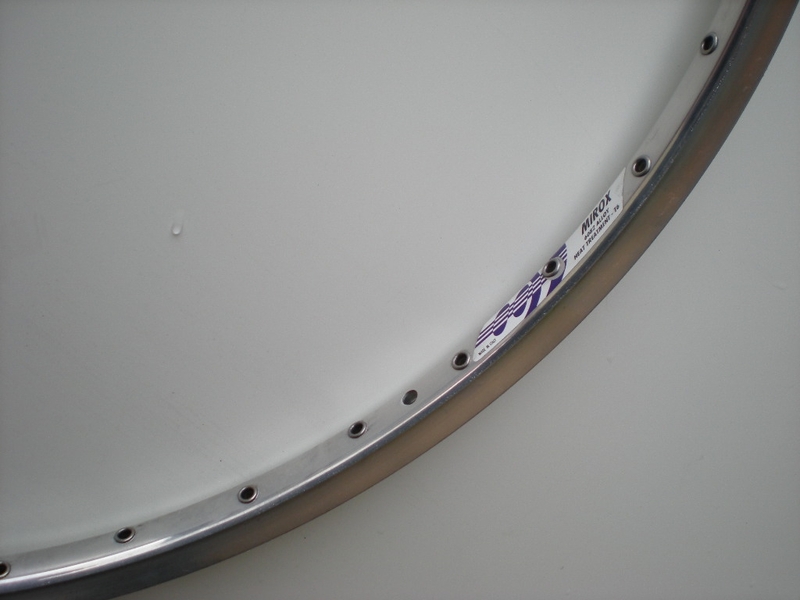 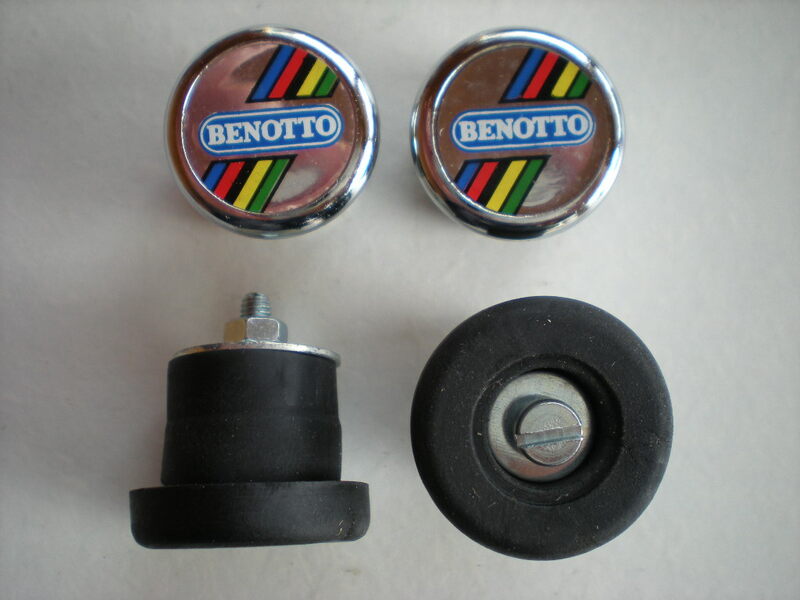 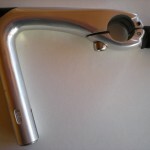 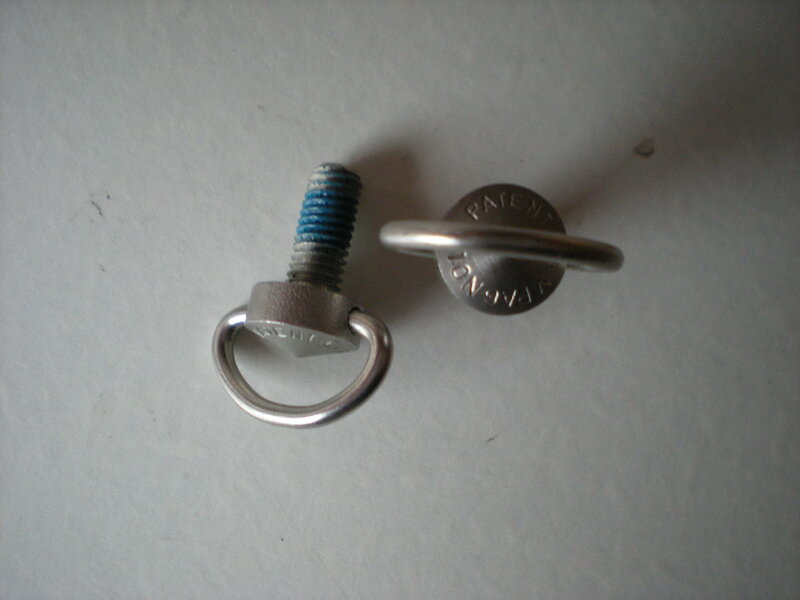 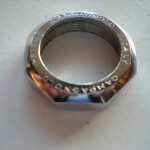 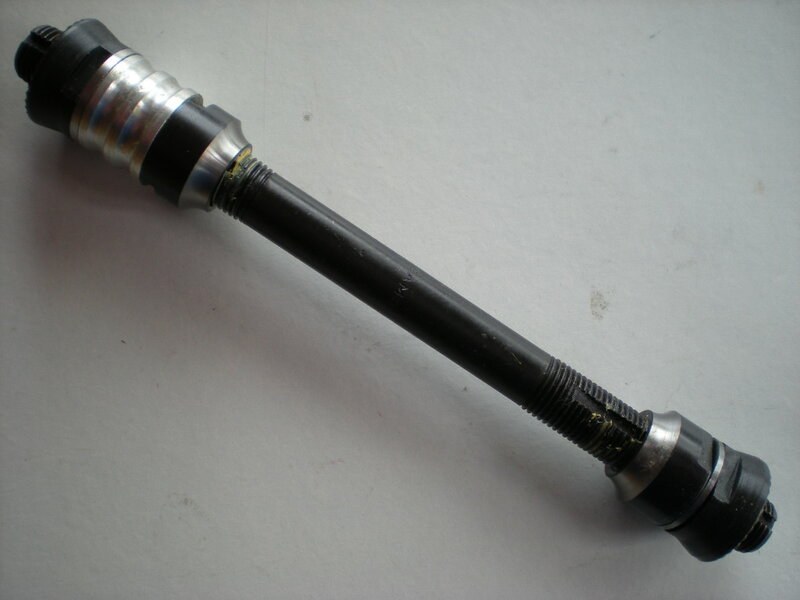 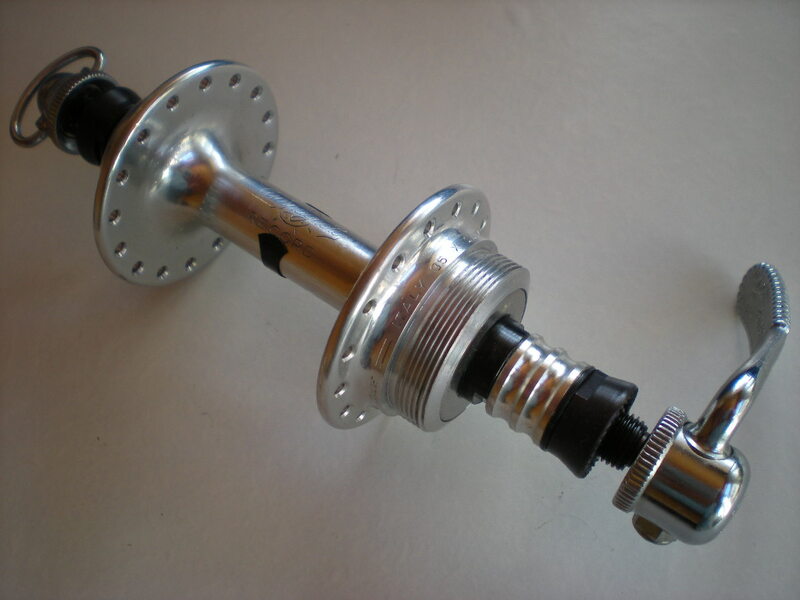 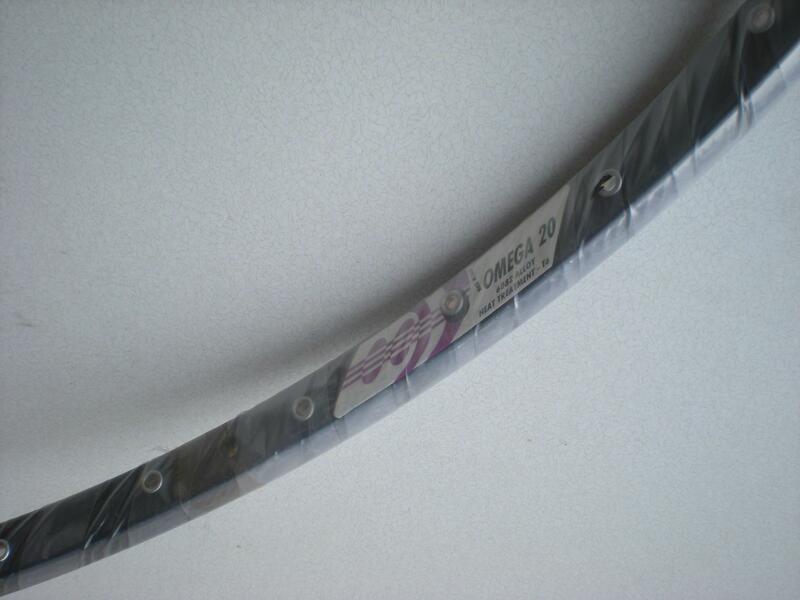 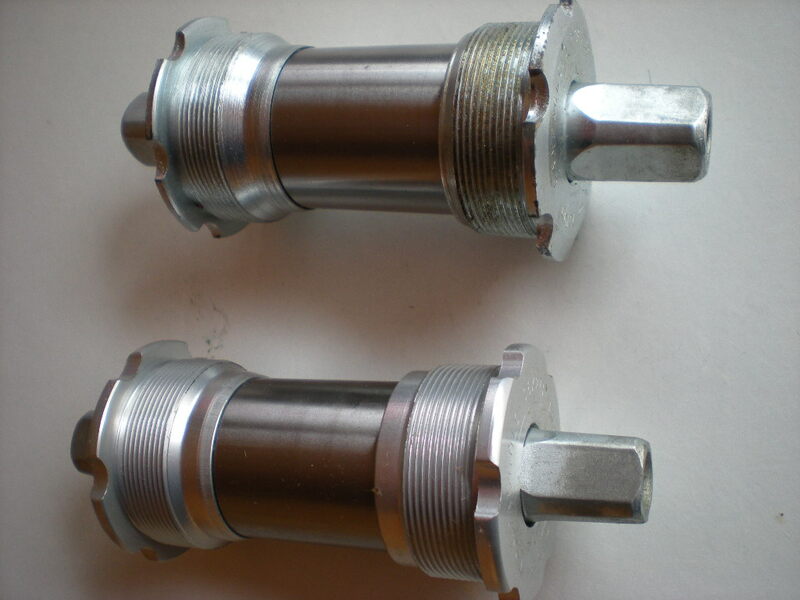 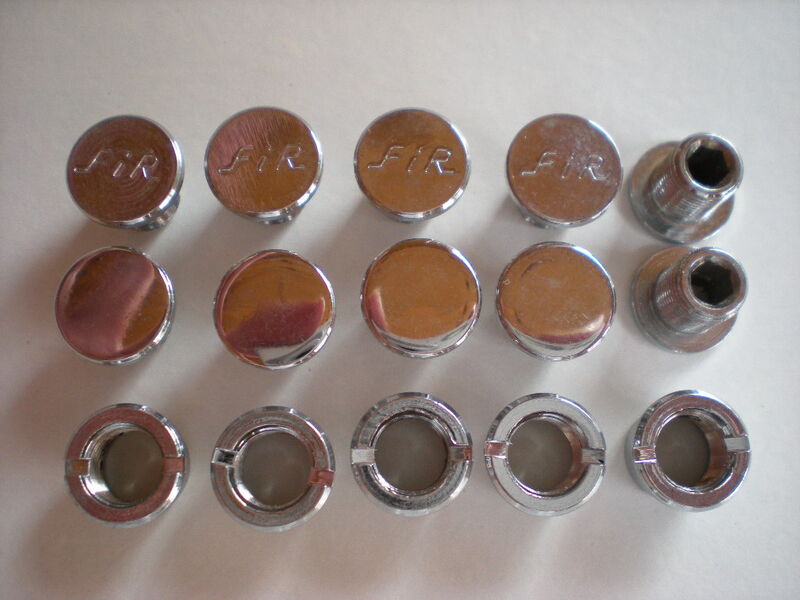 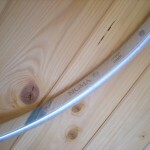 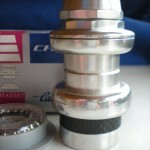 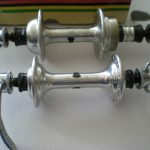 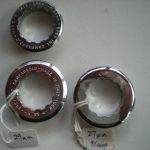 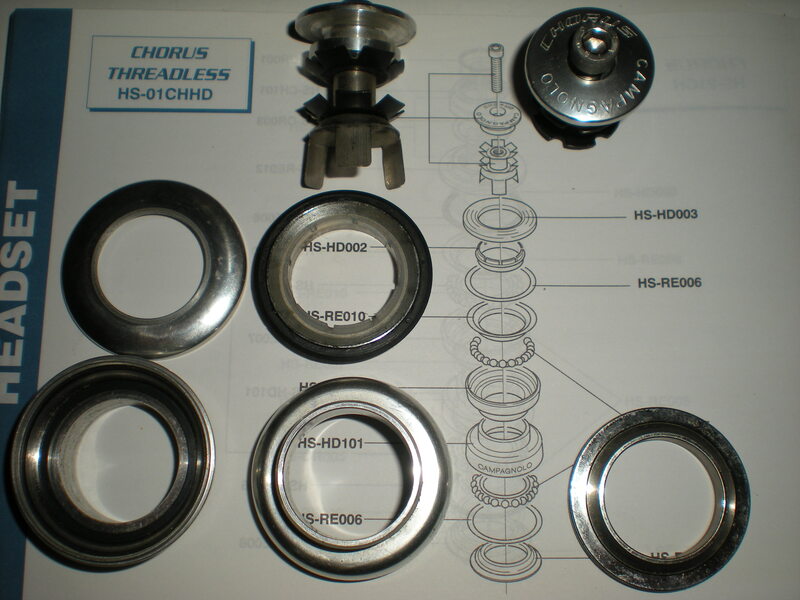 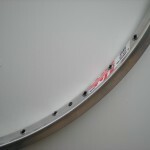 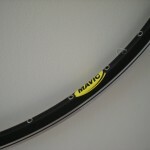 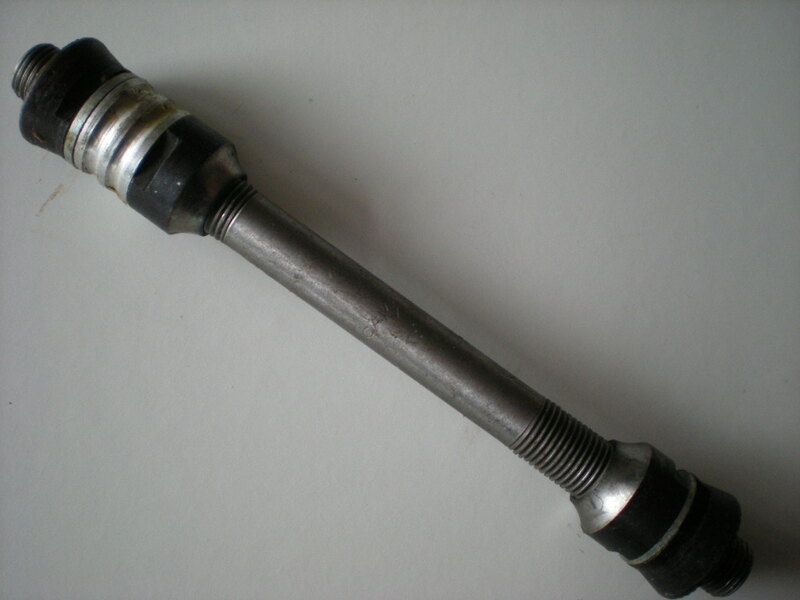 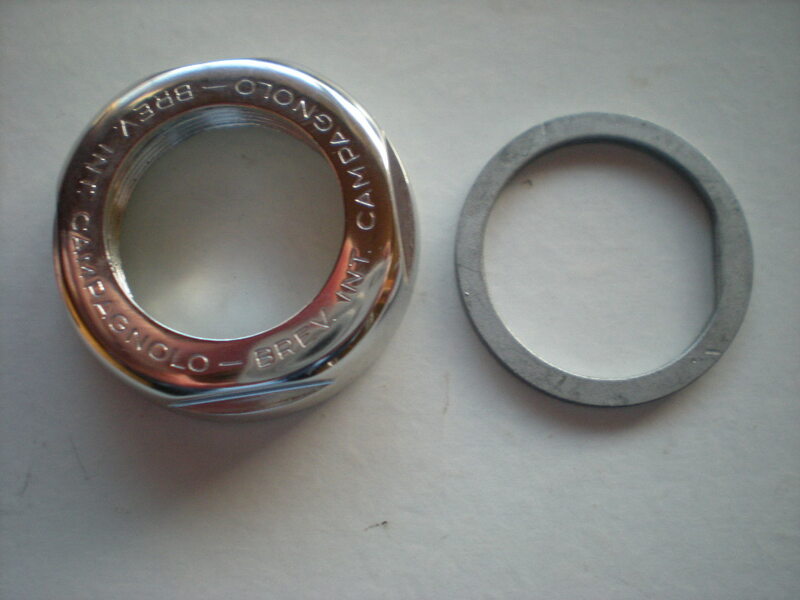 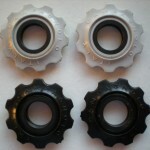 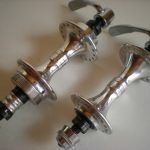 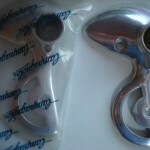 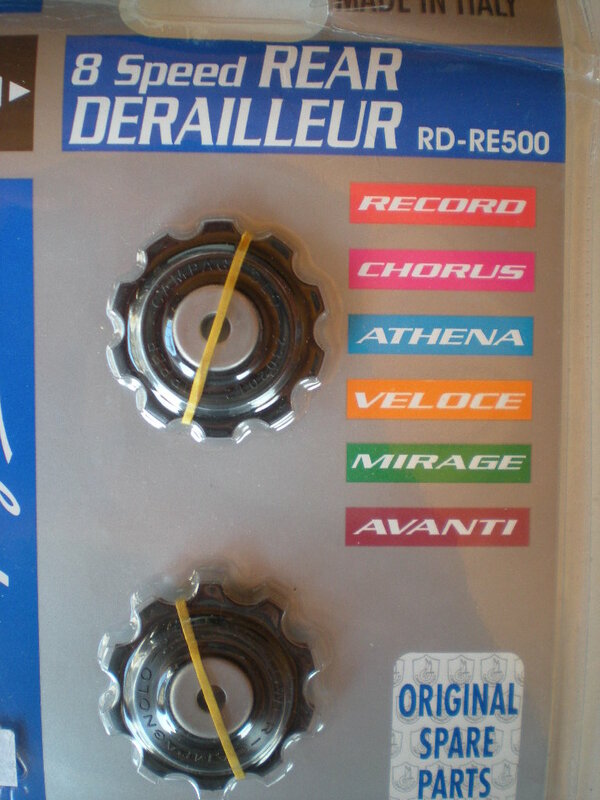 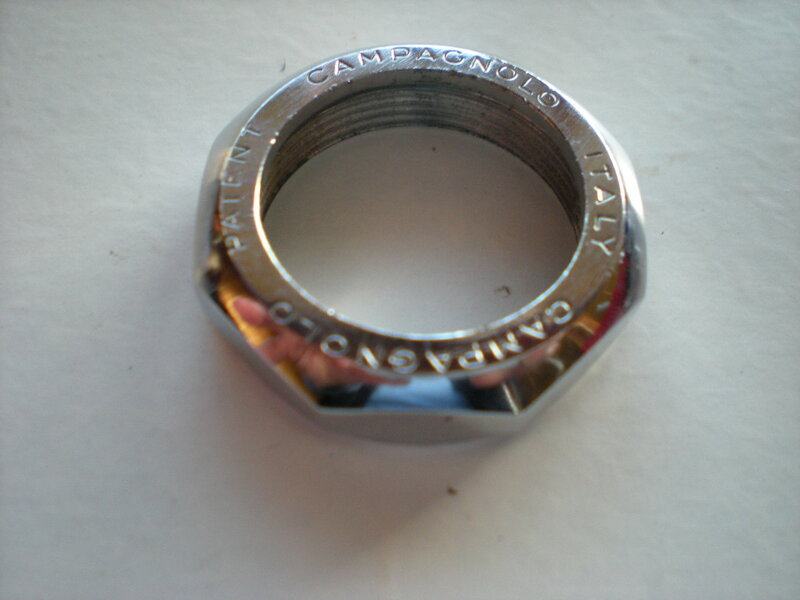 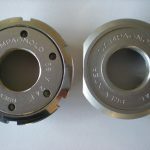 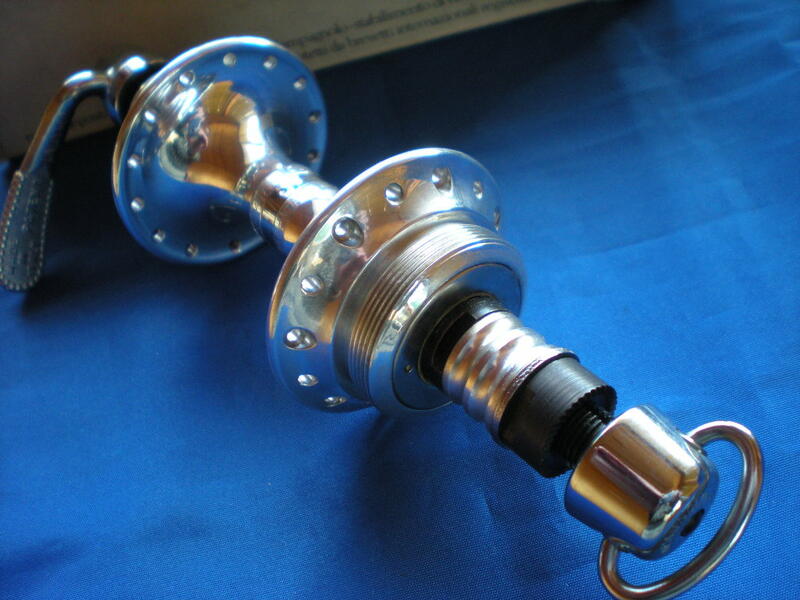 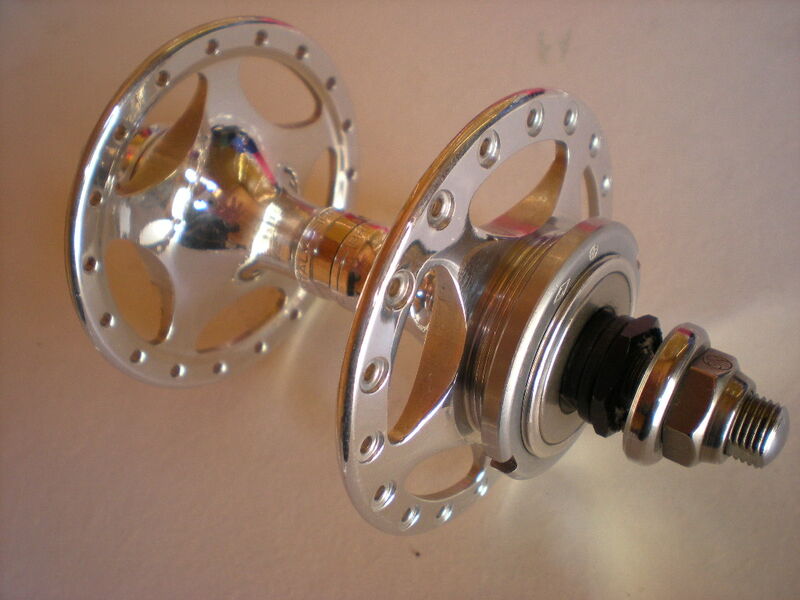 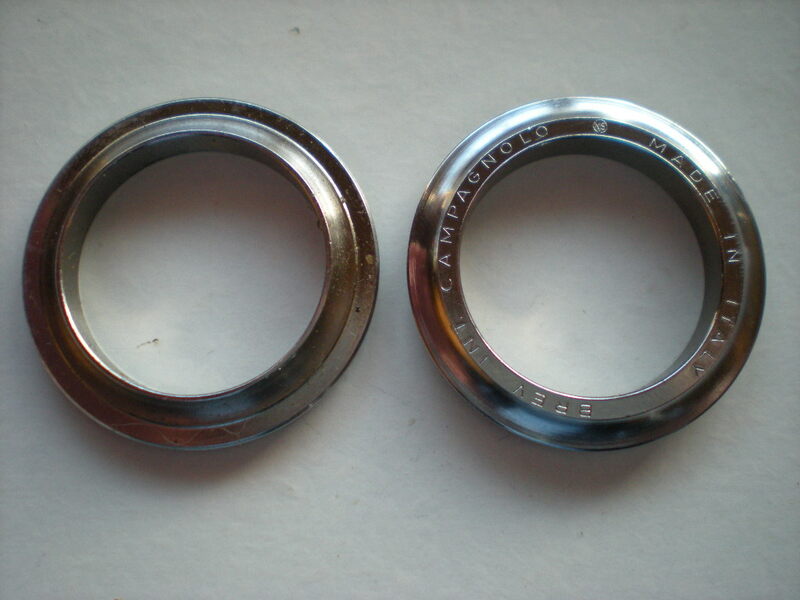 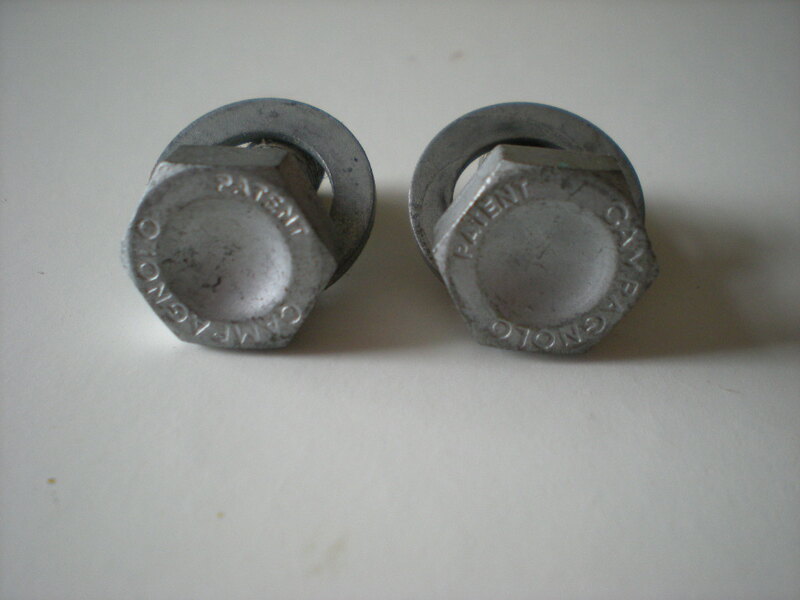 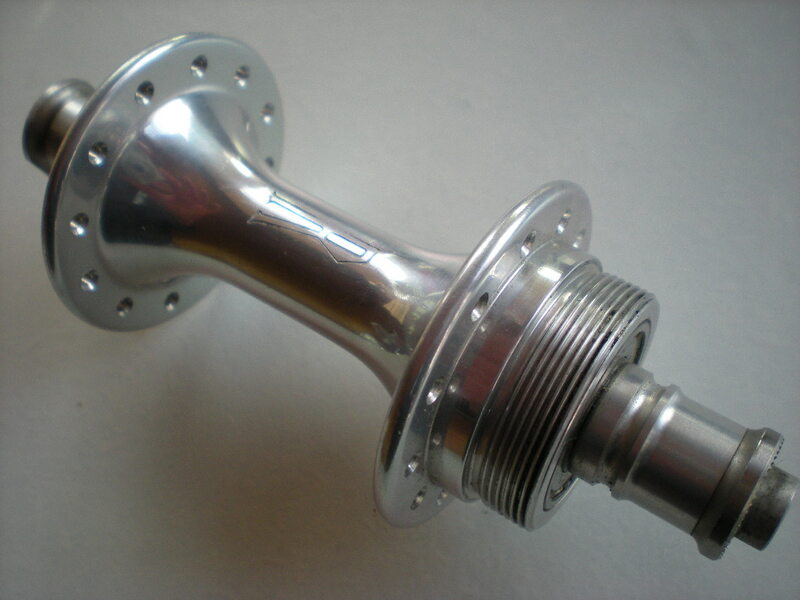 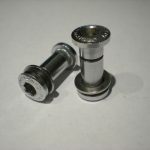 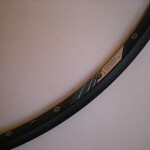 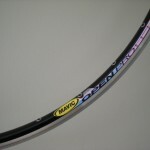 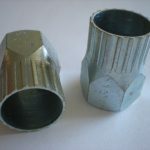 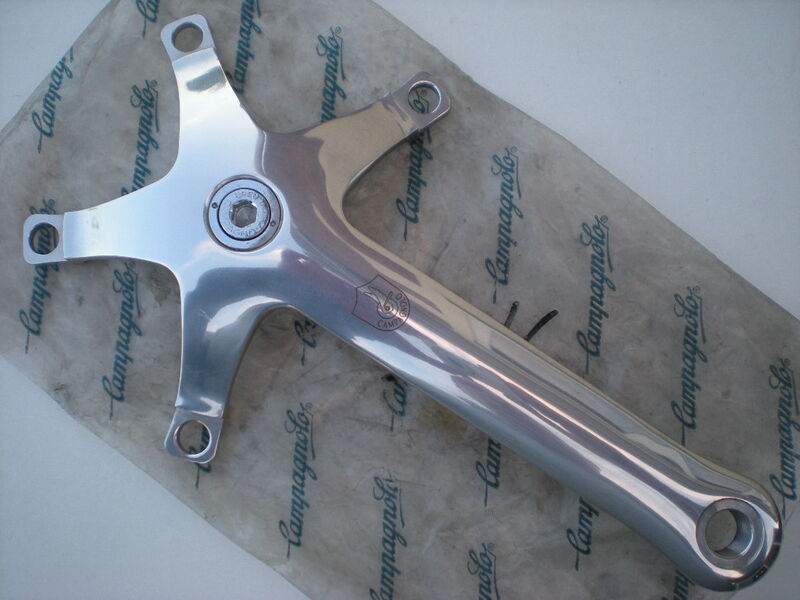 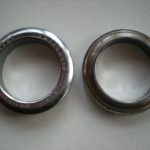 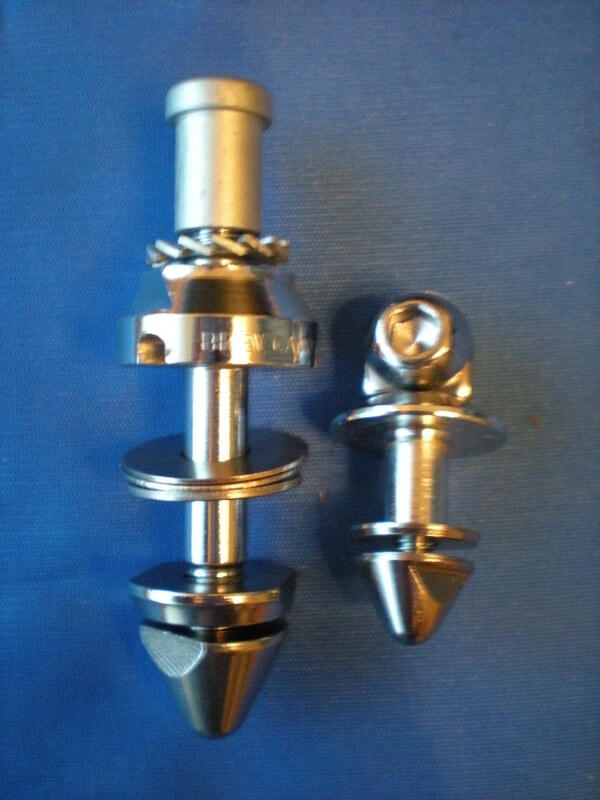 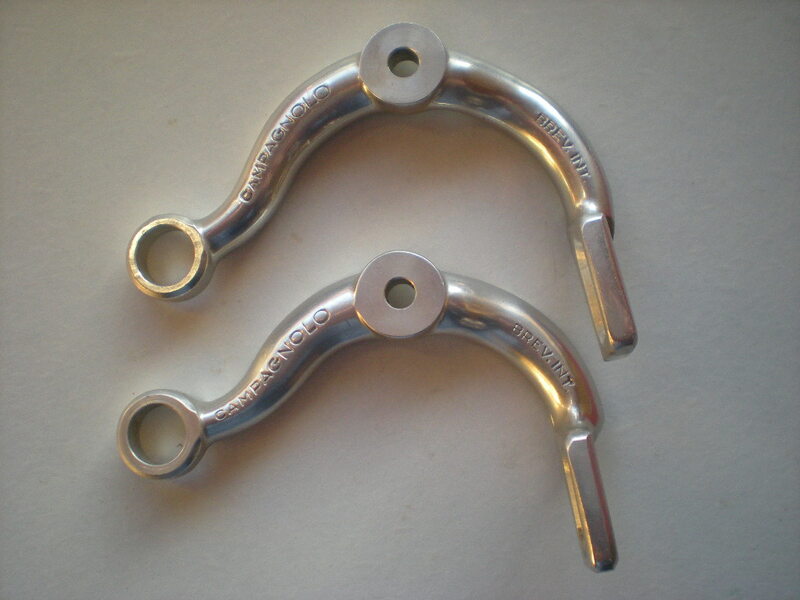 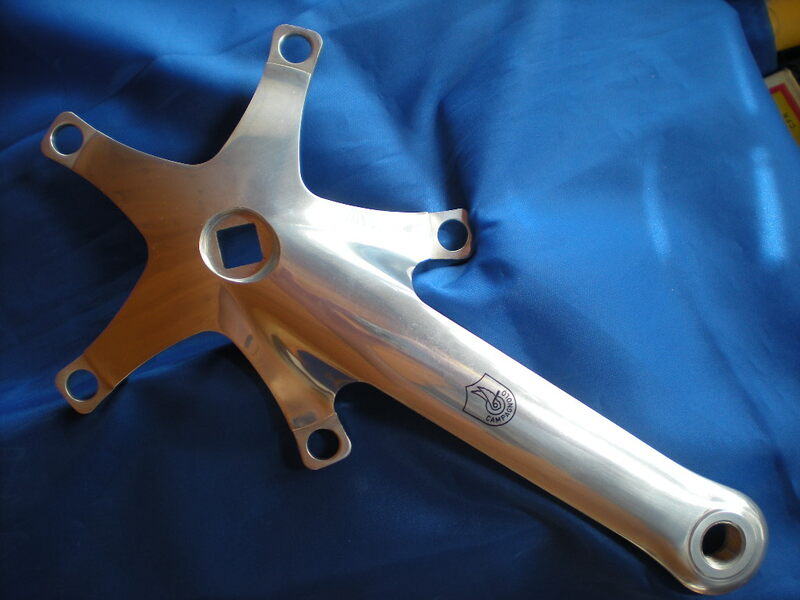 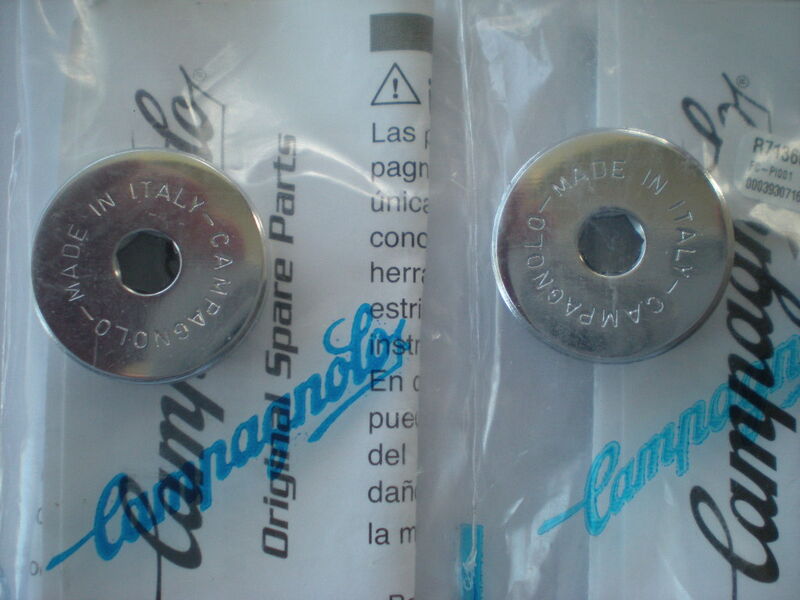 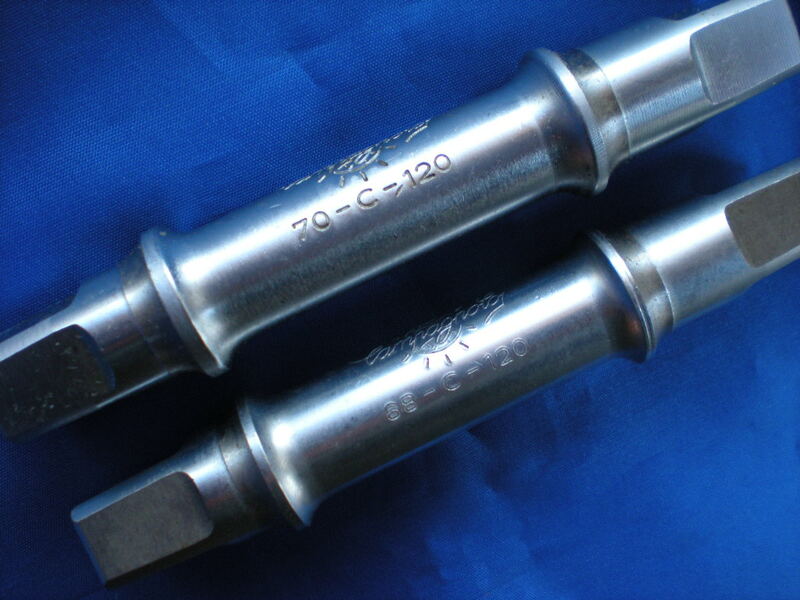 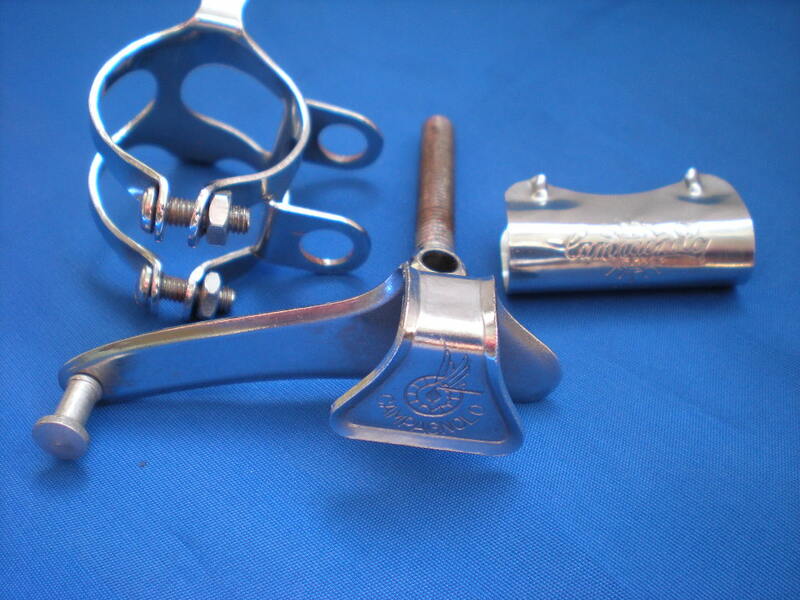 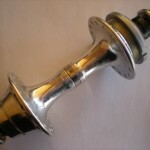 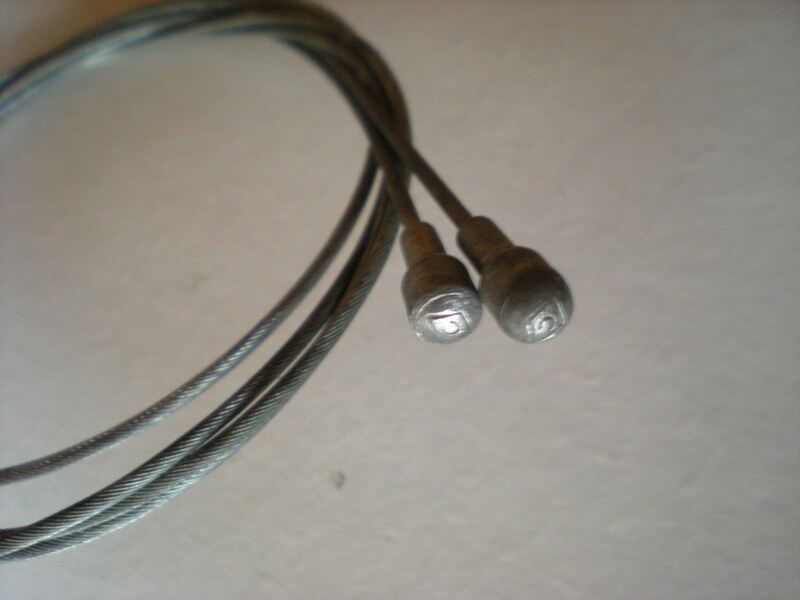 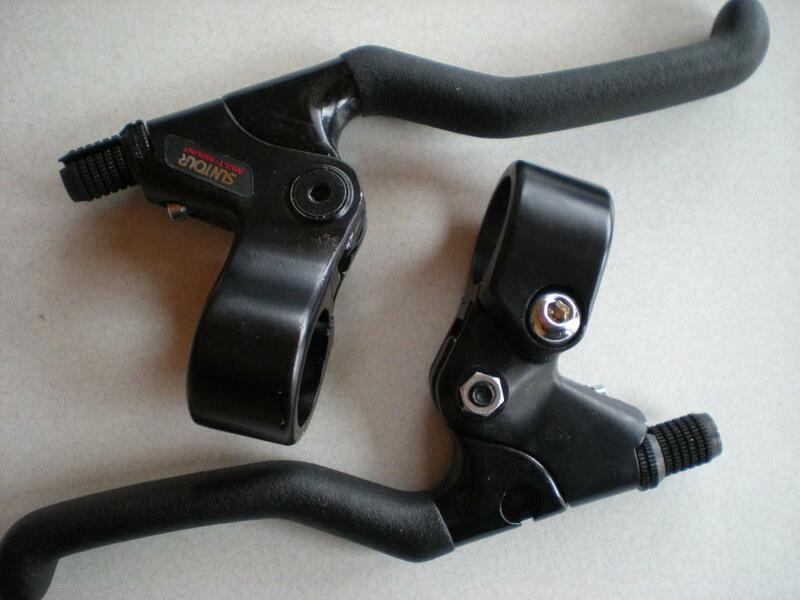 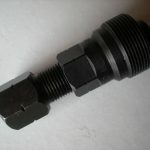 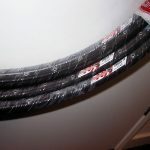 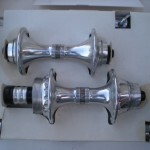 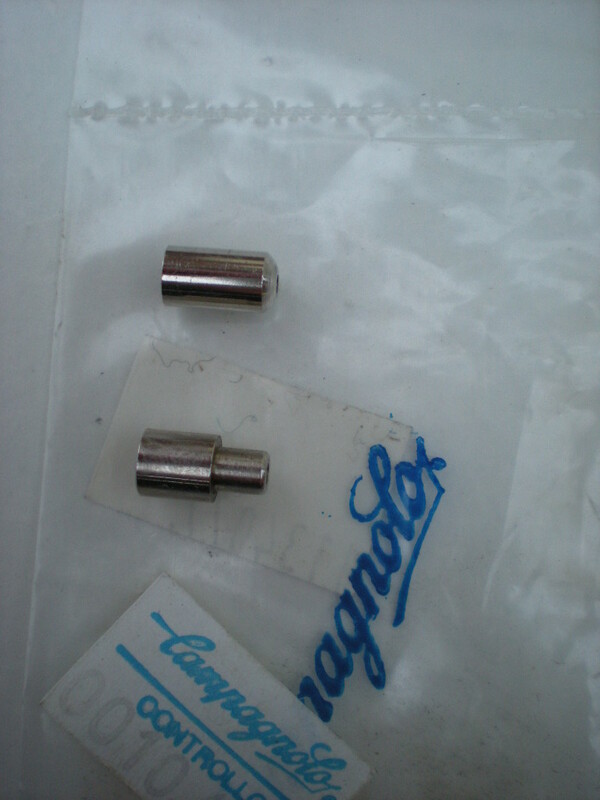 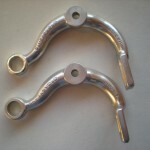 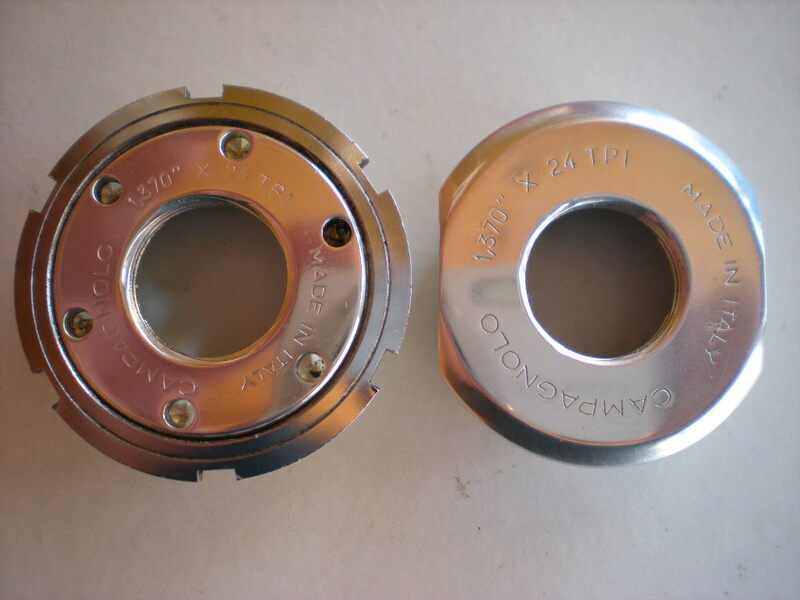 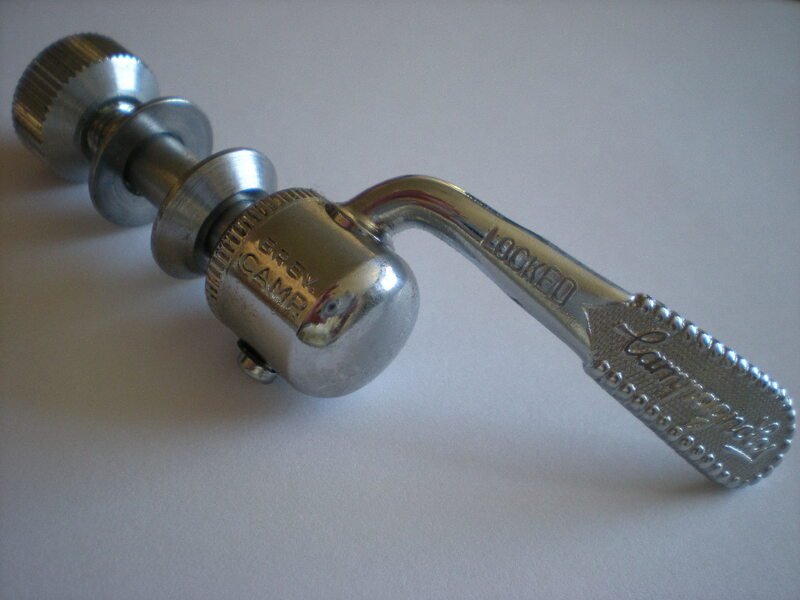 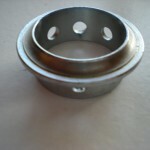 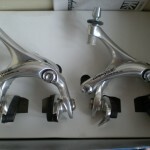 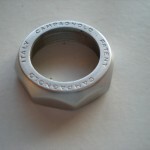 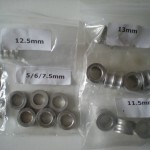 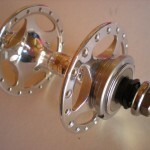 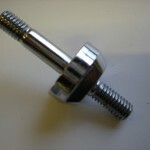 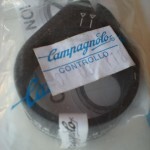 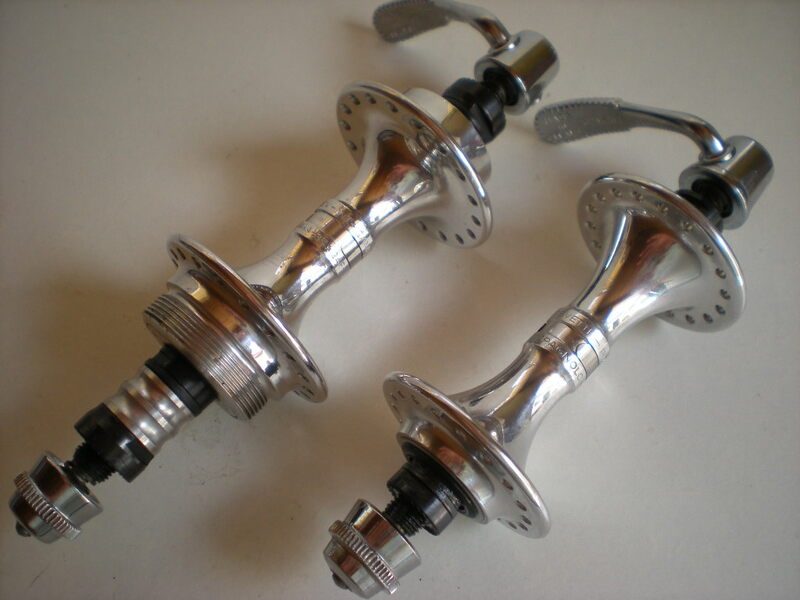 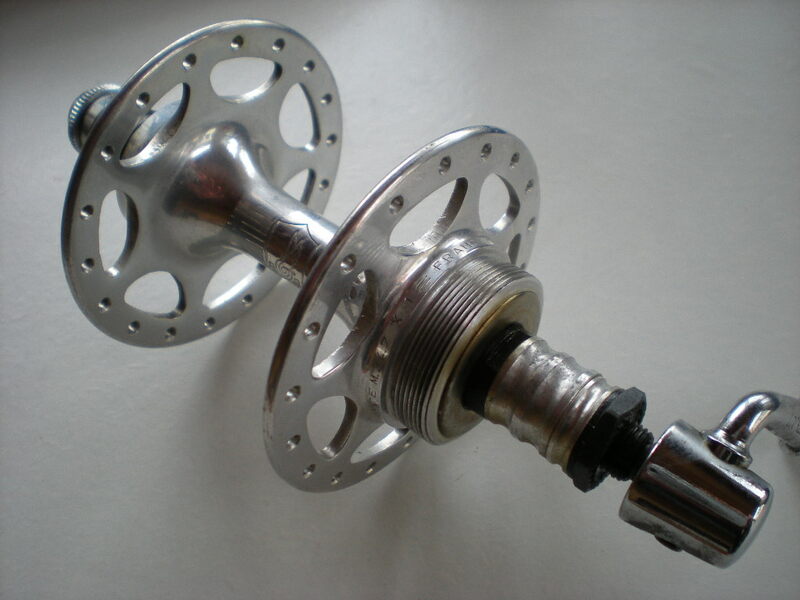 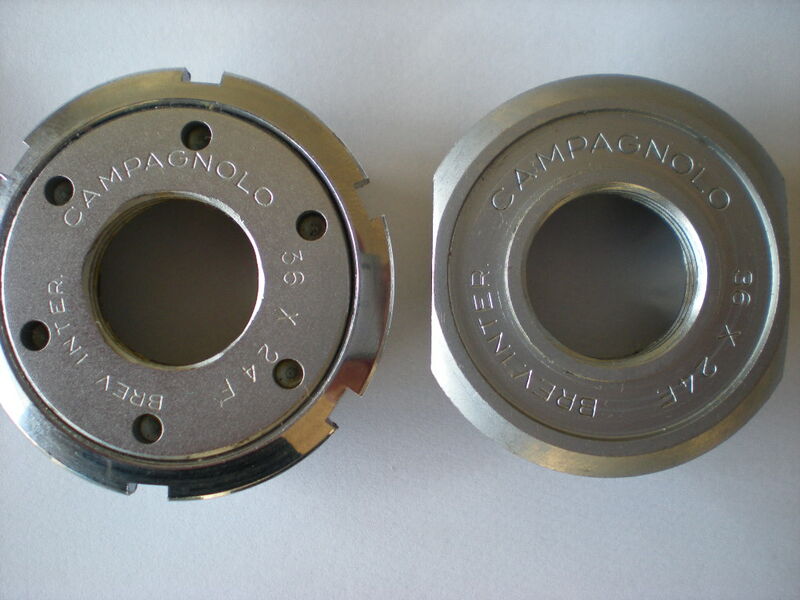 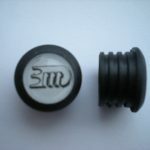 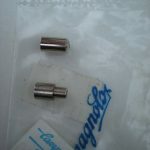 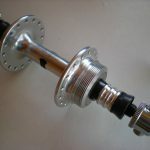 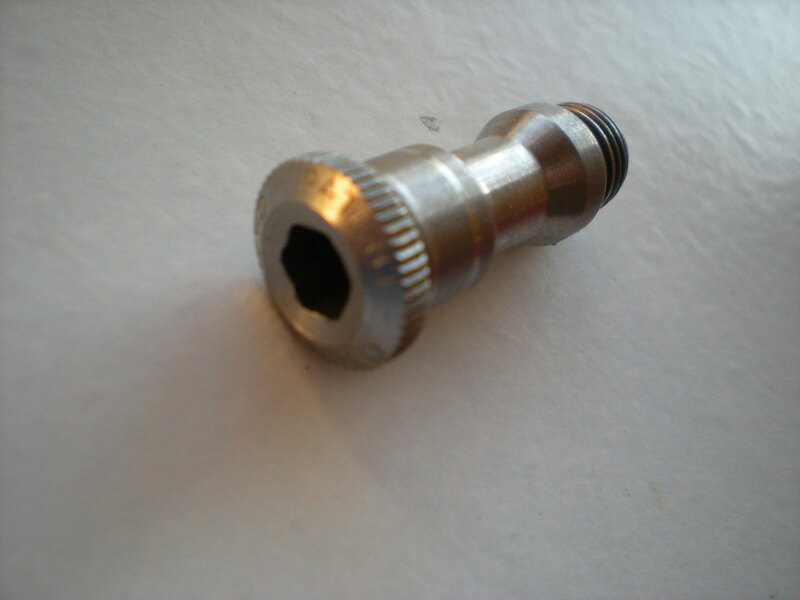 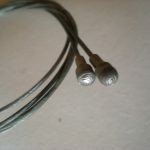 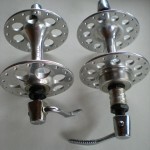 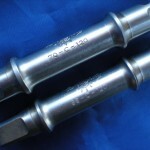 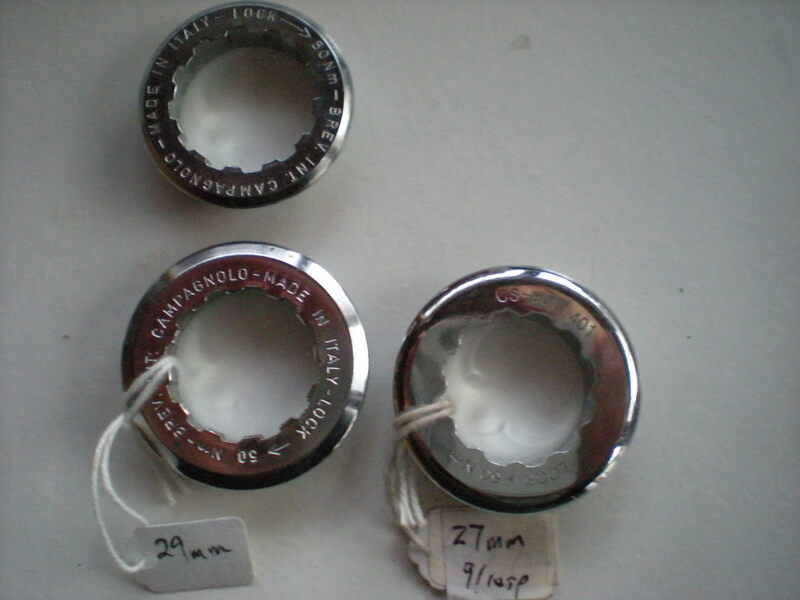 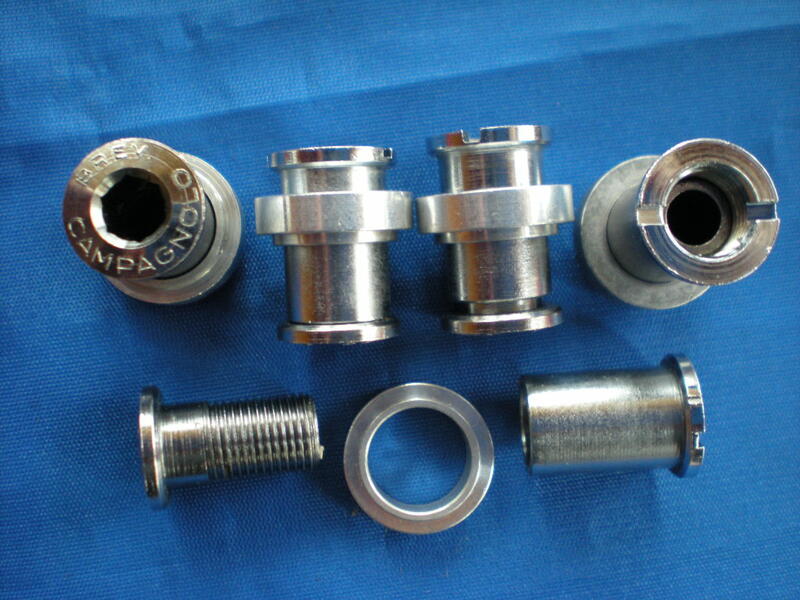 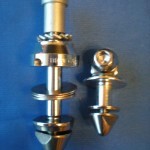 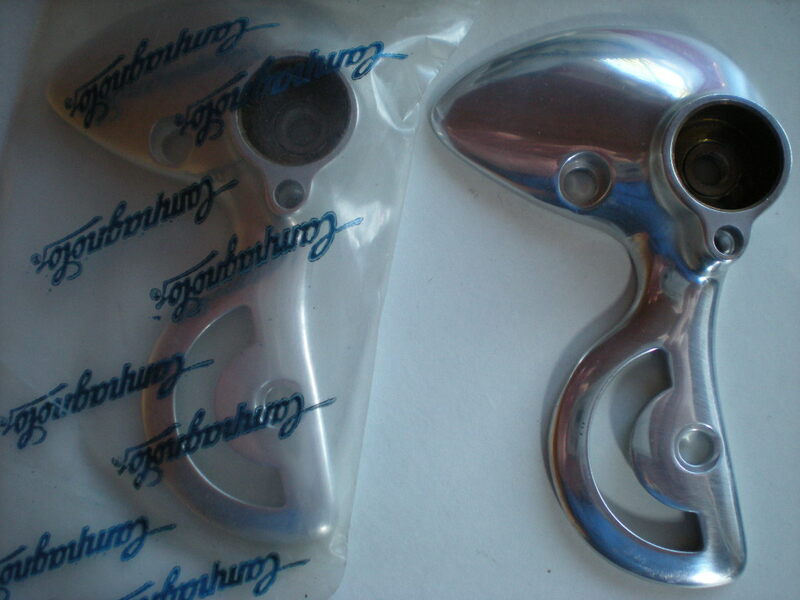 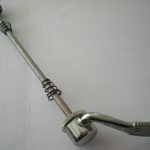 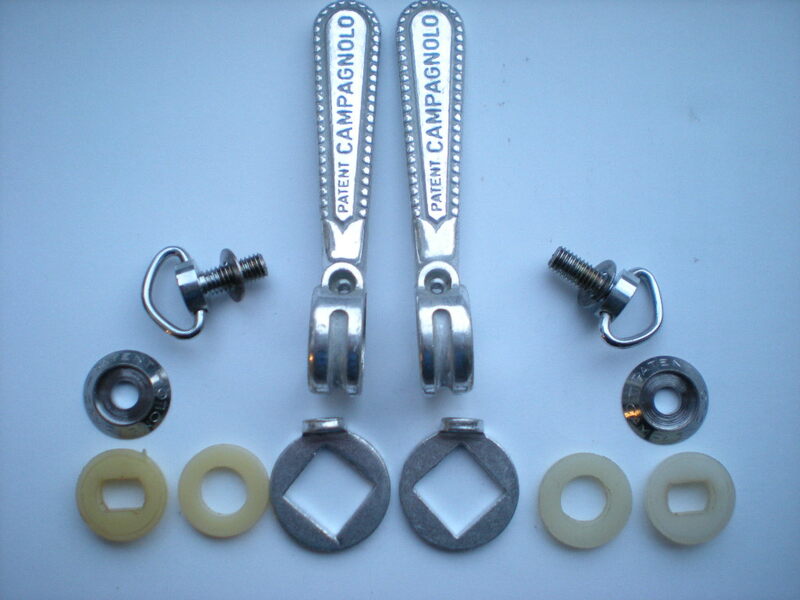 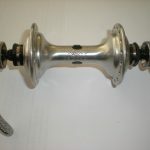 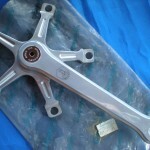 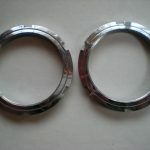 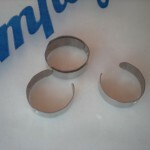 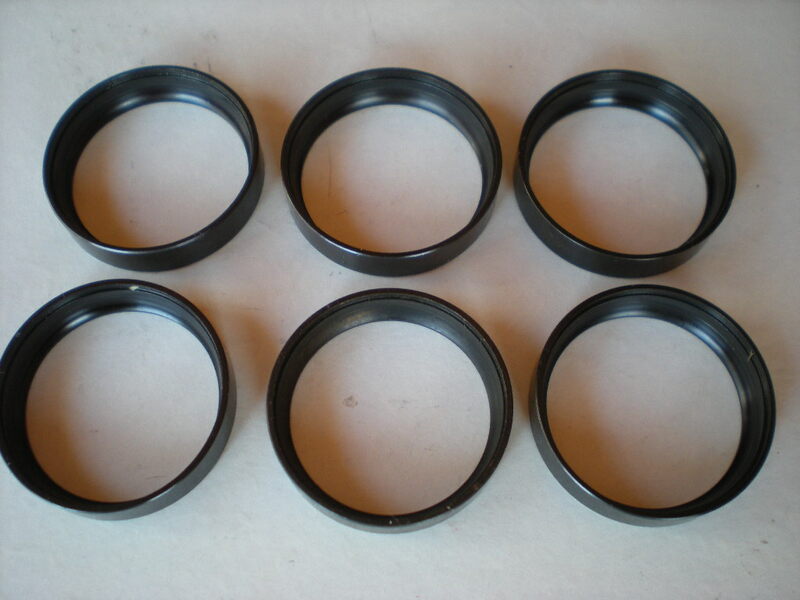 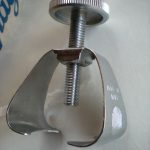 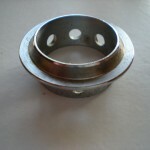 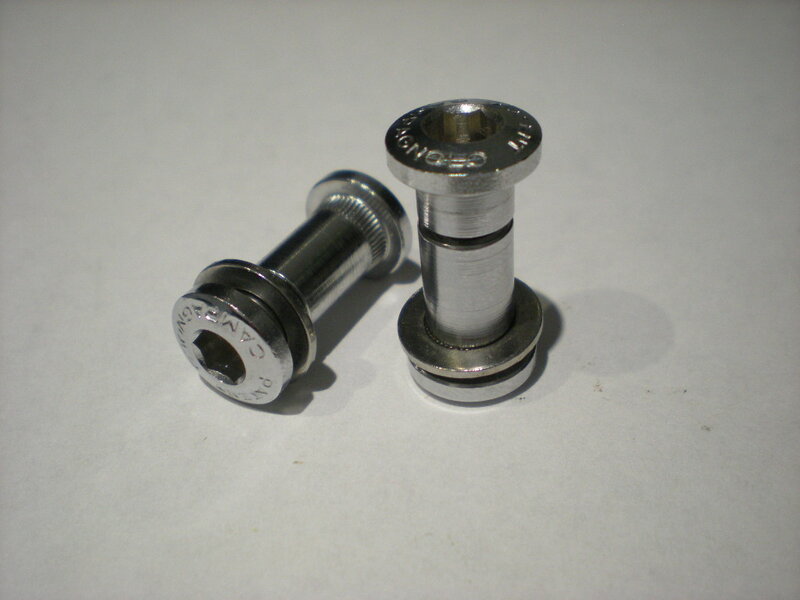 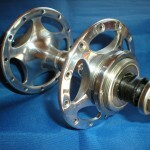 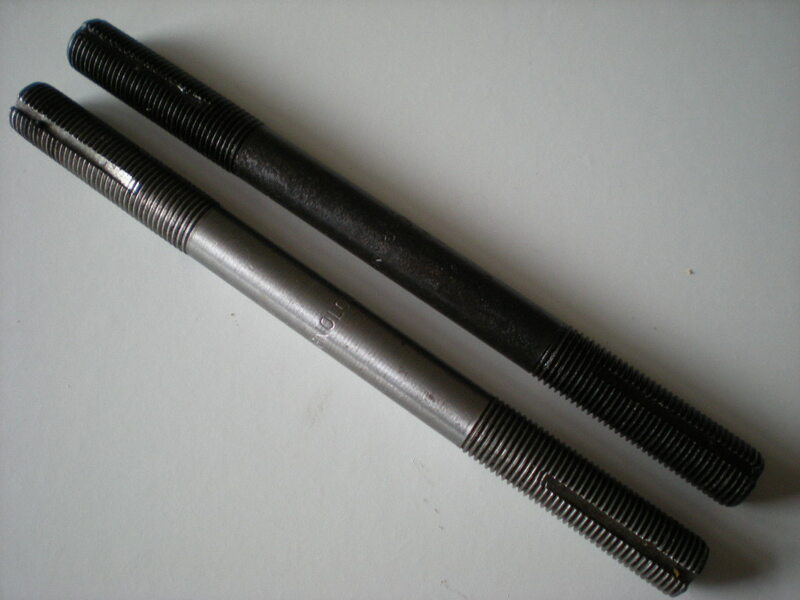 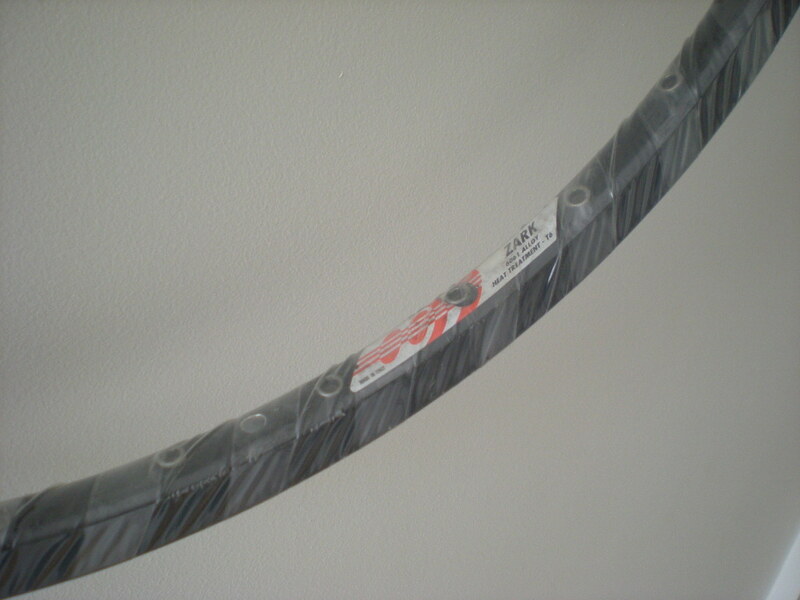 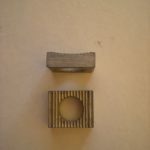 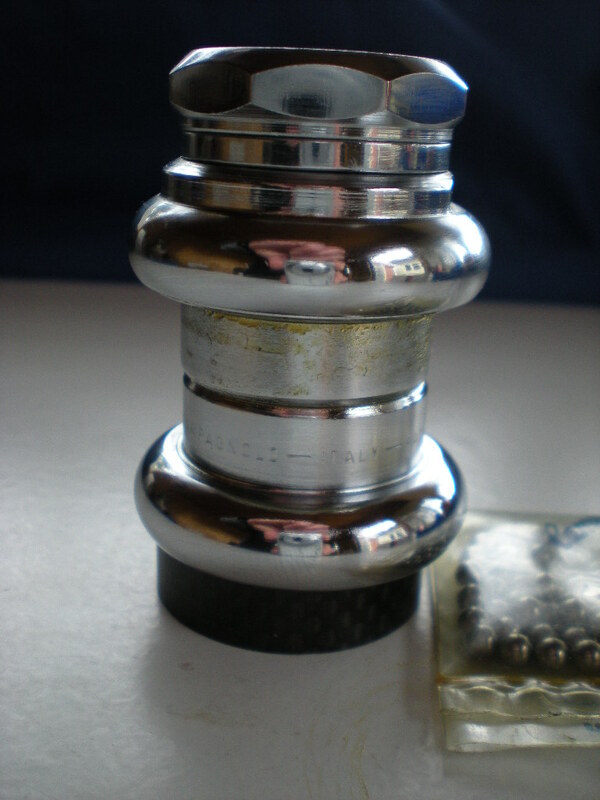 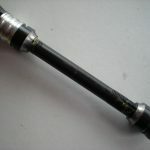 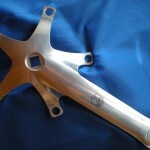 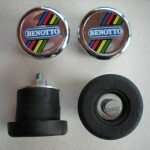 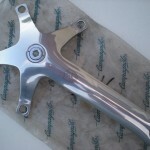 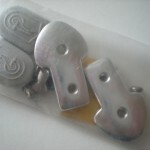 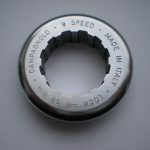 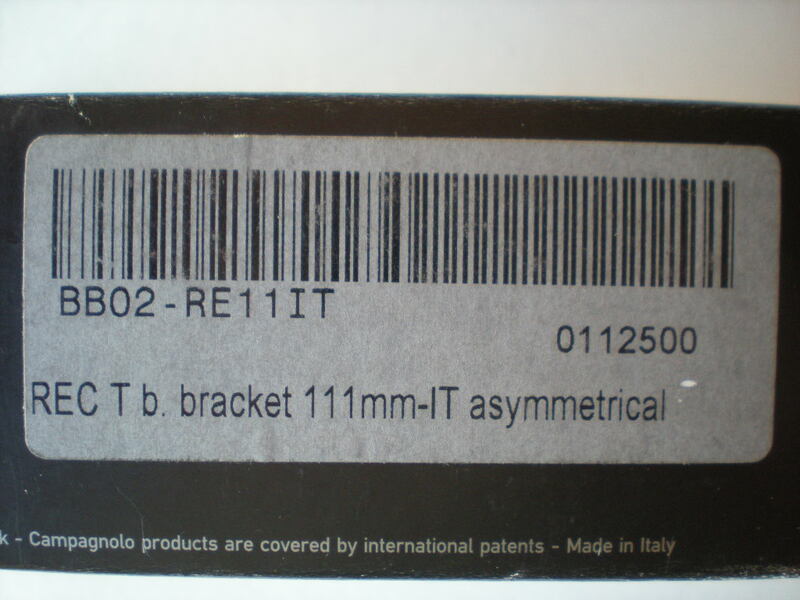 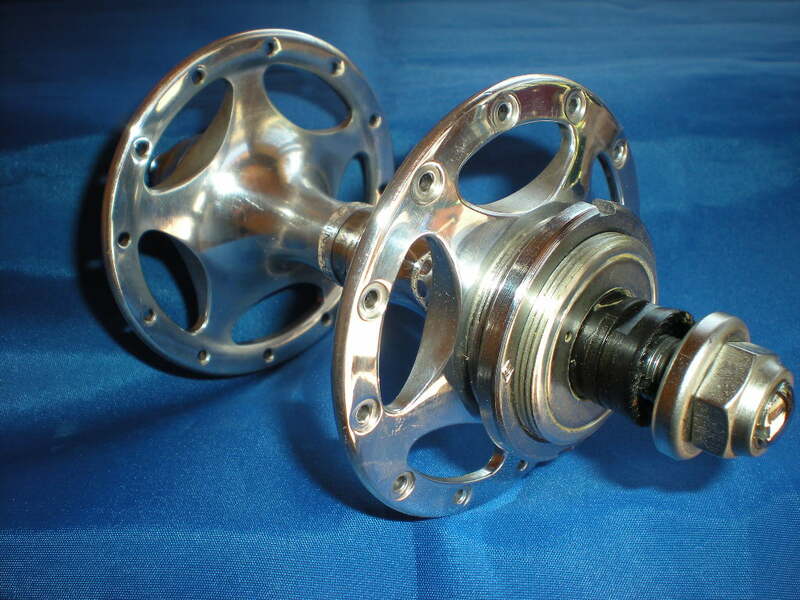 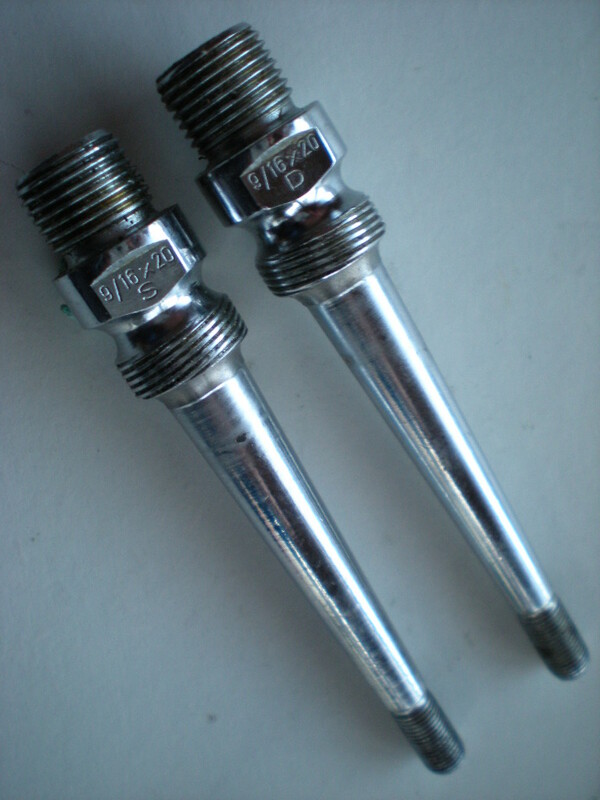 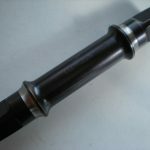 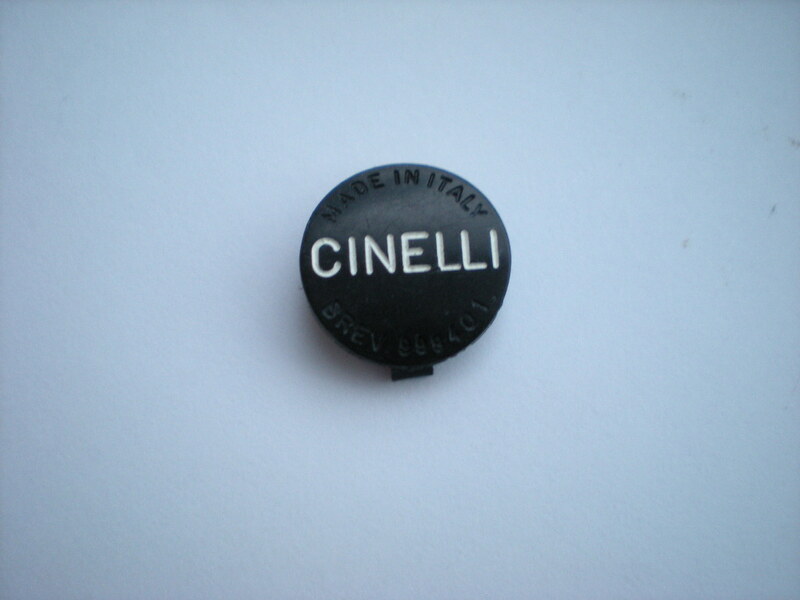 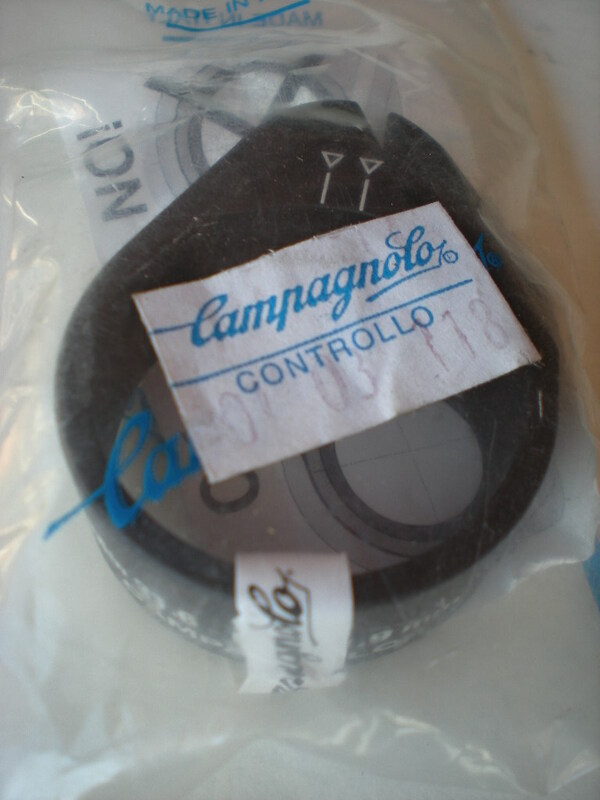 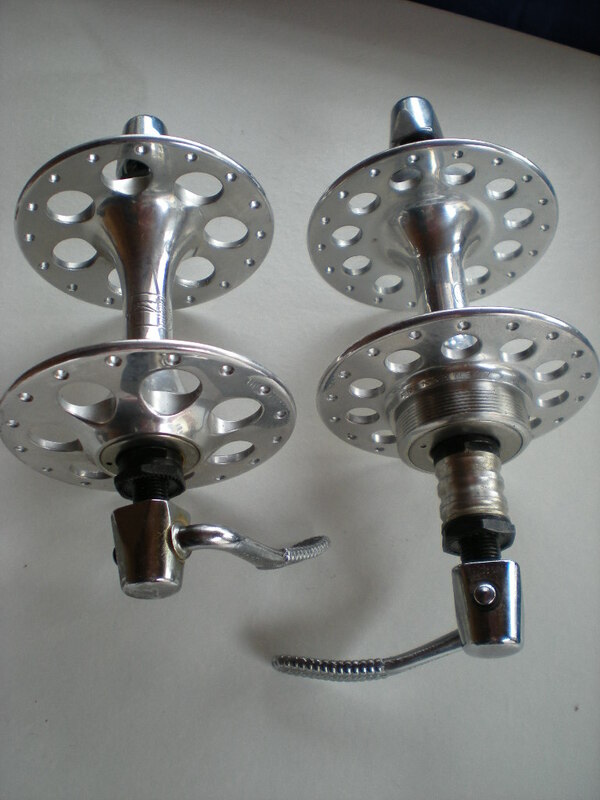 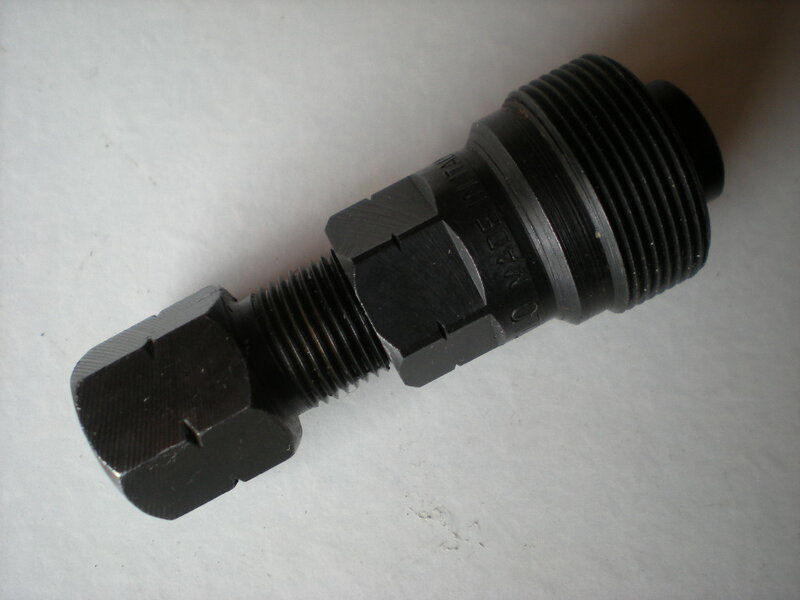 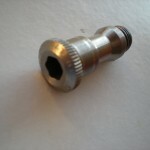 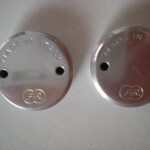 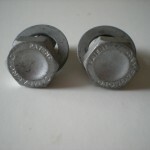 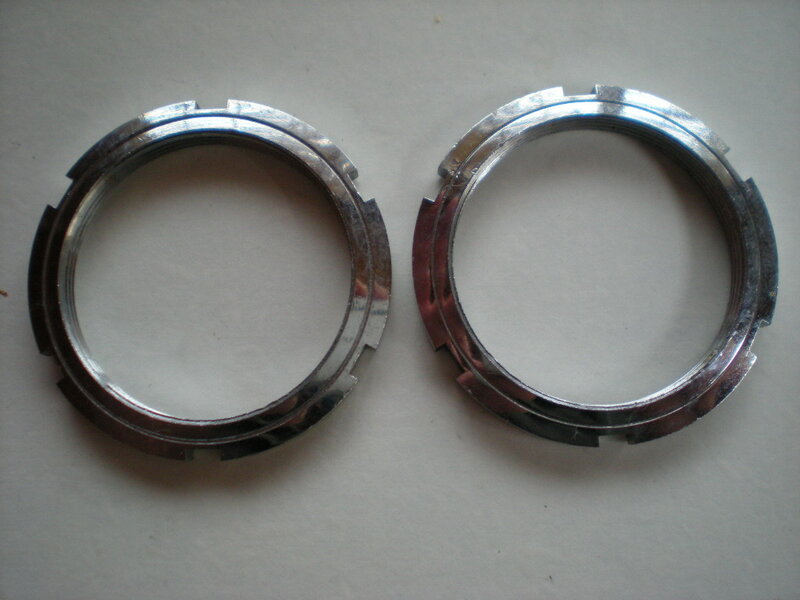 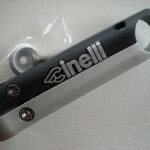 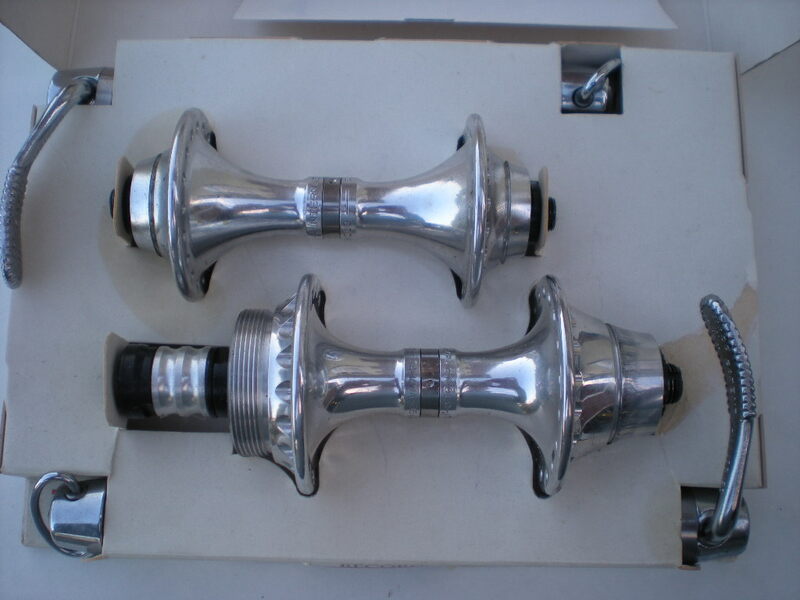 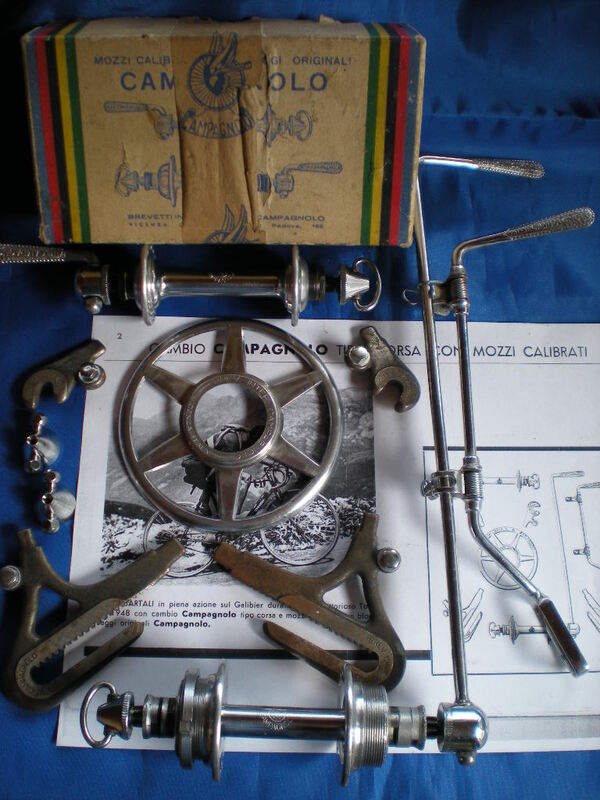 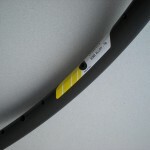 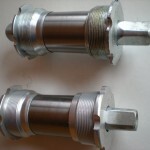 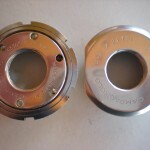 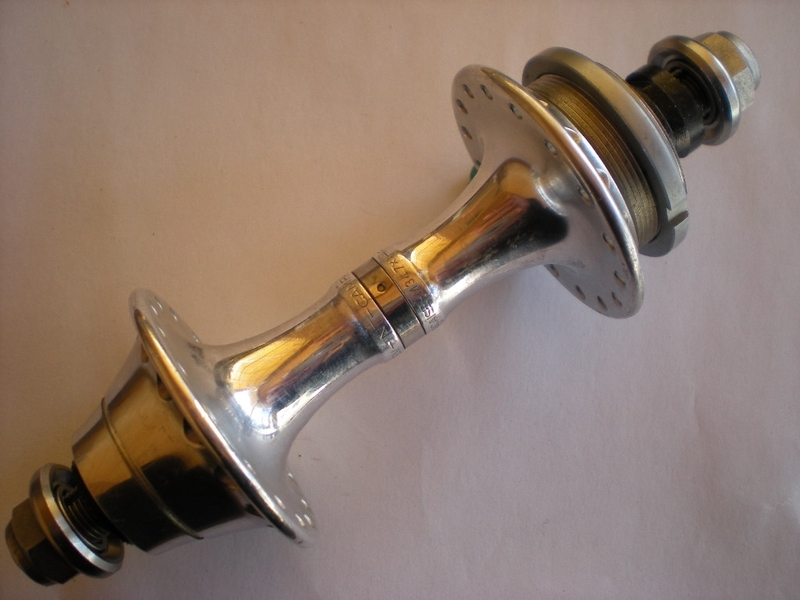 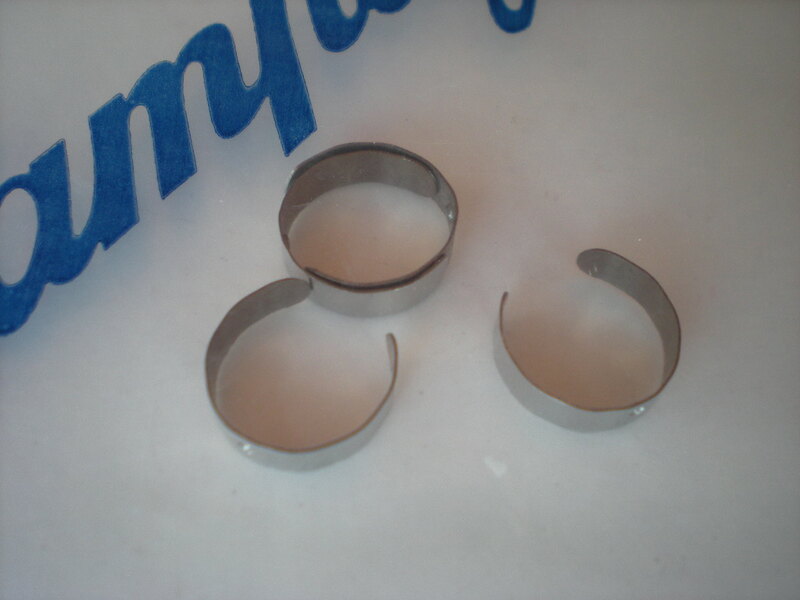 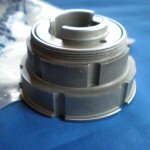 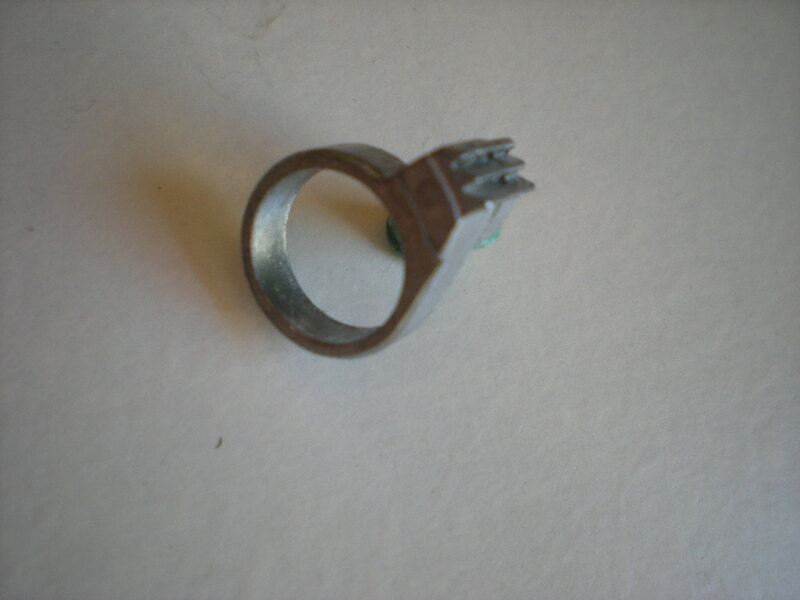 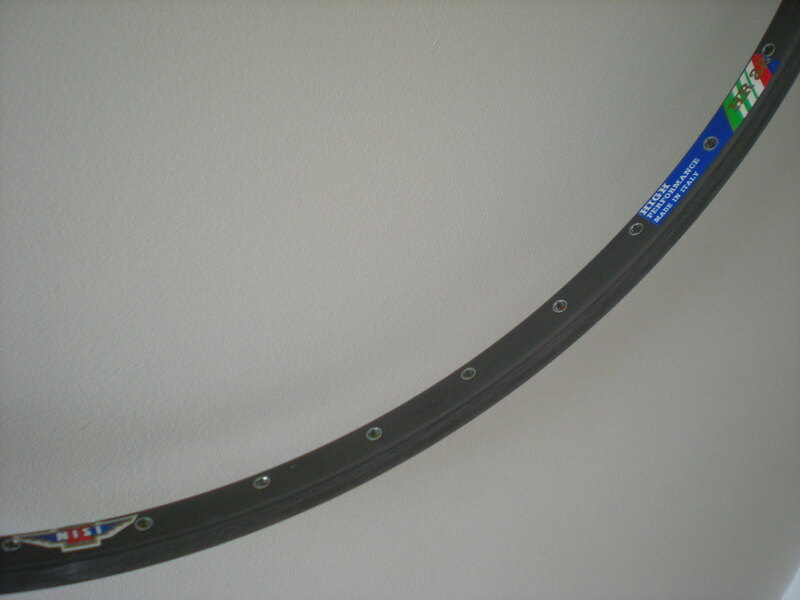 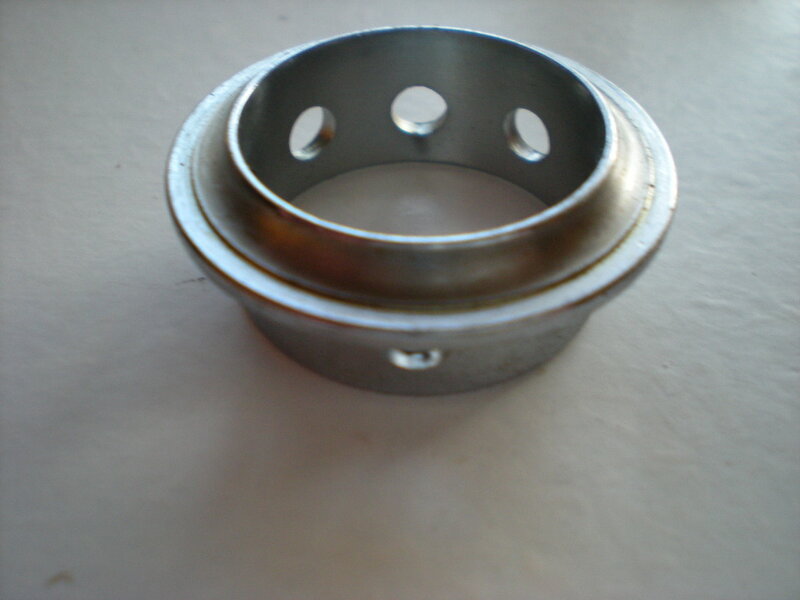 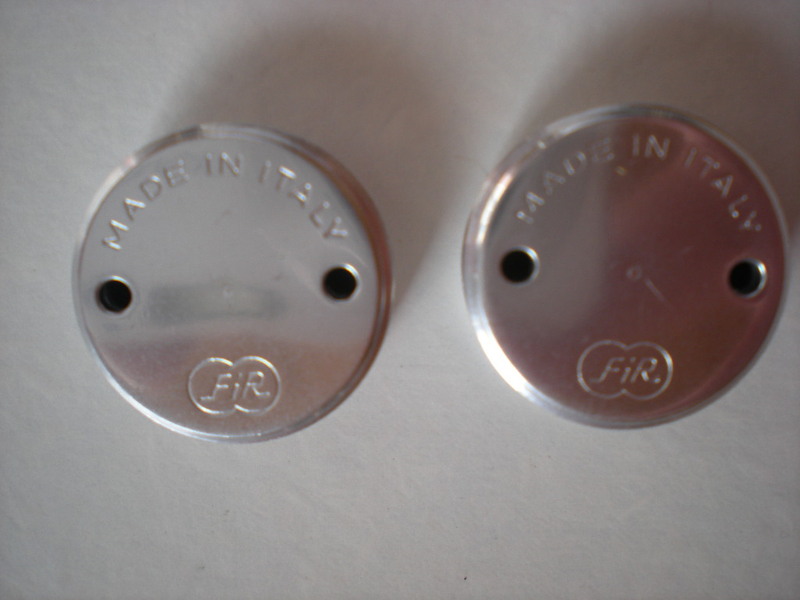 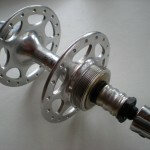 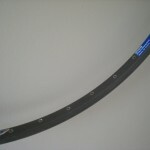 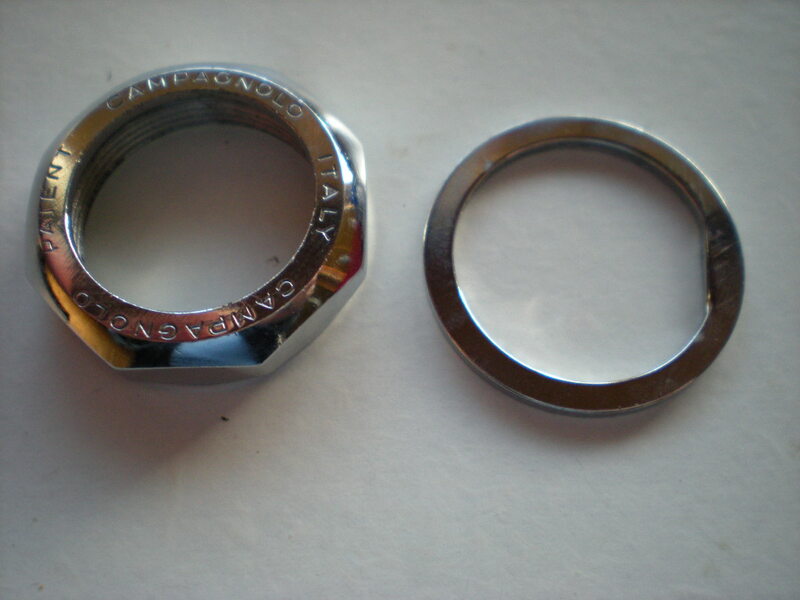 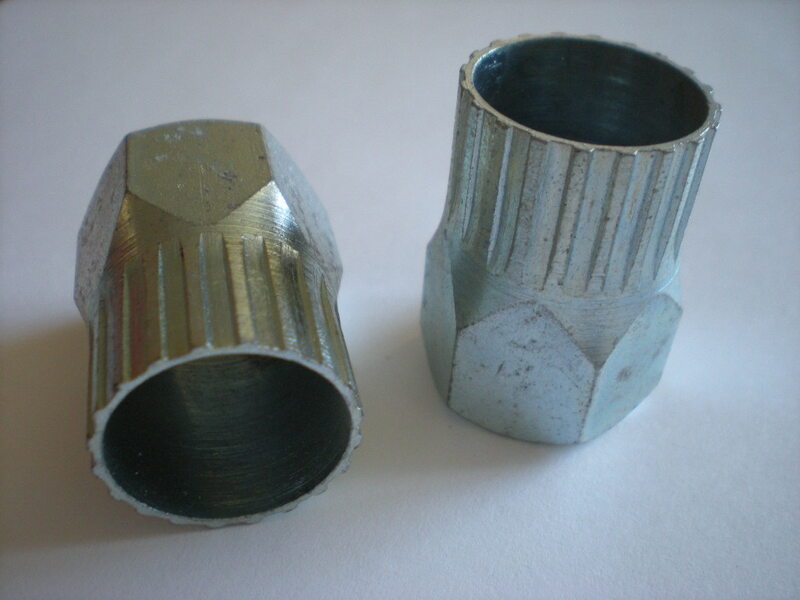 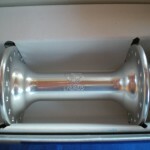 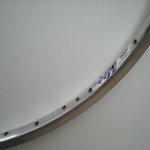 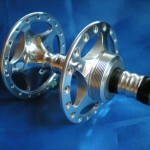 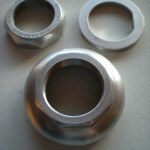 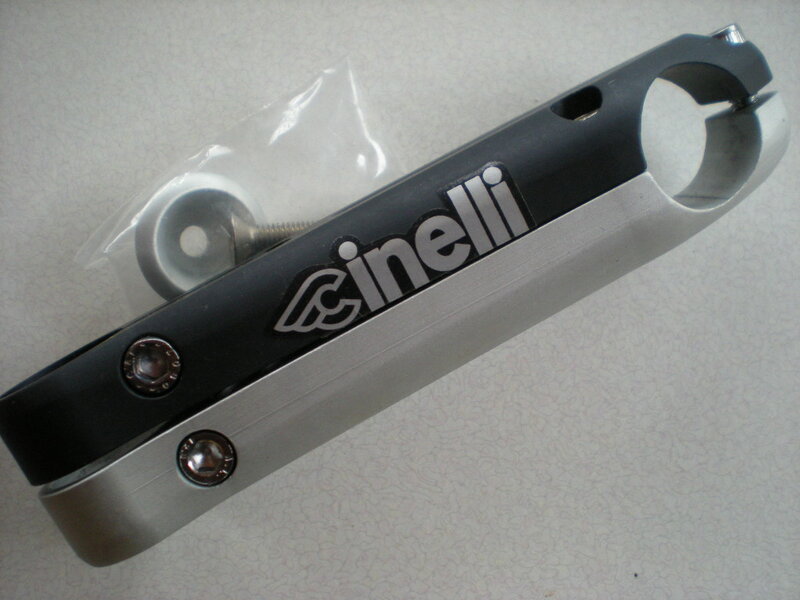 does not fit Valentino and Rally 1st gen.
Campagnolo BB cup: NRecord steel thick wall left/adjustable ITAL thread £15. 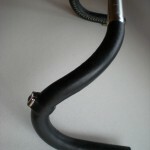 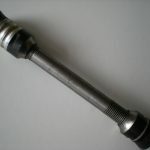 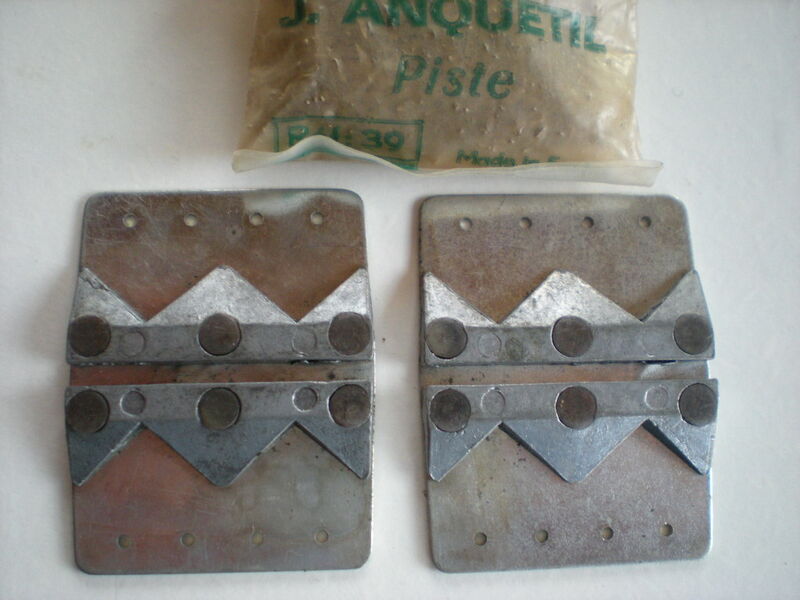 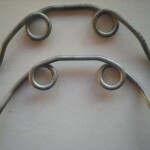 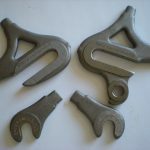 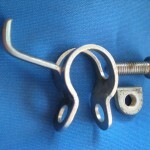 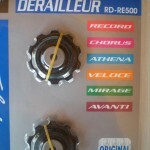 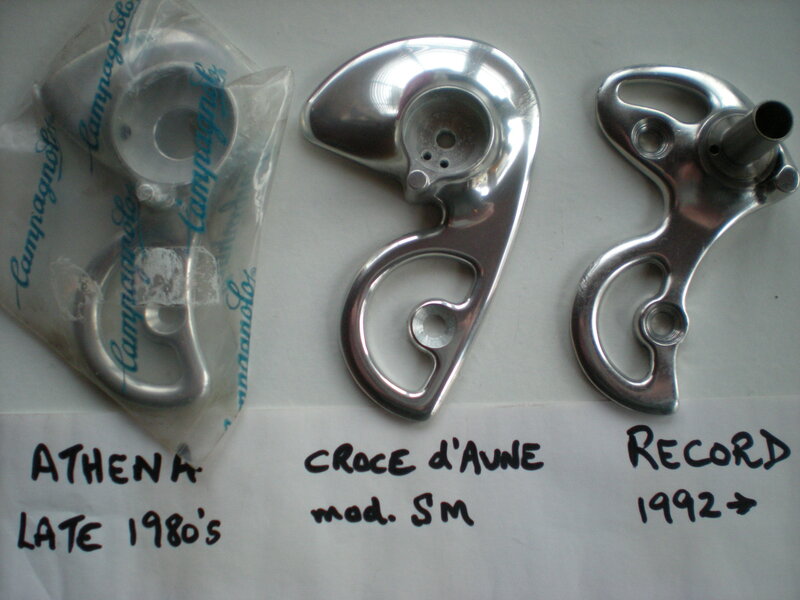 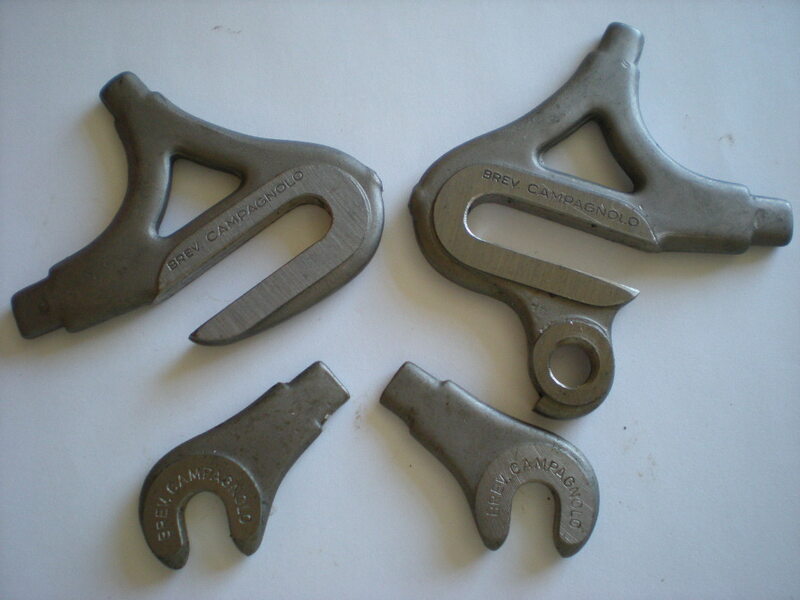 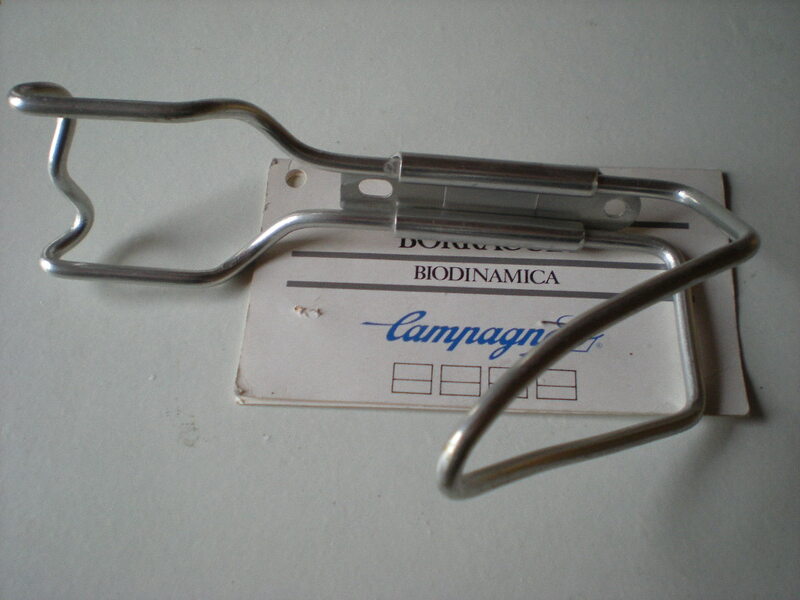 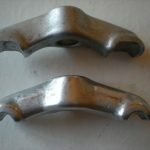 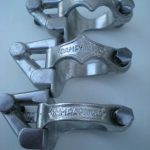 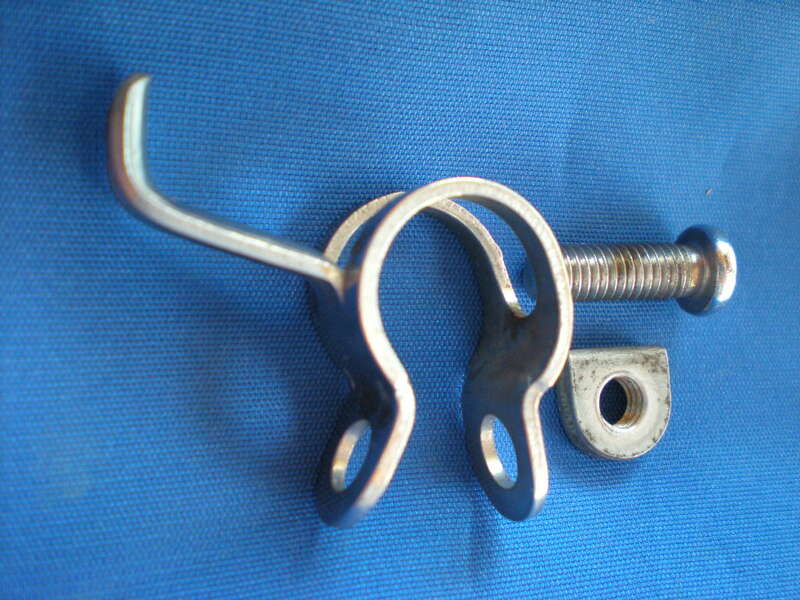 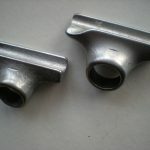 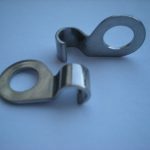 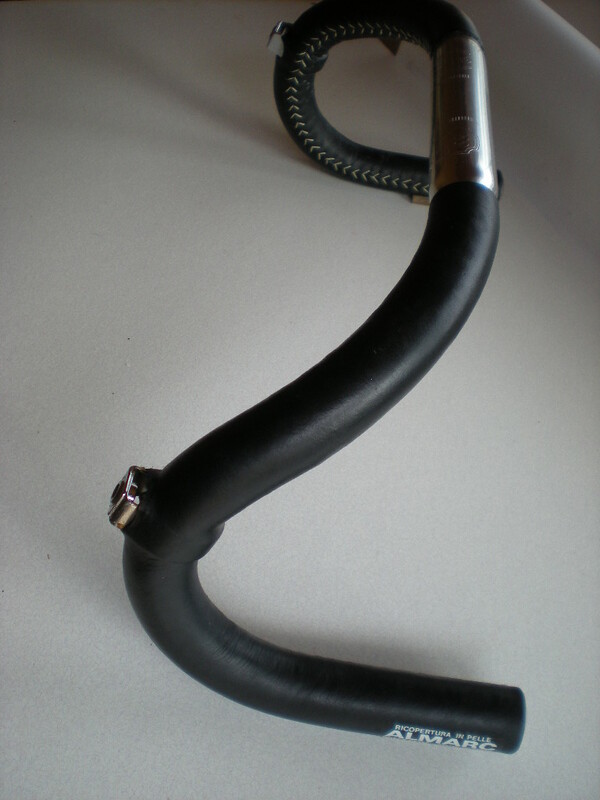 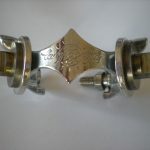 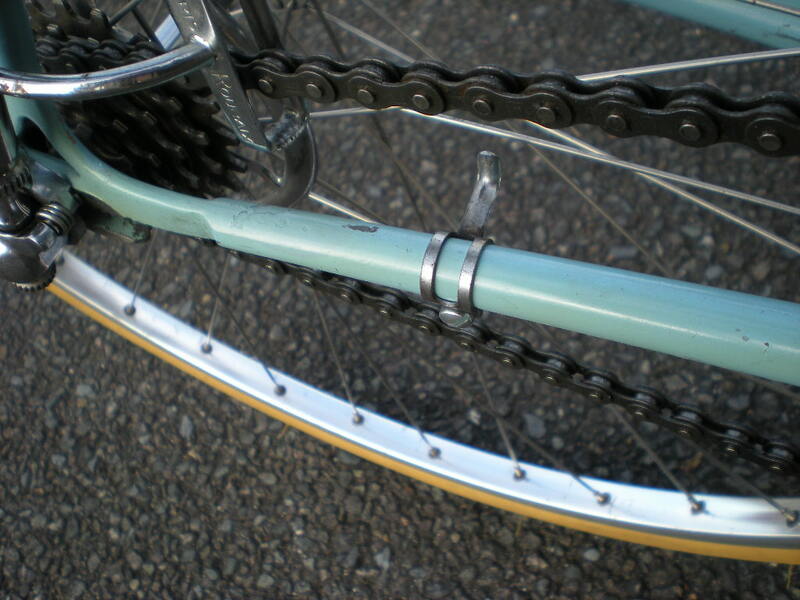 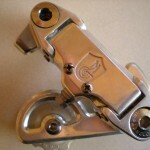 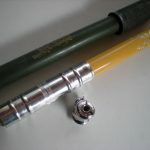 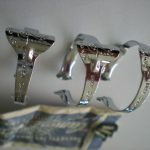 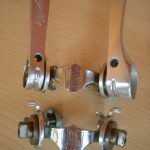 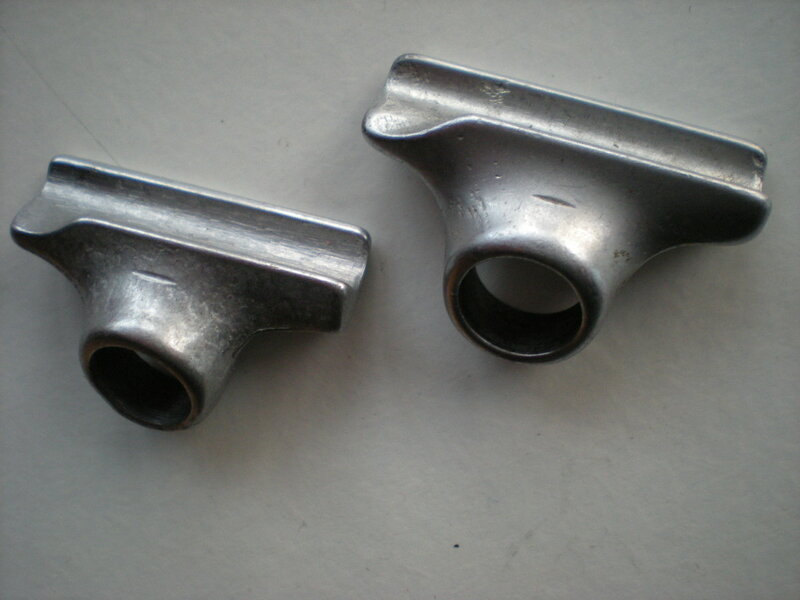 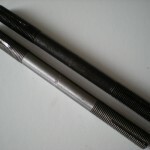 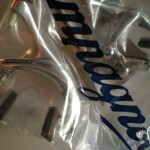 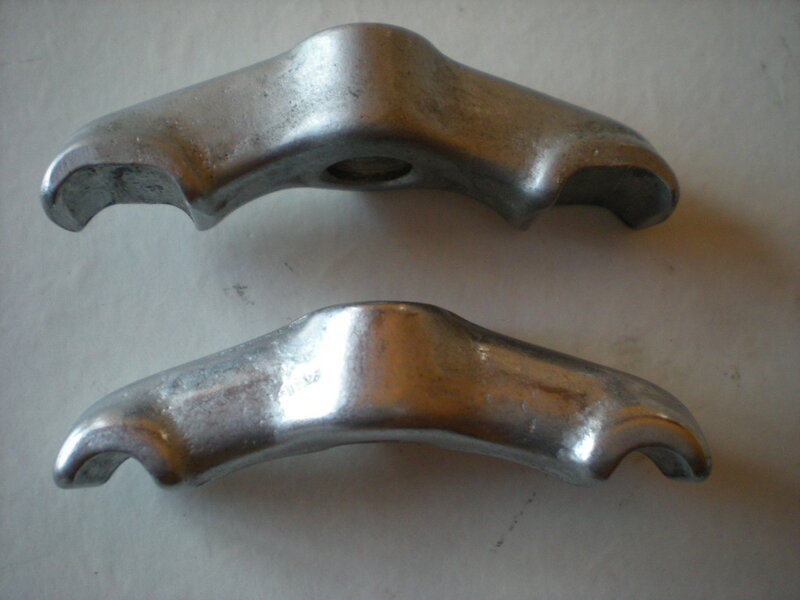 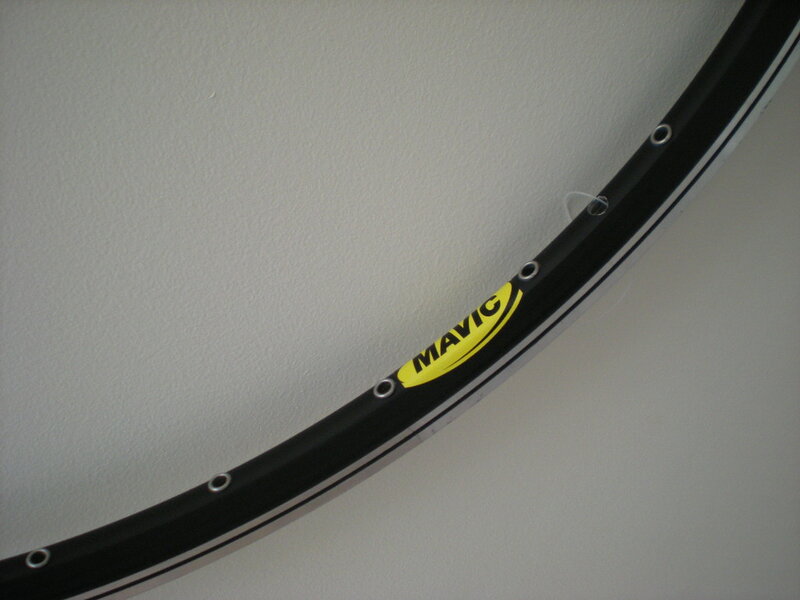 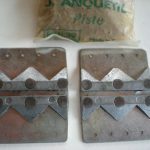 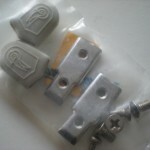 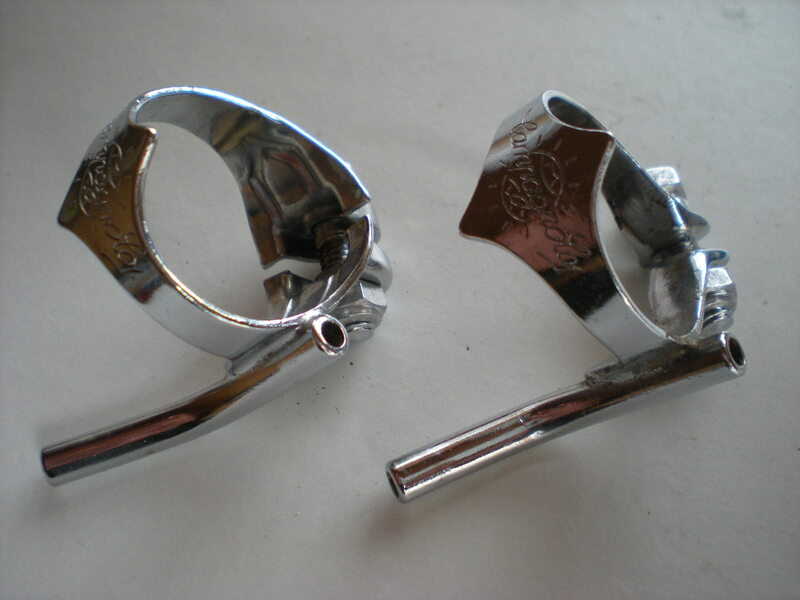 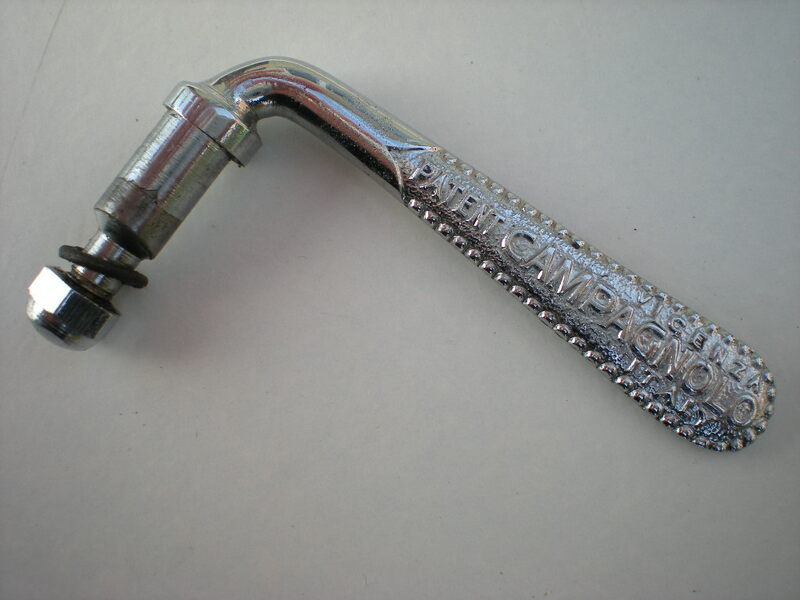 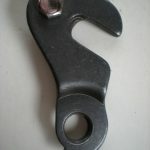 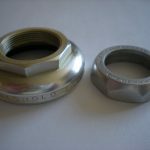 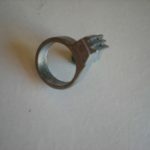 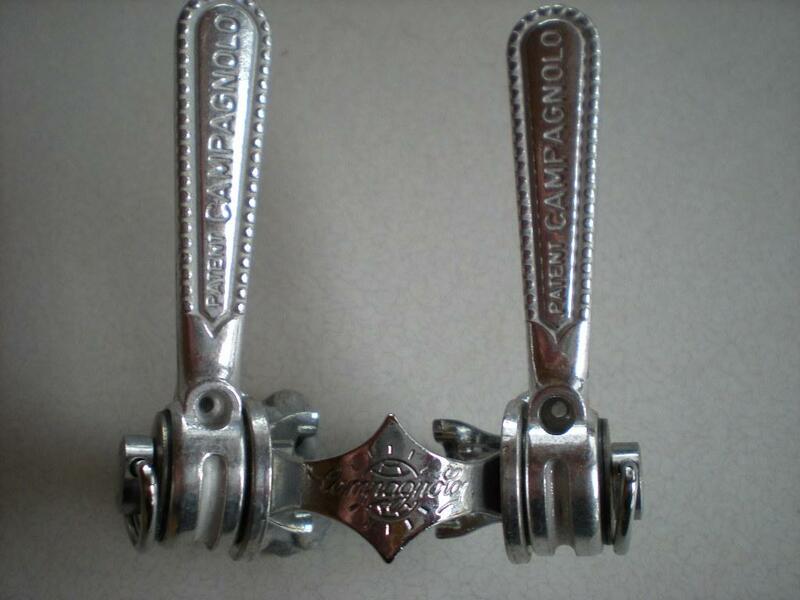 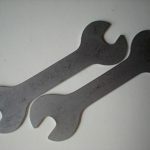 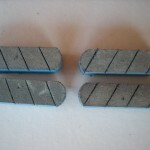 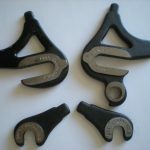 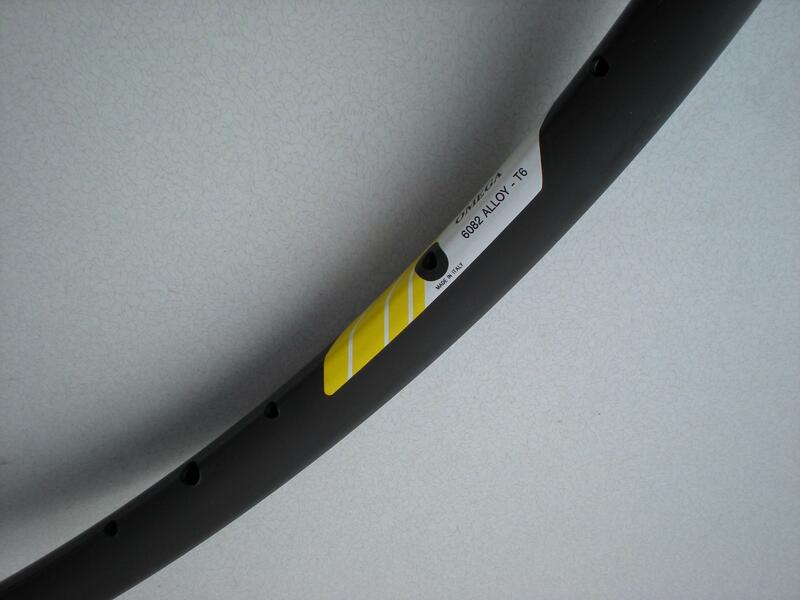 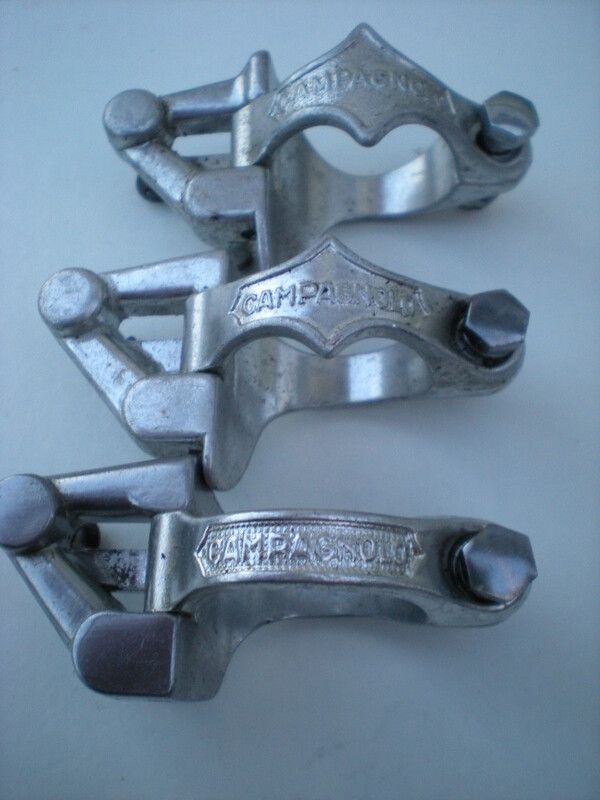 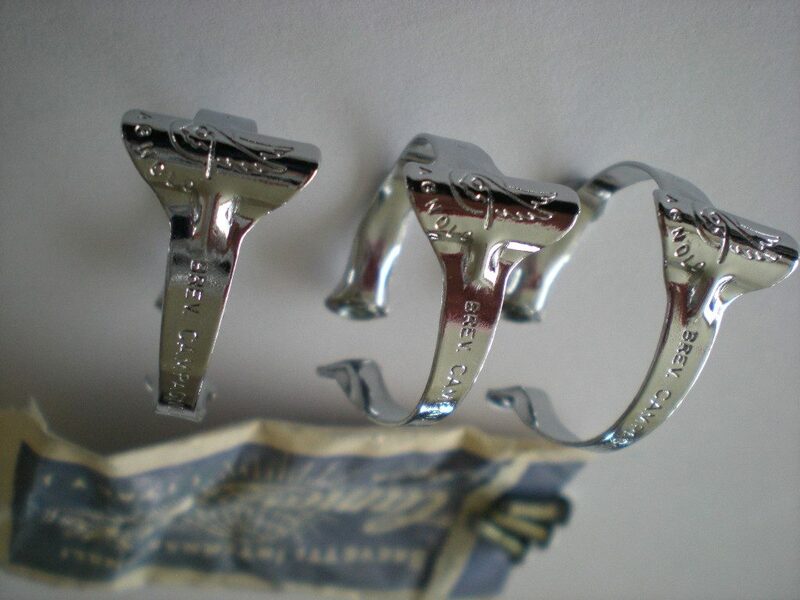 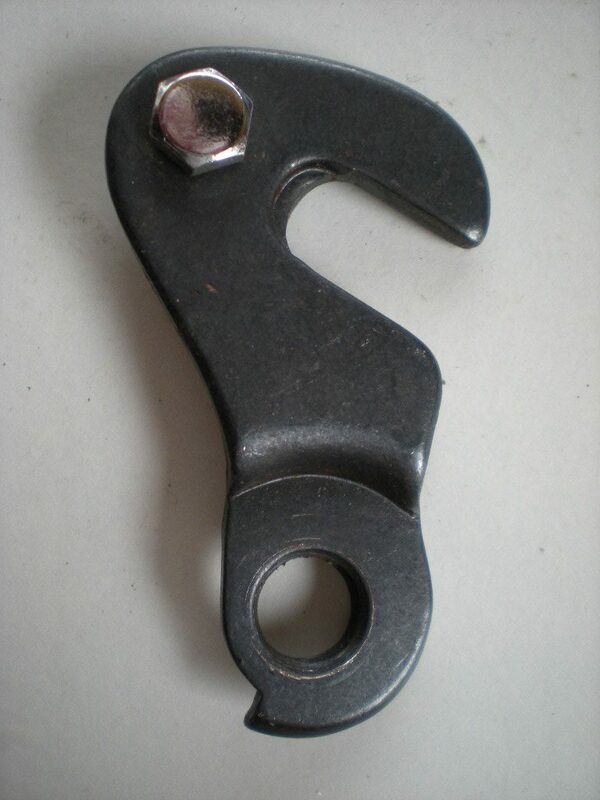 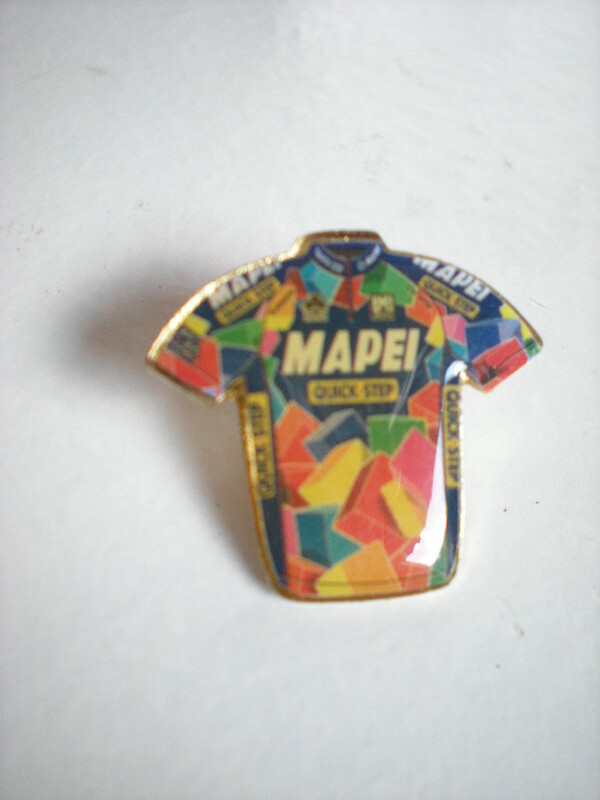 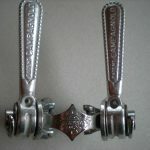 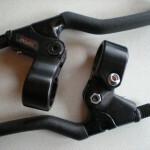 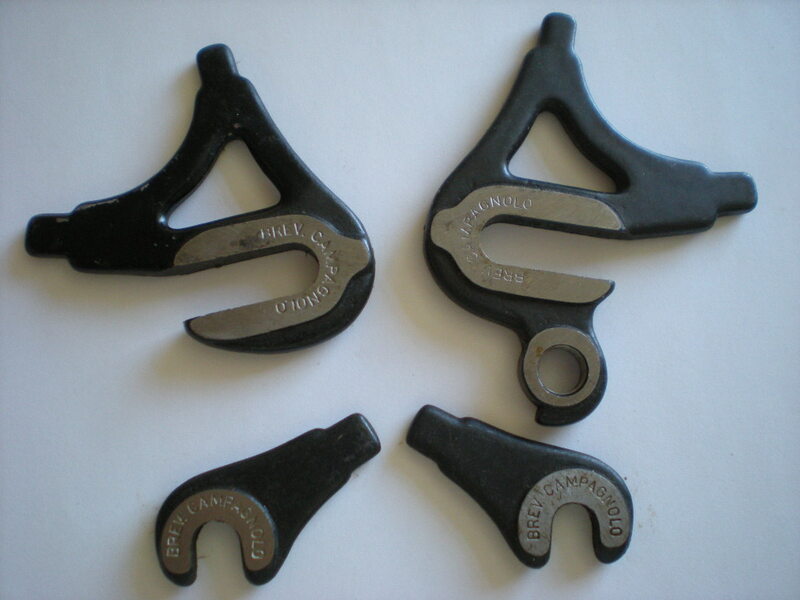 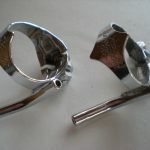 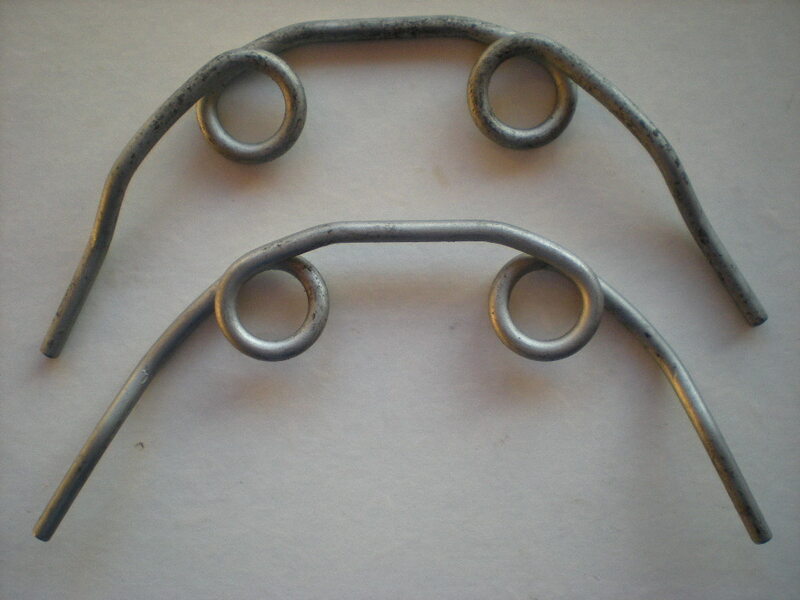 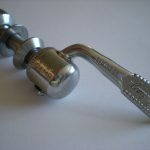 A chain hook clip-to-chainstay part# 40 & 41 to the Paris-Roubaix rod type gear change. 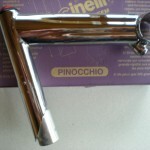 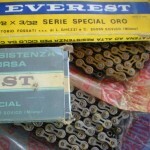 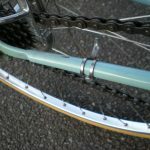 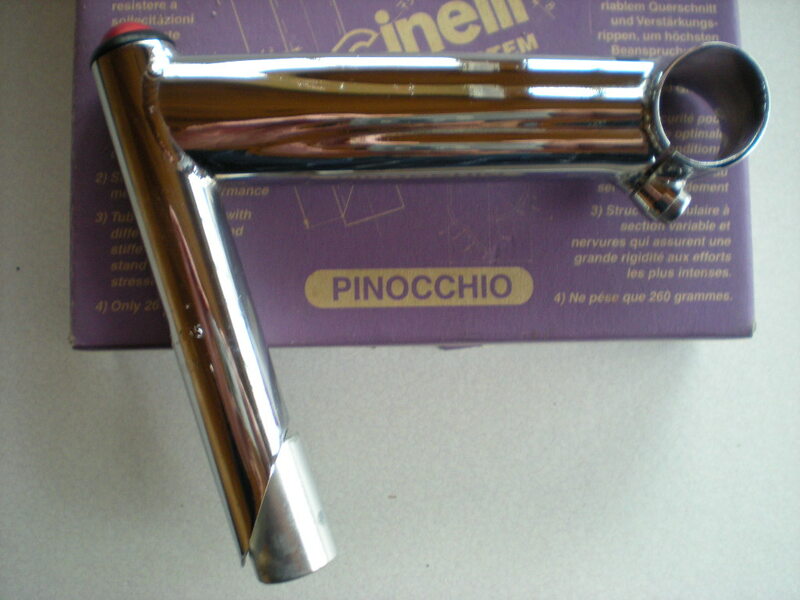 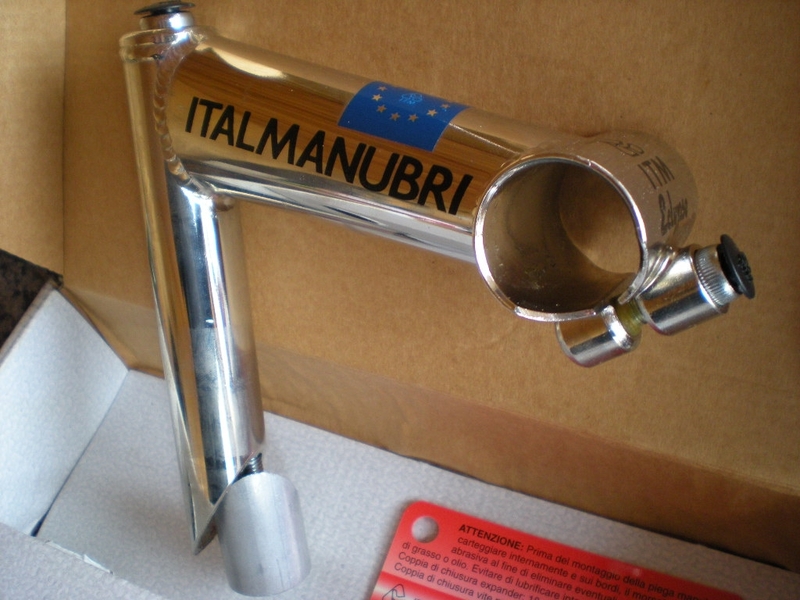 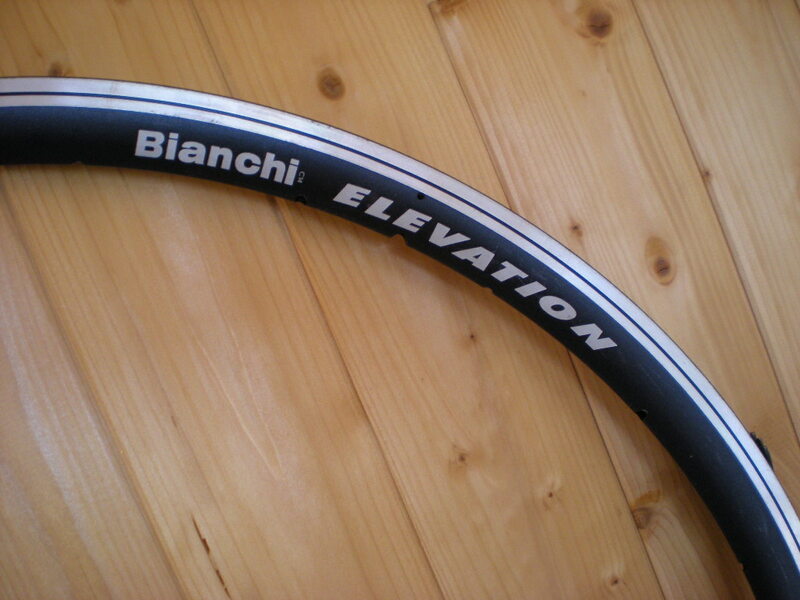 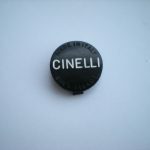 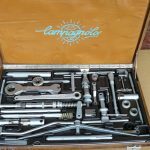 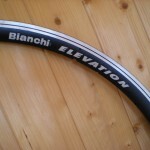 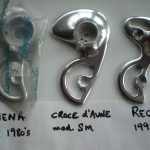 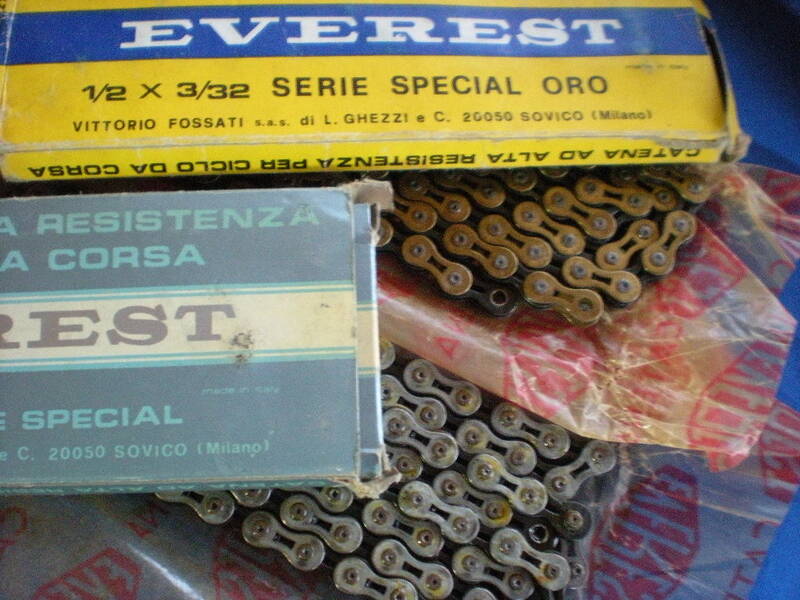 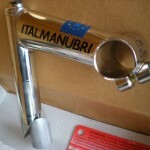 useful 26t for L'Eroica type rides! 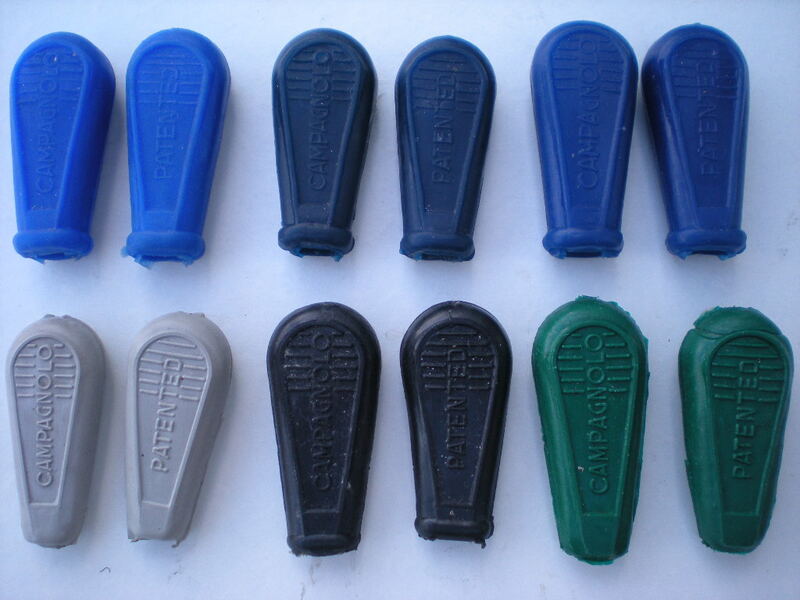 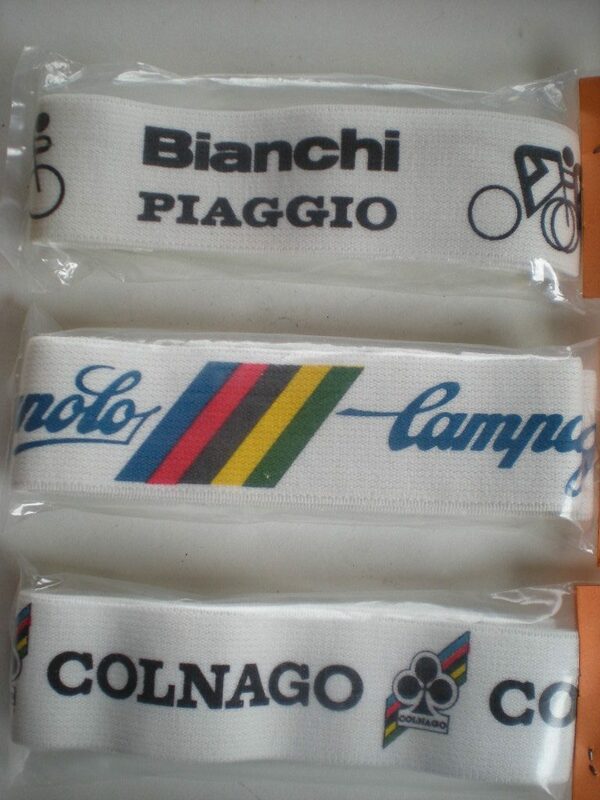 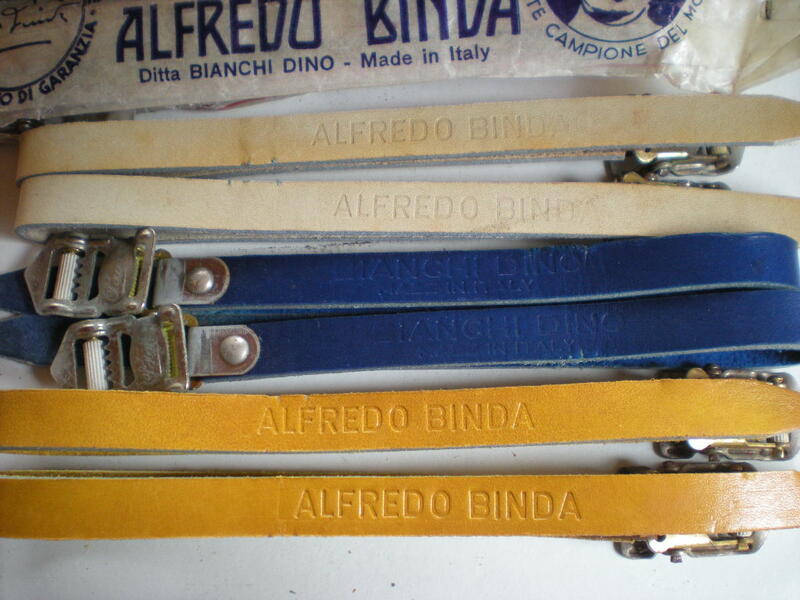 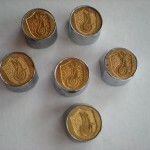 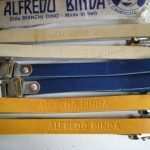 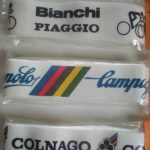 Trendy 1980’s head/sweat bands, NOS in sealed packets – obviously! 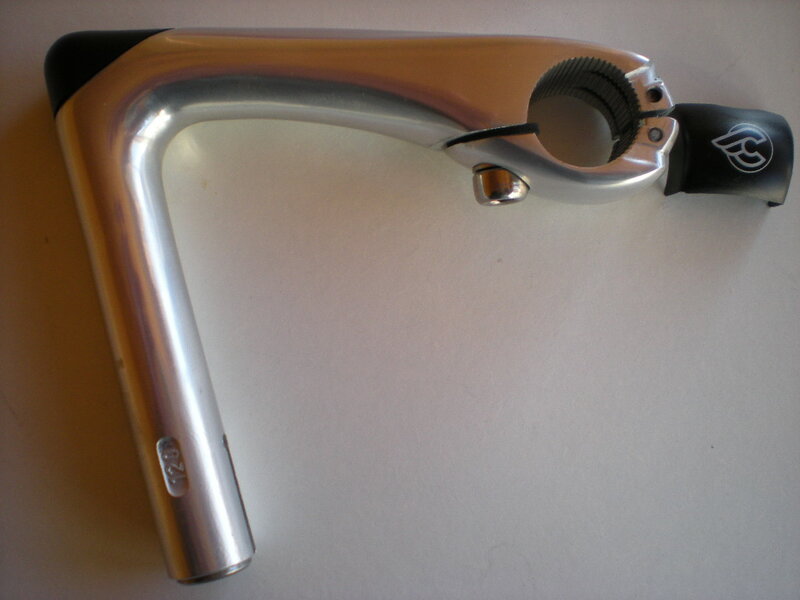 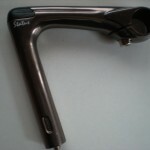 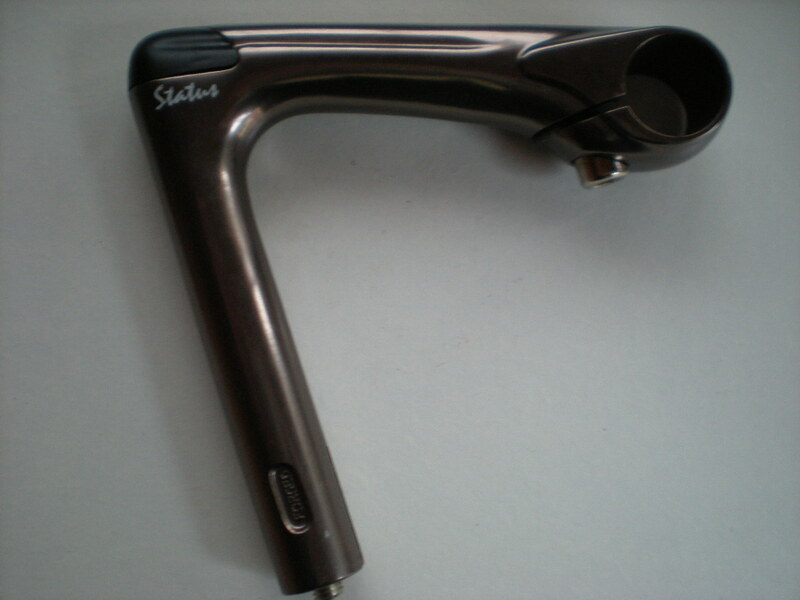 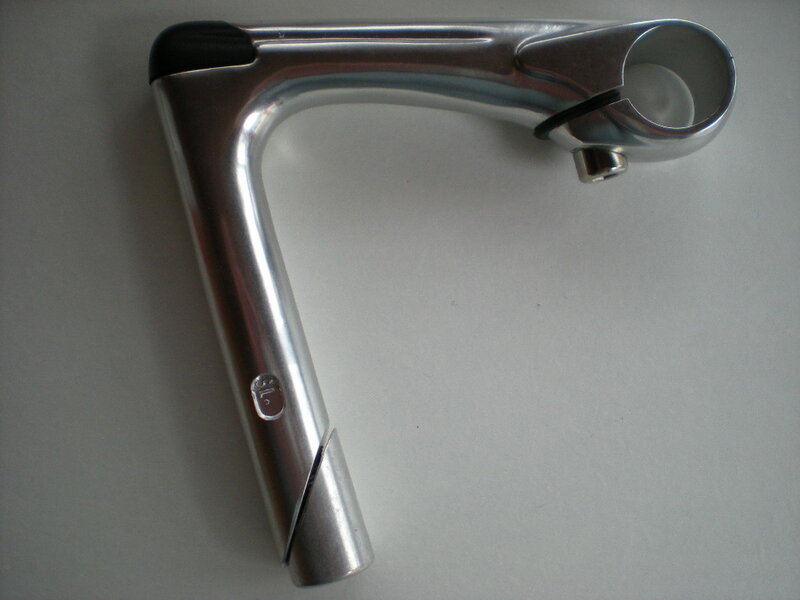 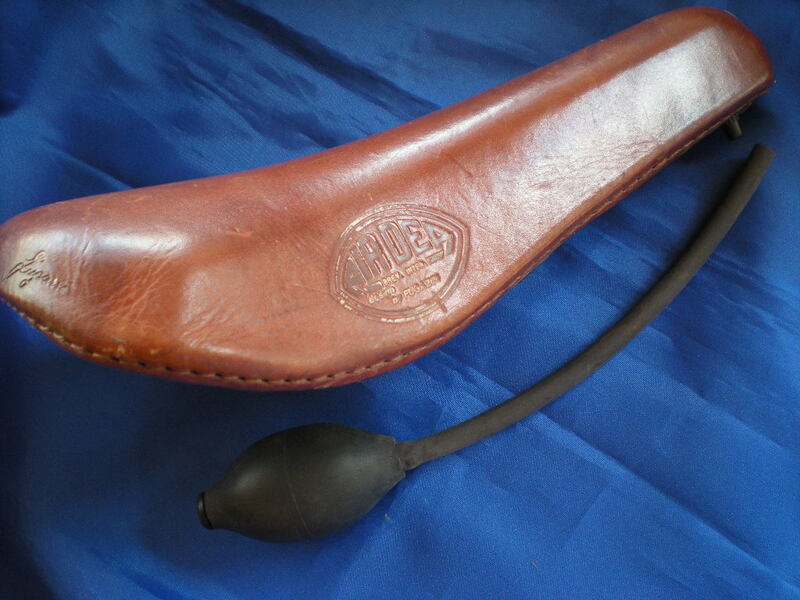 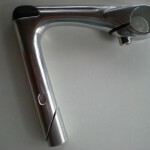 SILCA IMPERO pump with Flat top handle and Silca’s own head to valve. 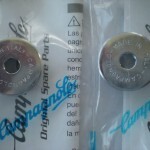 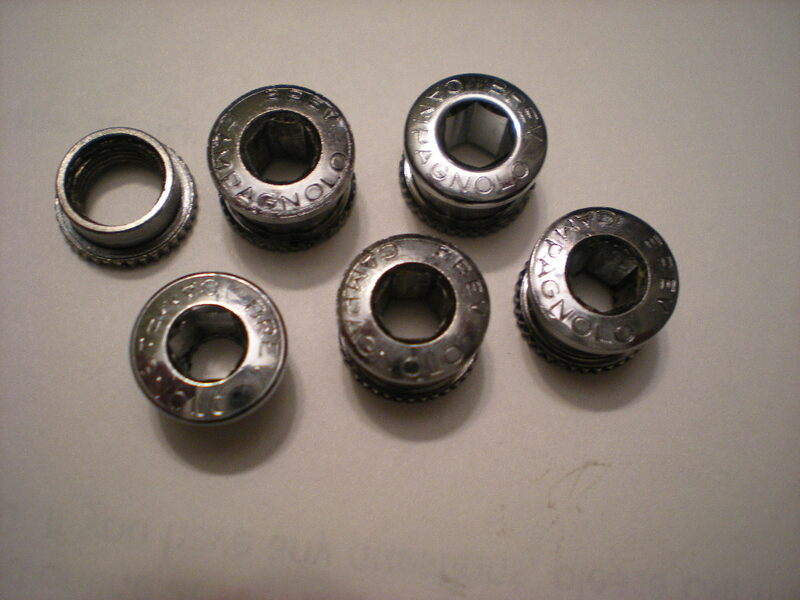 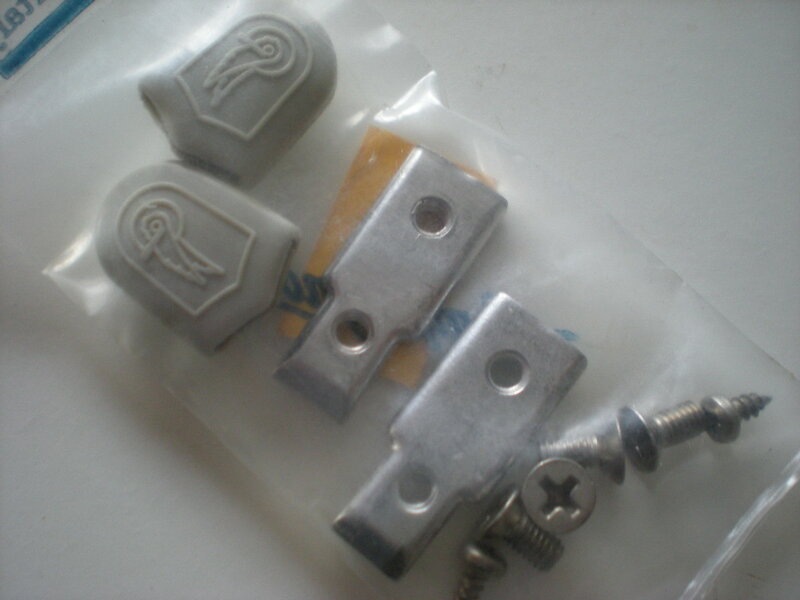 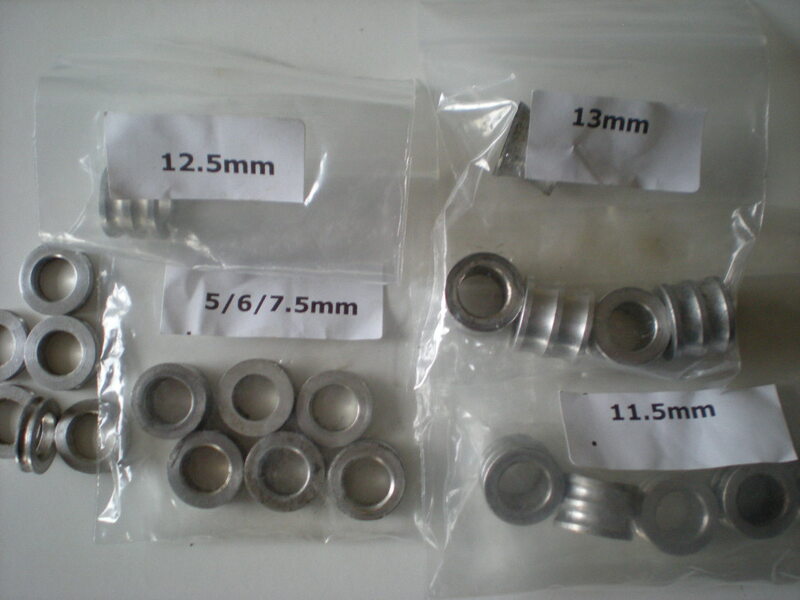 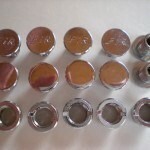 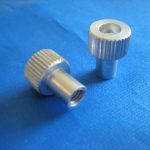 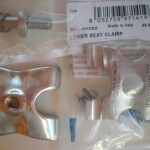 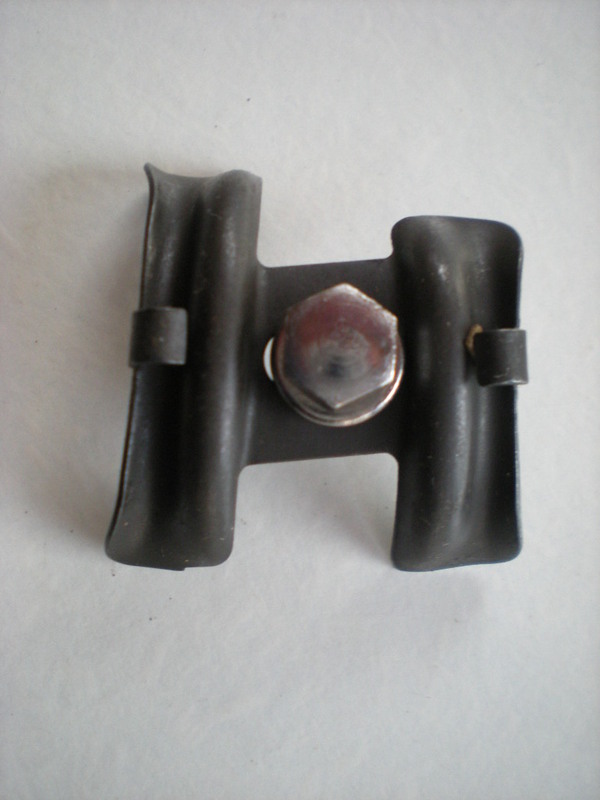 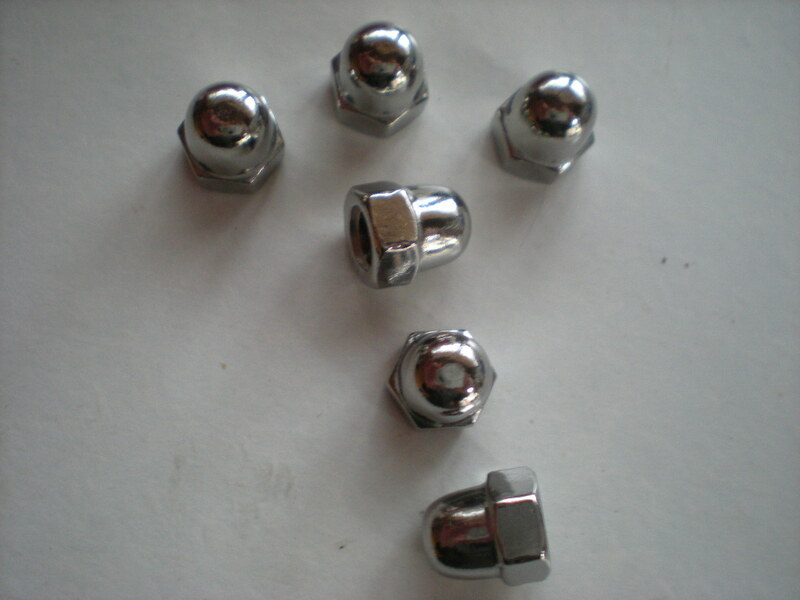 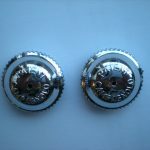 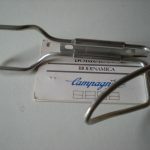 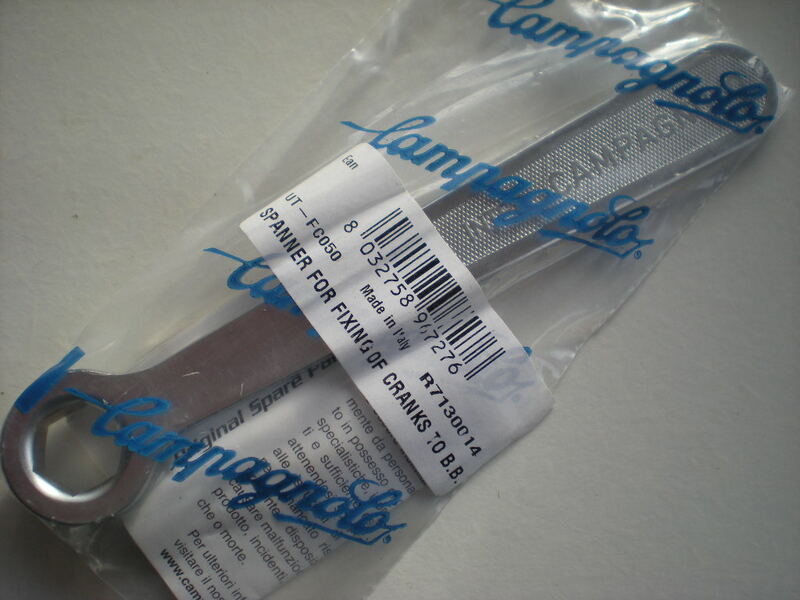 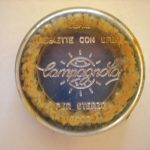 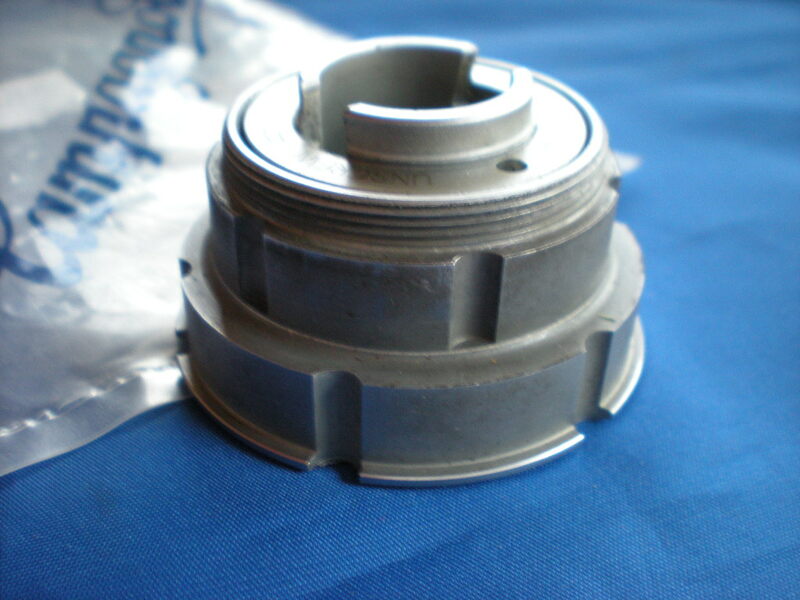 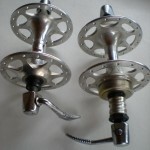 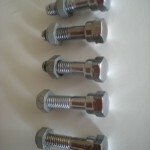 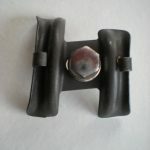 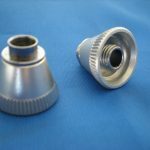 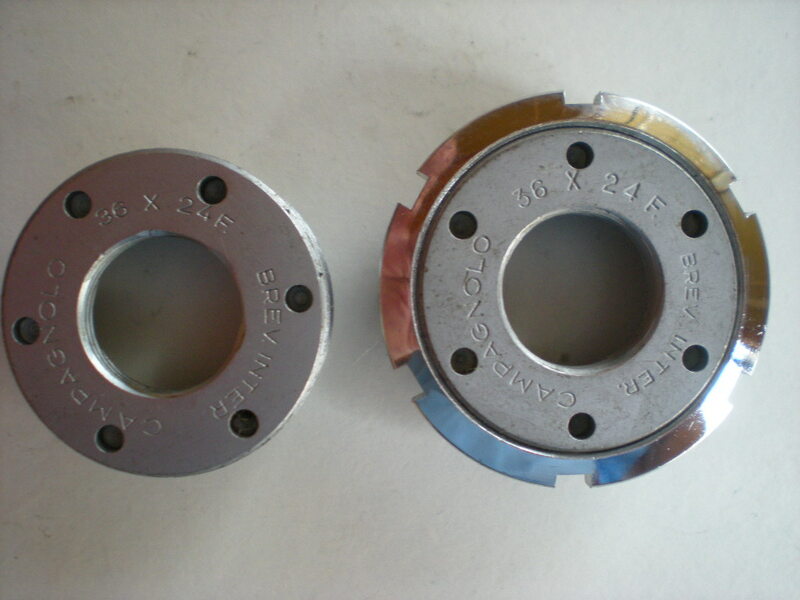 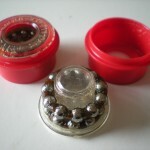 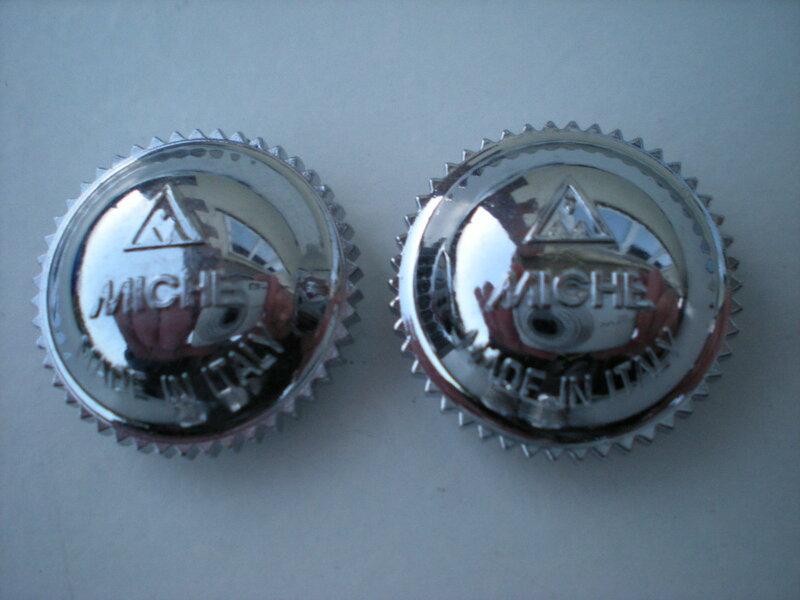 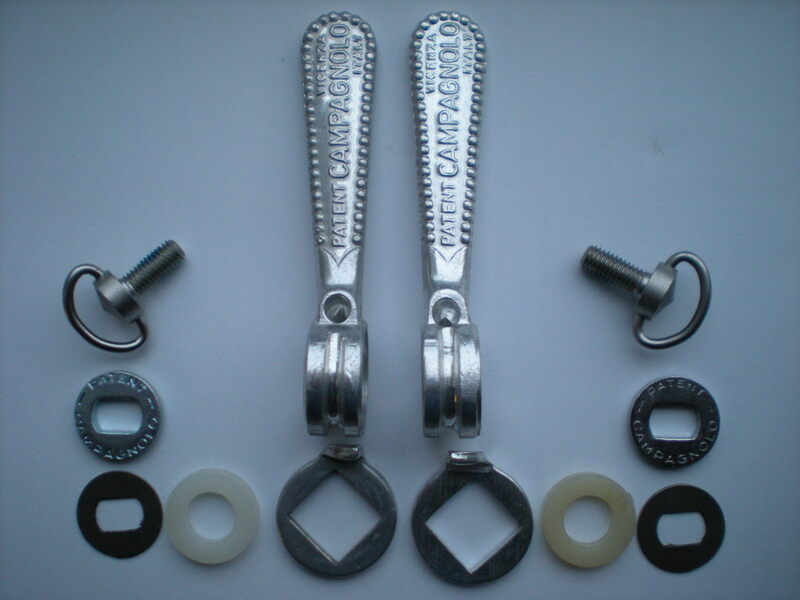 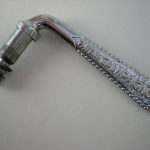 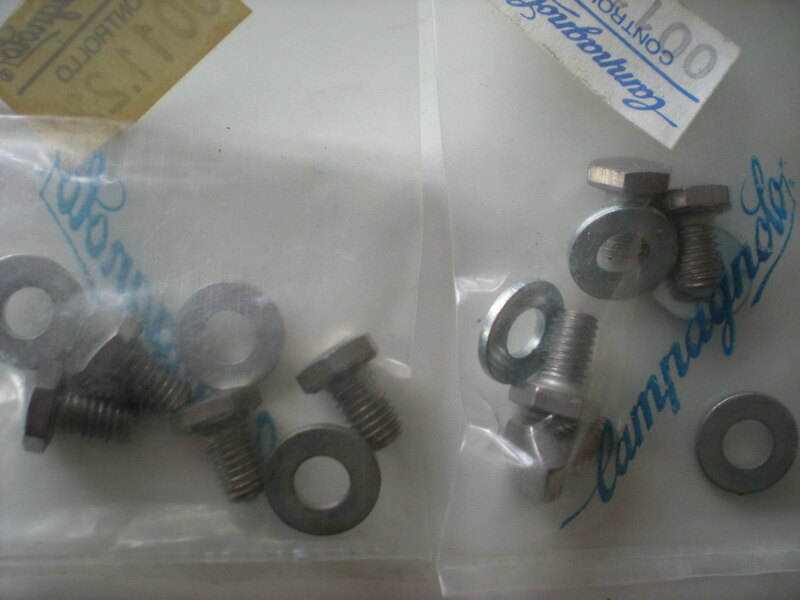 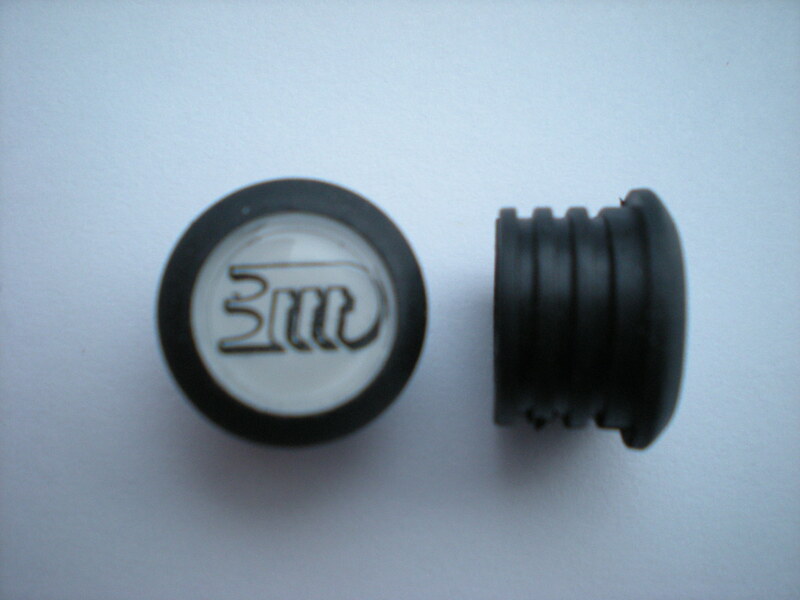 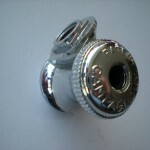 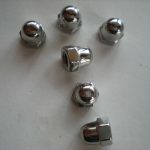 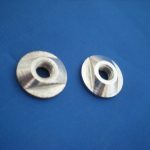 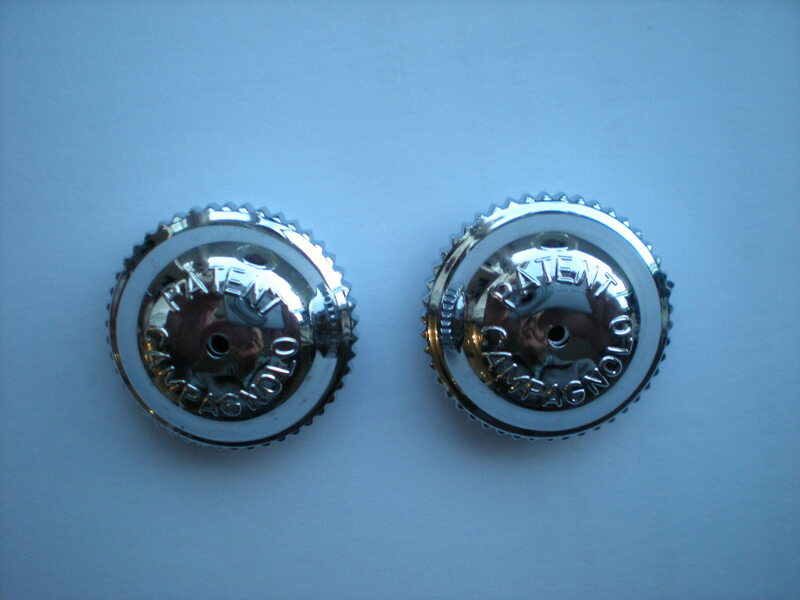 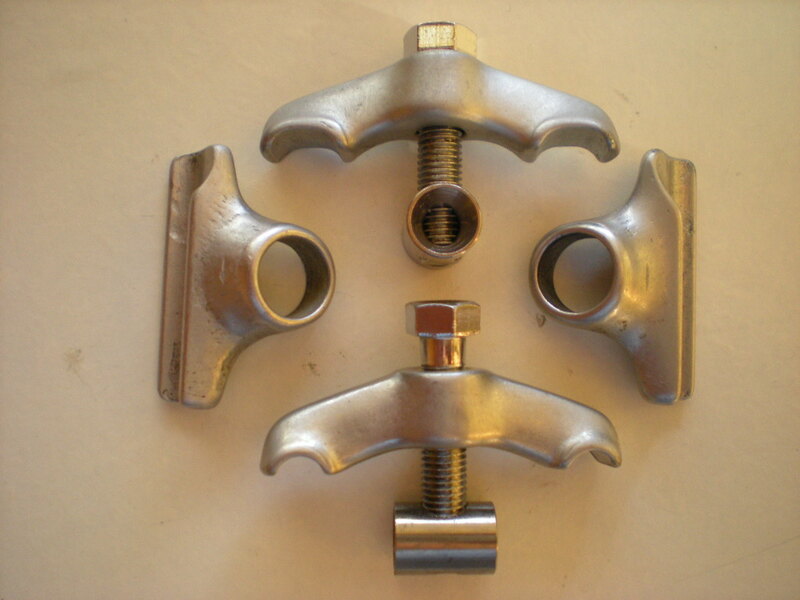 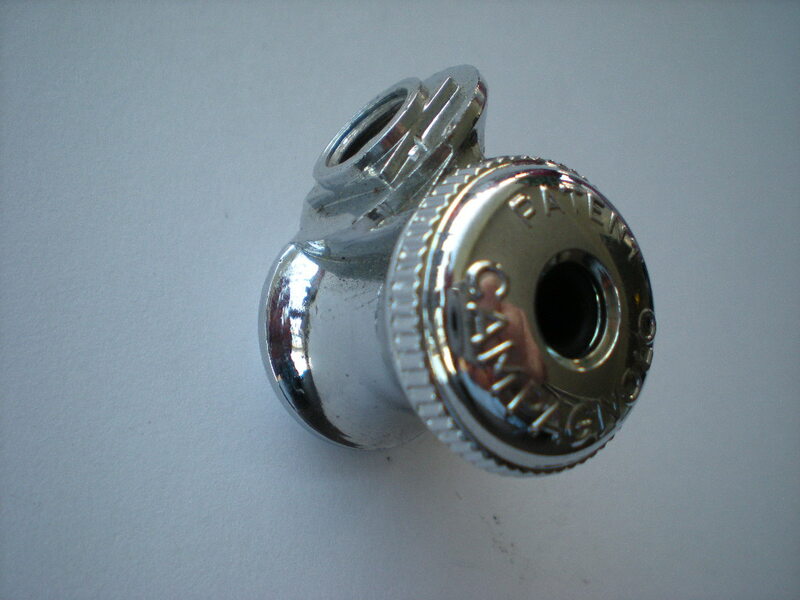 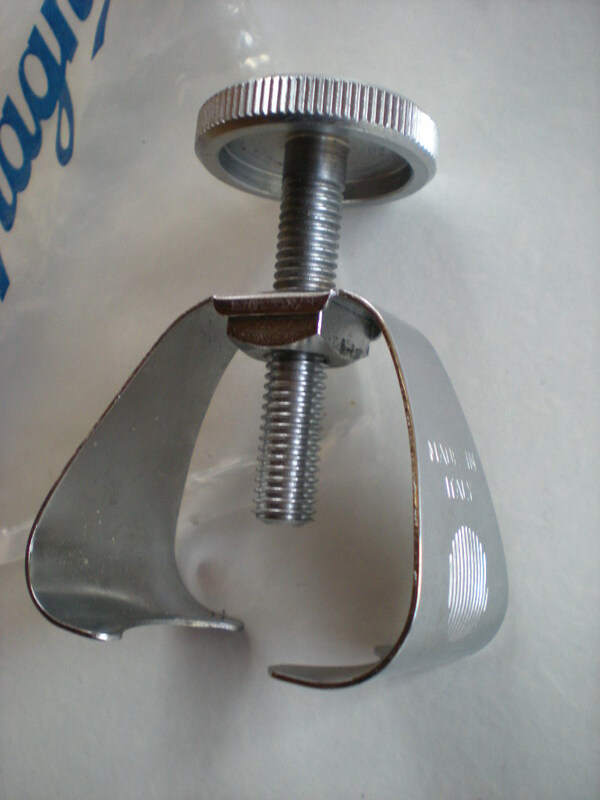 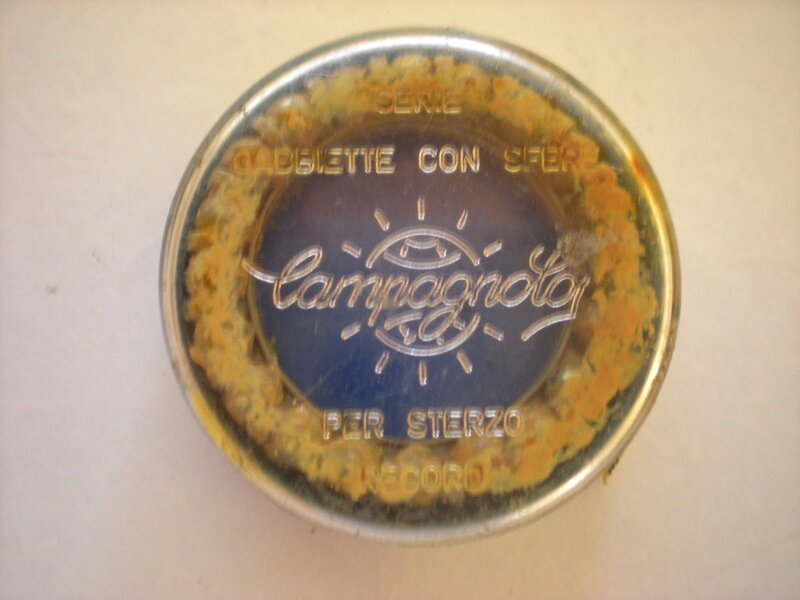 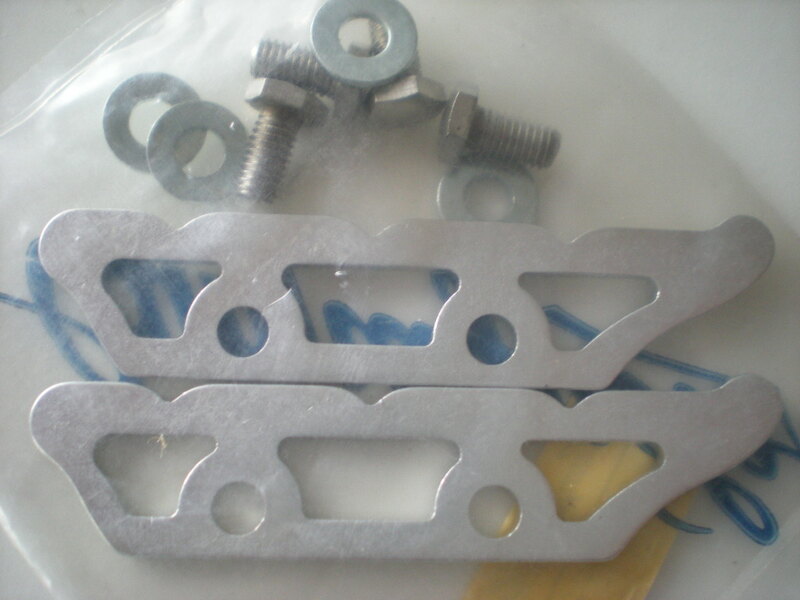 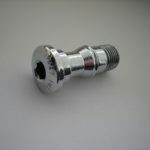 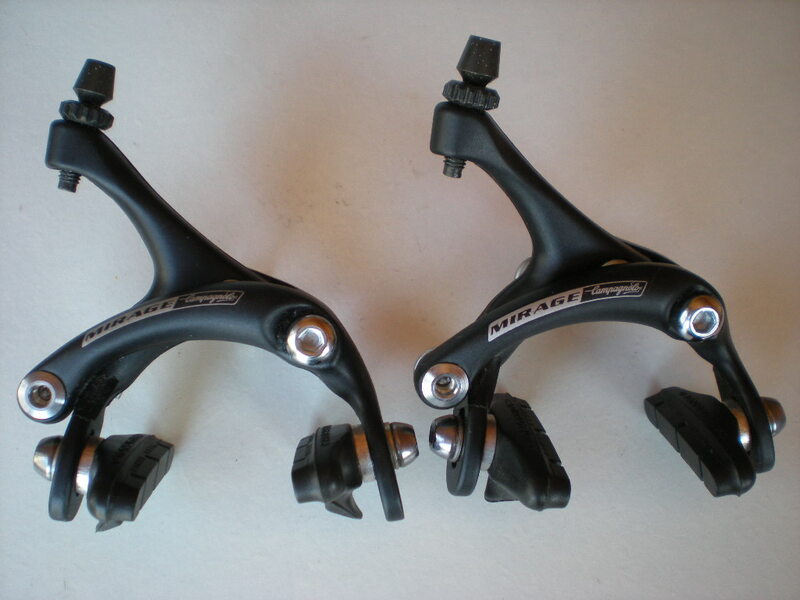 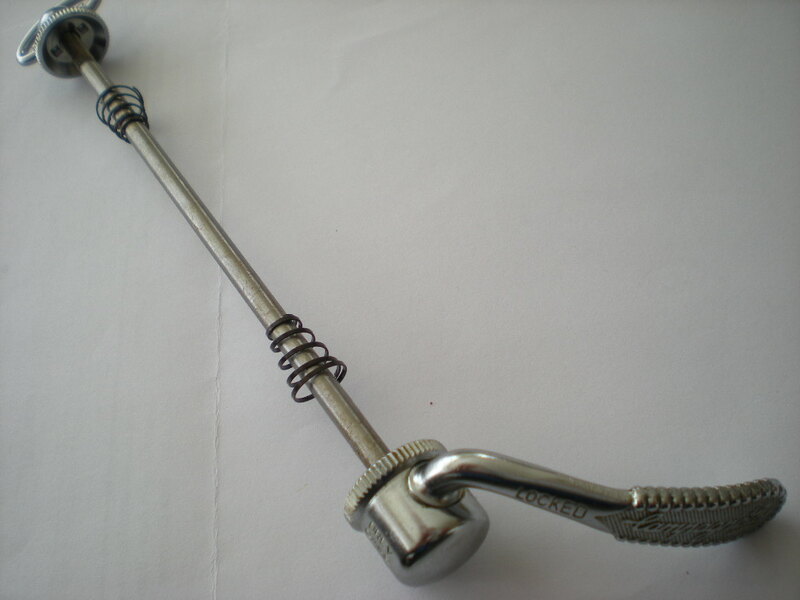 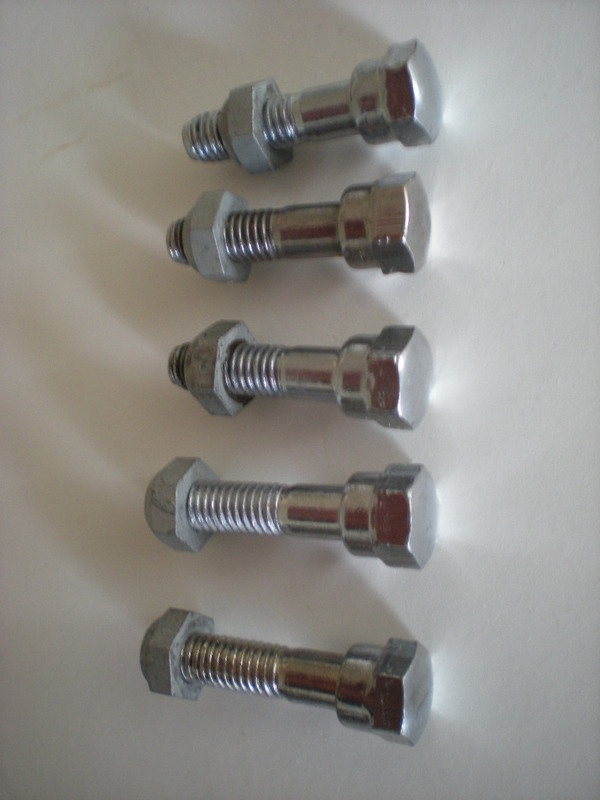 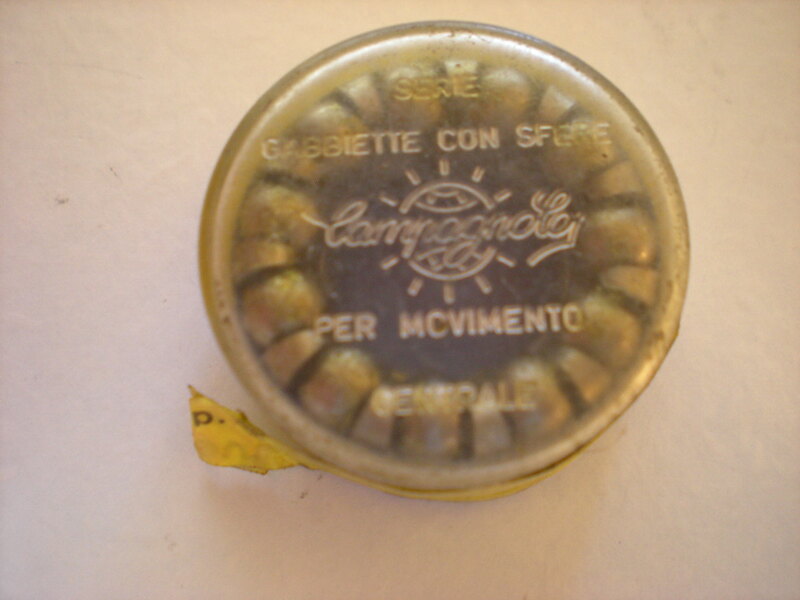 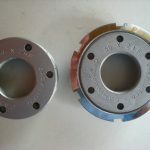 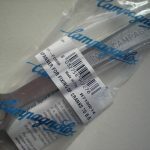 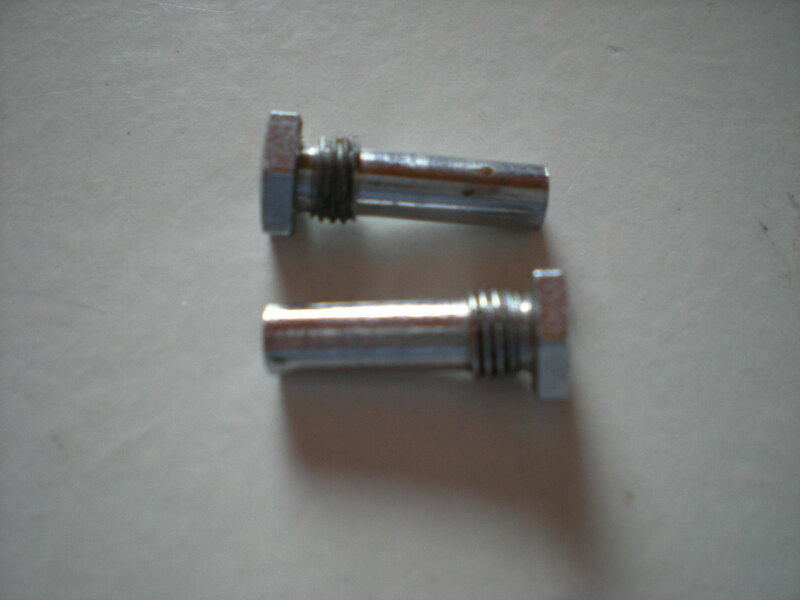 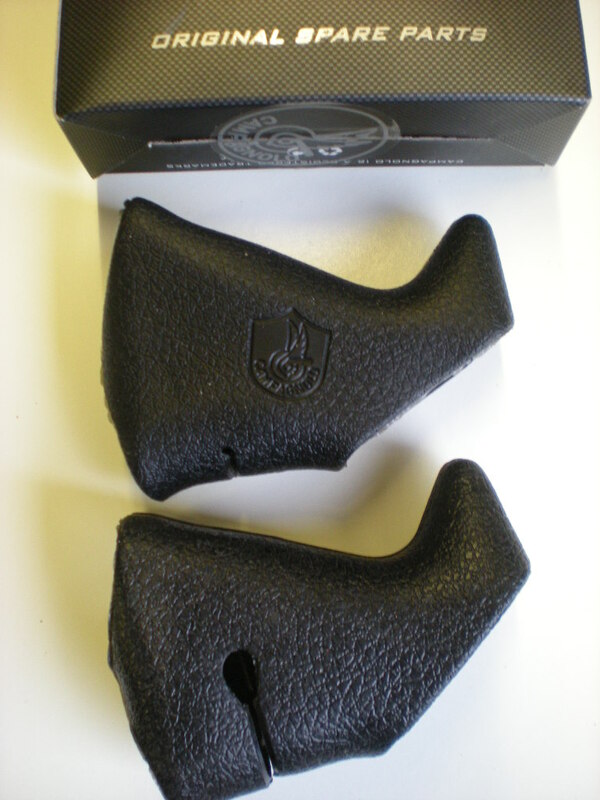 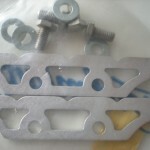 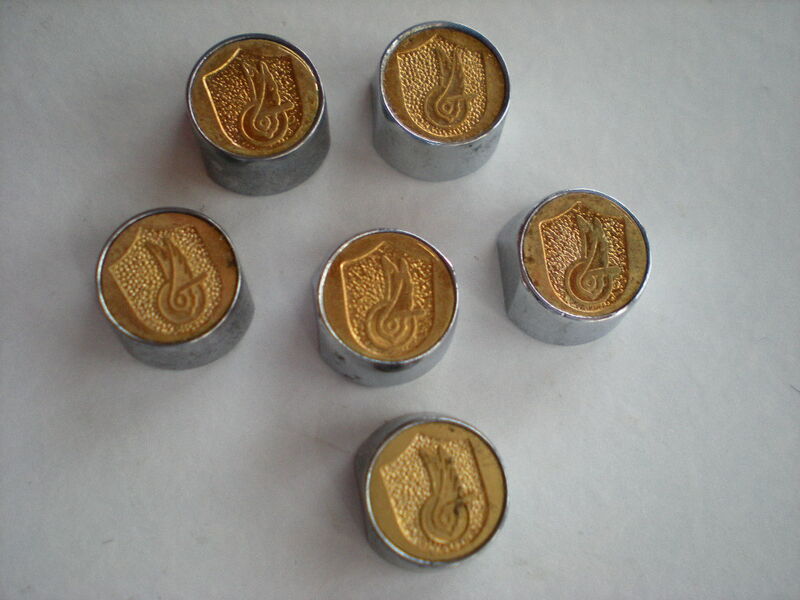 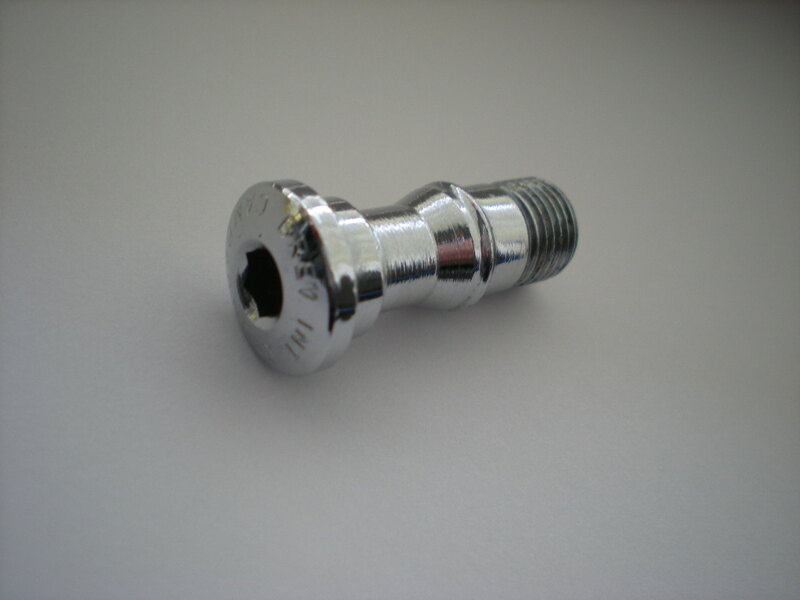 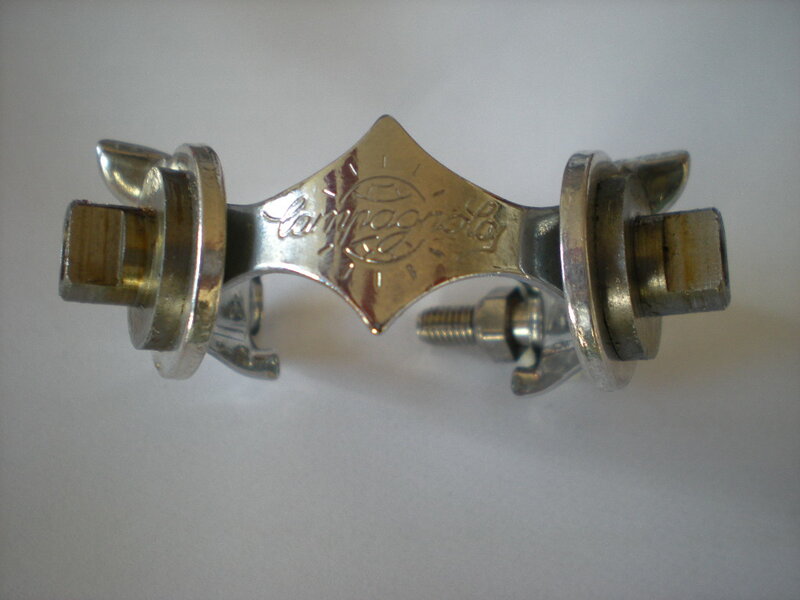 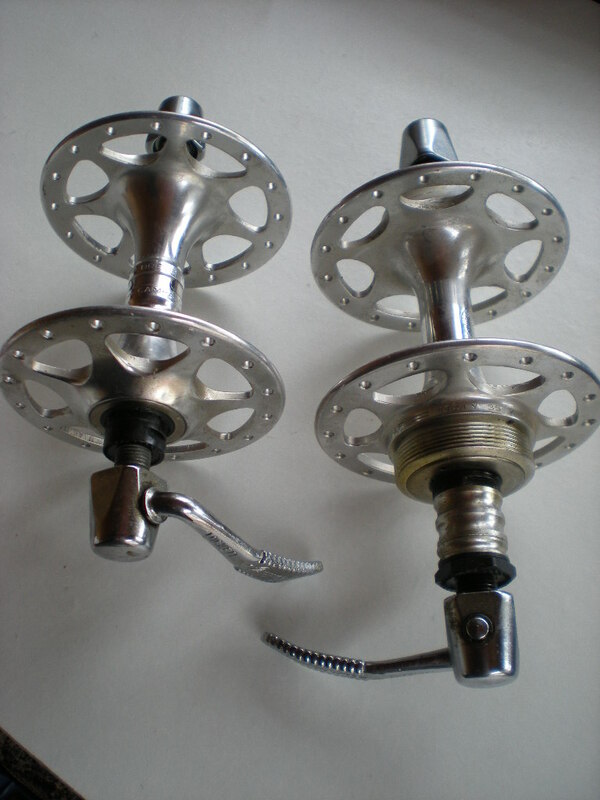 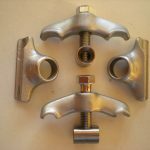 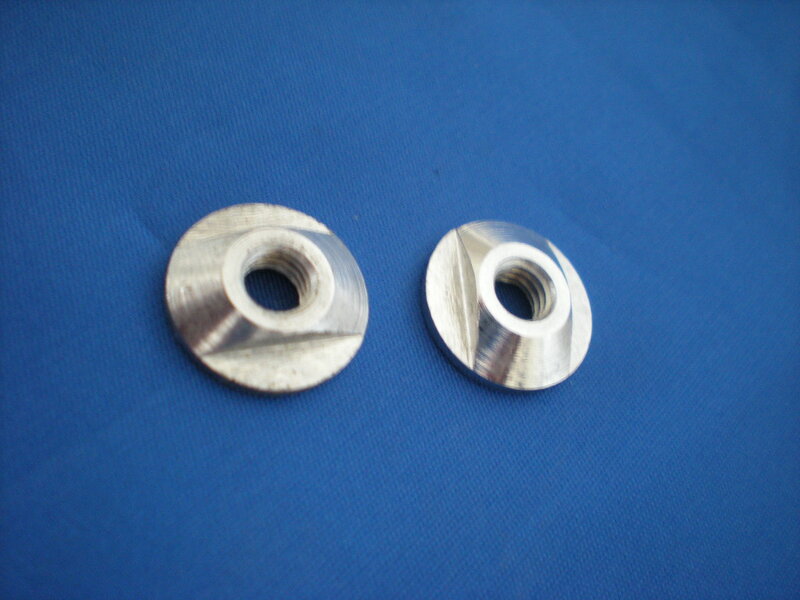 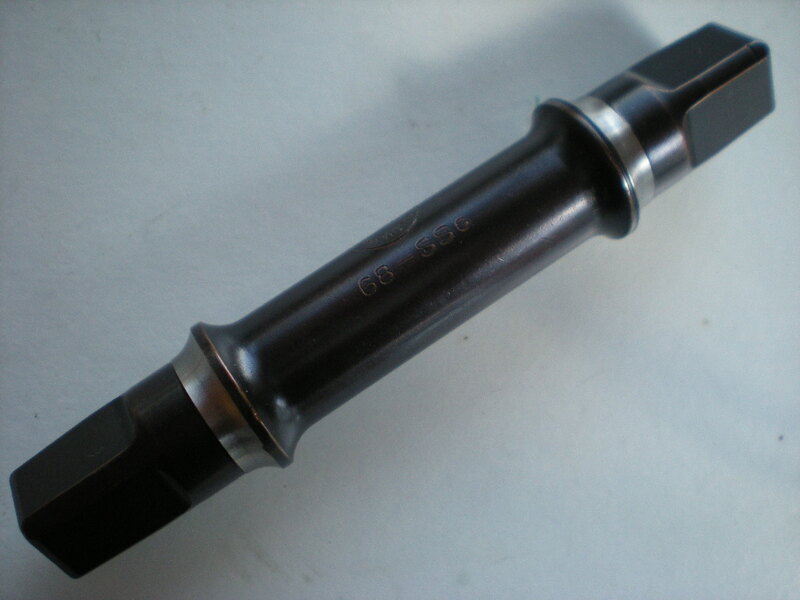 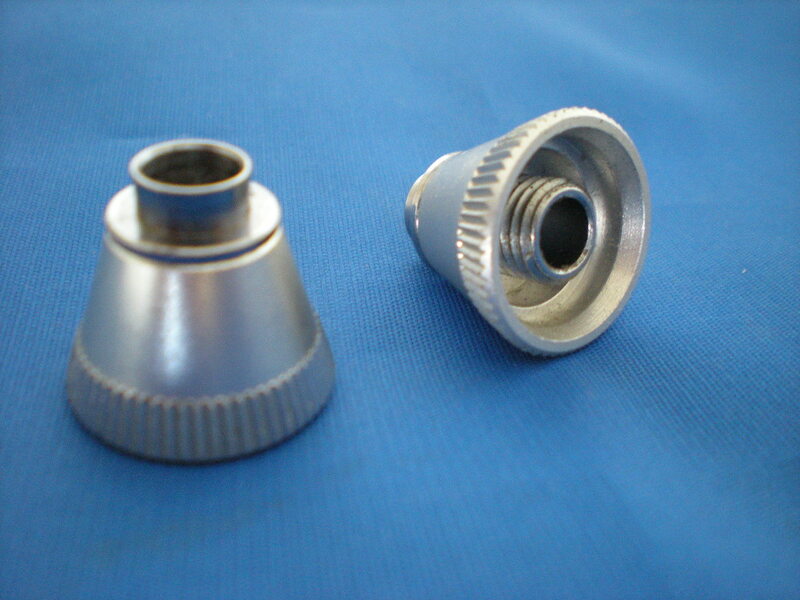 Supplied with Campa head #3346 to screw on if you wish.